Anyway, (not surprisingly) there’s always some good ribbing between friends, and many observations – and learning! So little “side notes” and lessons learned to the story that relate to the title of this page will be posted in blue. 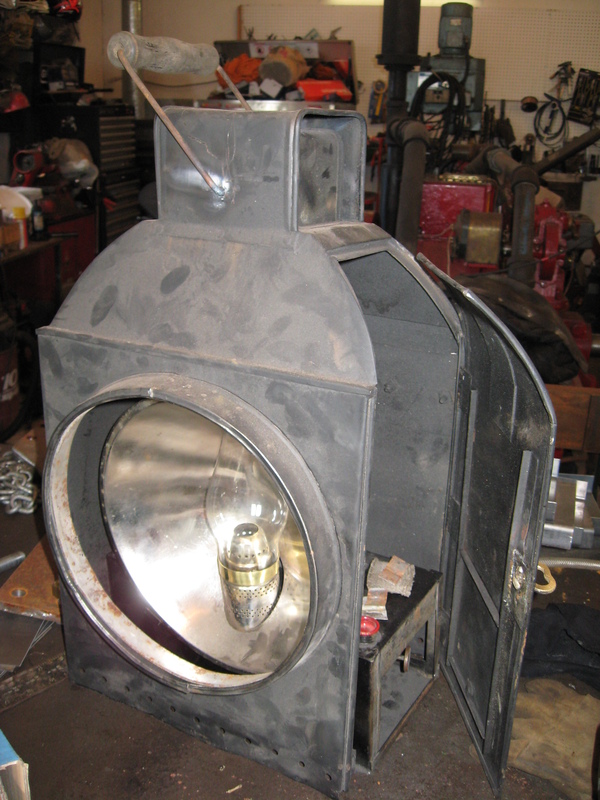 Here is how it stands, complete and ready for a fire! 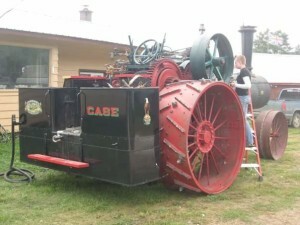 It’s a 1911 Case 75 Steam Traction engine! I’m also not sure whether to call it a construction project, a restoration project, or what! 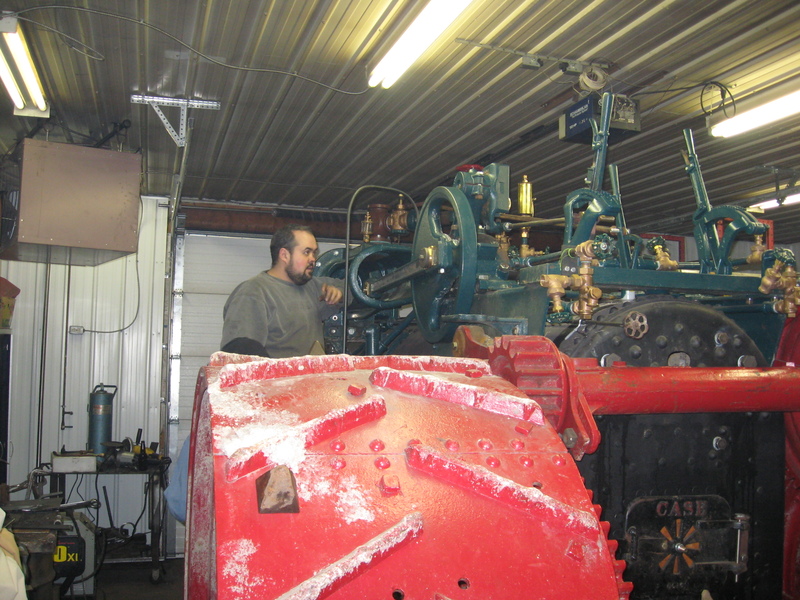 This wasn’t a complete engine when we started, nor was it even a complete parts pile. This engine simply didn’t exist until it was built. This probably marks the inception of this project. 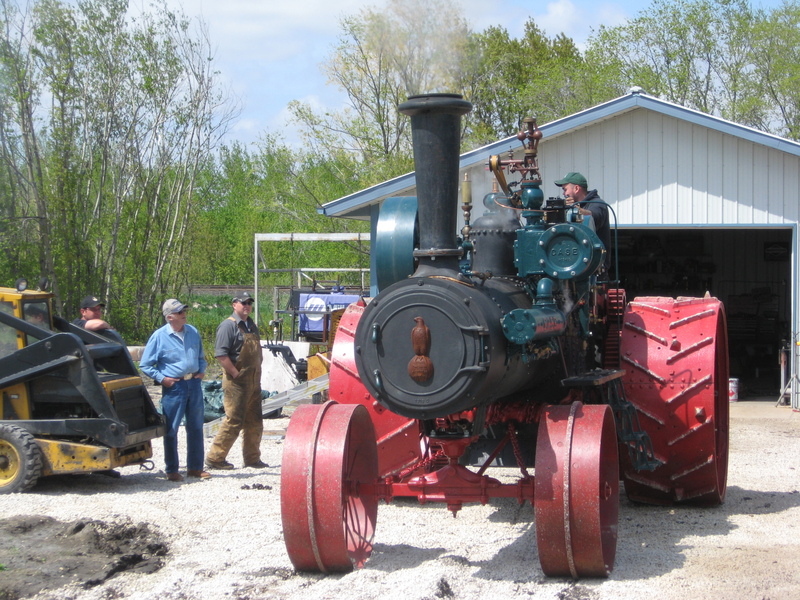 Garth wasn’t going to finish this engine, so it was looking for a home. 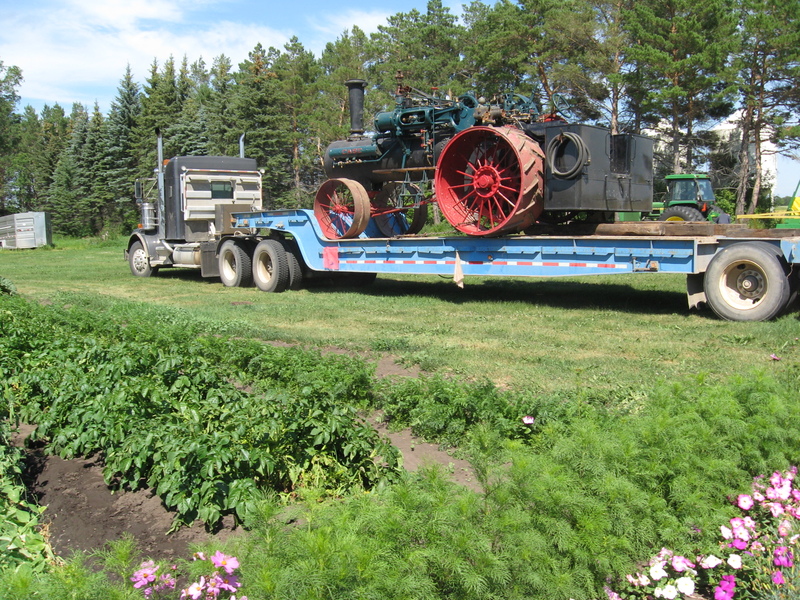 The cost to transport it to his shop was steep, and his interests were focused on other engines. So a deal was struck! 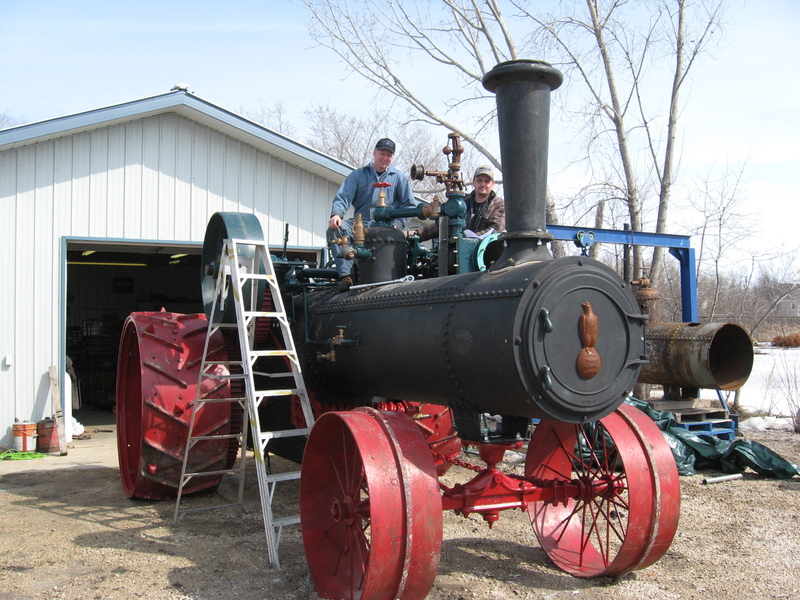 I know, you’re immediately going to say “but Rob, I thought you said this engine didn’t exist before guys built it!” Well, we used the wheels, heater, and the Baker valve from this engine as you see here, and many other parts Garth had gathered, but virtually nothing else. 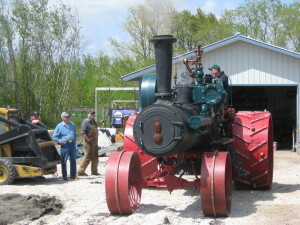 Garth was building his engine around a 1906 boiler which was in good shape for what it was, but there was no way to achieve decent operating pressures in the modern world of NDE. Also, the parts pile wasn’t complete! 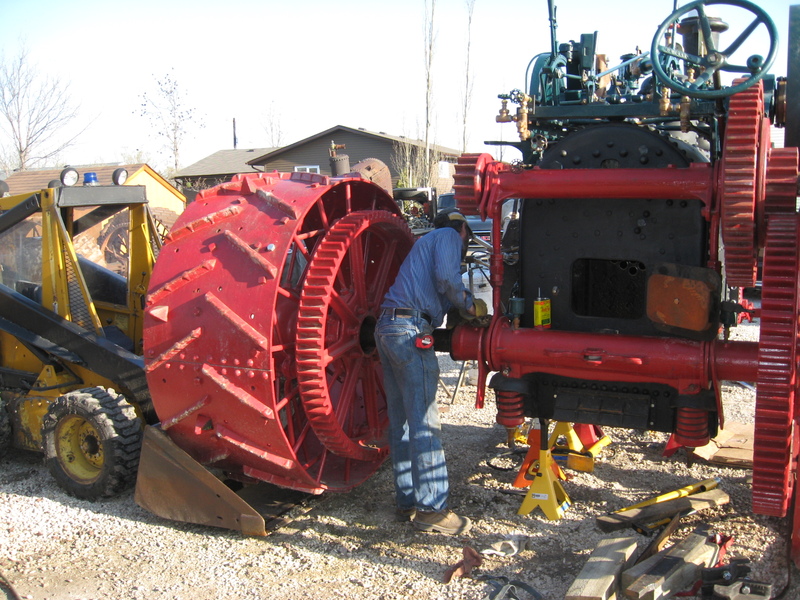 We were missing a complete upper canon and differential. This certainly was a huge step forward! 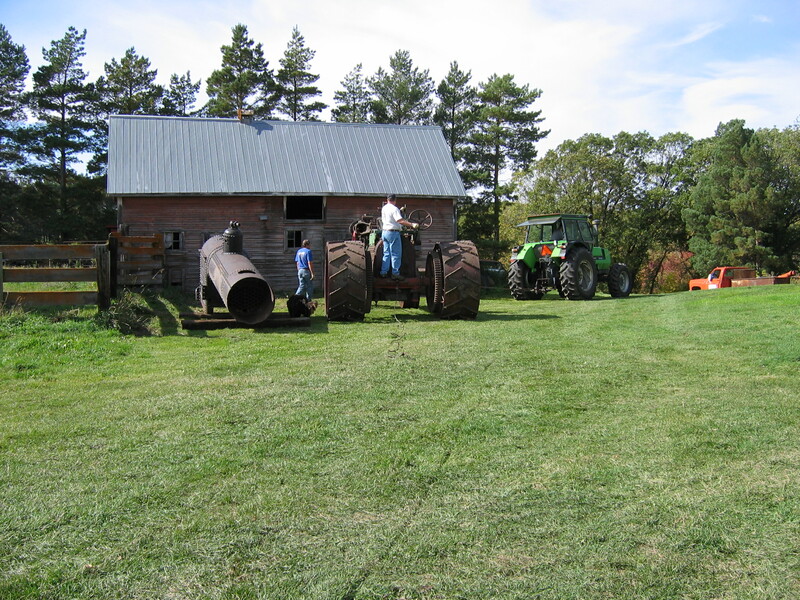 It was also time to move the parts from Garth’s yard to the farmyard. This was mostly performed on one overloaded trip. As is clear, there are many extra parts. 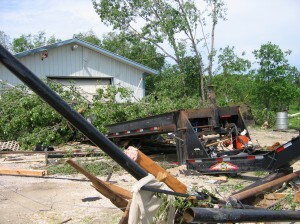 My first lesson learned was simple: just because you have room on the trailer doesn’t mean you should haul it! You just might be overweight! It seems that I have yet to actually take that lesson to heart. I have yet to actually learn this lesson, though.. I borrowed Lee’s trailer. I was really concerned about the weight, so I limited my speed to only 60kph. Luckily, the parts only had to be moved from Neepawa, so it wasn’t a long trip. 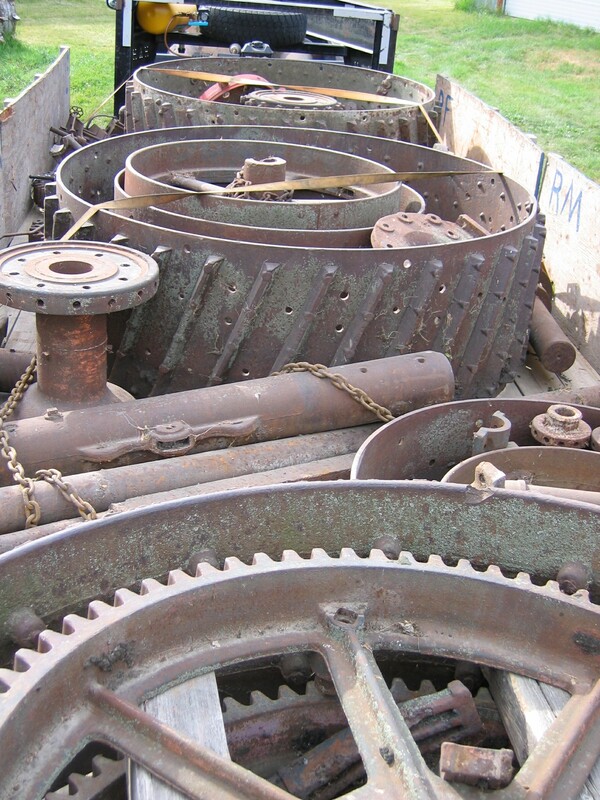 Just, if anybody has driven on Hwy #34, it’s anything but smooth… These parts were moved on the 20th. It’s time to move the rest of the parts home! Travis and his dad, Keith, helped out here! There’s only so much a pick-up can (should?) haul. Unloading and organizing took the better part of an afternoon. 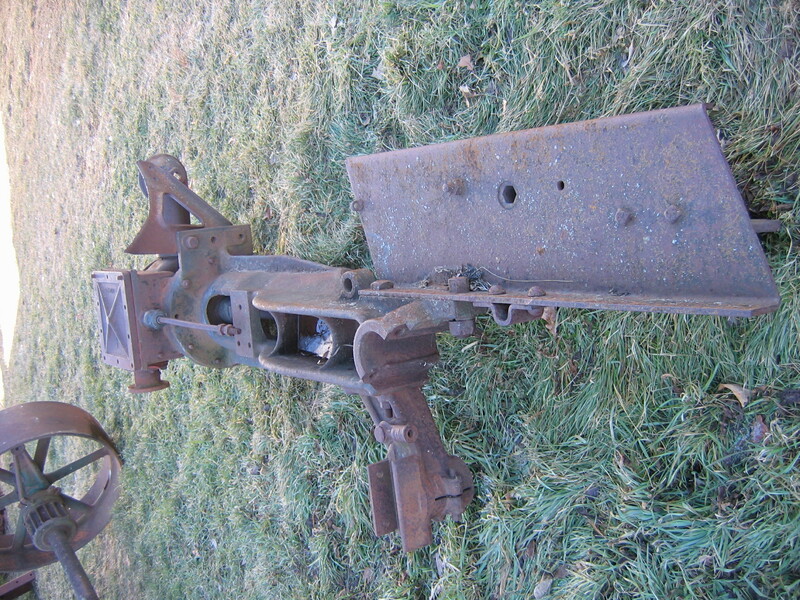 And a fair bit of convincing Dad that the parts would actually turn into something…! I’m just visiting Garth, this weekend. He took me out to visit an old friend of his. Nice collection, and we just added to the pile! 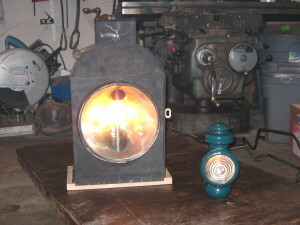 Now the engine also has a Case gauge, as well as a lubricator! Time to take some inventory. Time to start looking for the needed parts. And to do this, it seems like it’s often best to trade. So we needed to figure out what was needed, what wasn’t, and the condition of some parts. Some stuff was in great shape. 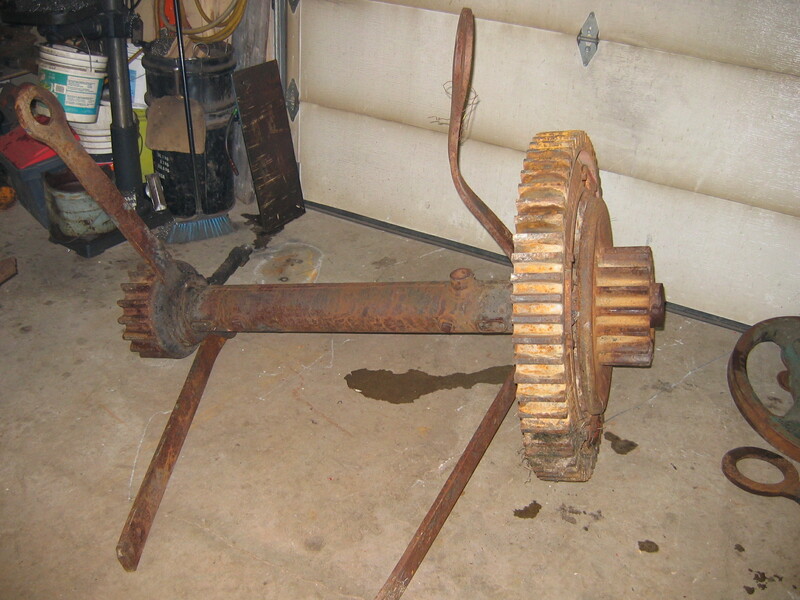 There was a differential gear that was new-old-stock. But I had 3 intermediate gears, none of which were great. The next few weeks were used up by making various phone calls. It’s amazing, here’s another thing clearly evident. Watch out for people who look to prey on those who they consider to be new to the hobby. While there are many people who honestly want to help you succeed with your restoration project, there are (a few) others who clearly have other selfish motives. I was told I should call up one Doug! After a few phone calls a trip was made. Well, he certainly did help out! These are some of the parts he had that I needed. Being new to a hobby is a relative term. 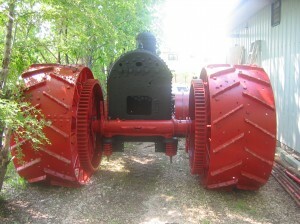 Dad was a director at the Austin Museum, so I have been crawling over these steamers since before I was in Kindergarten. I’ve also been volunteering, and was a student employee at the Museum too. 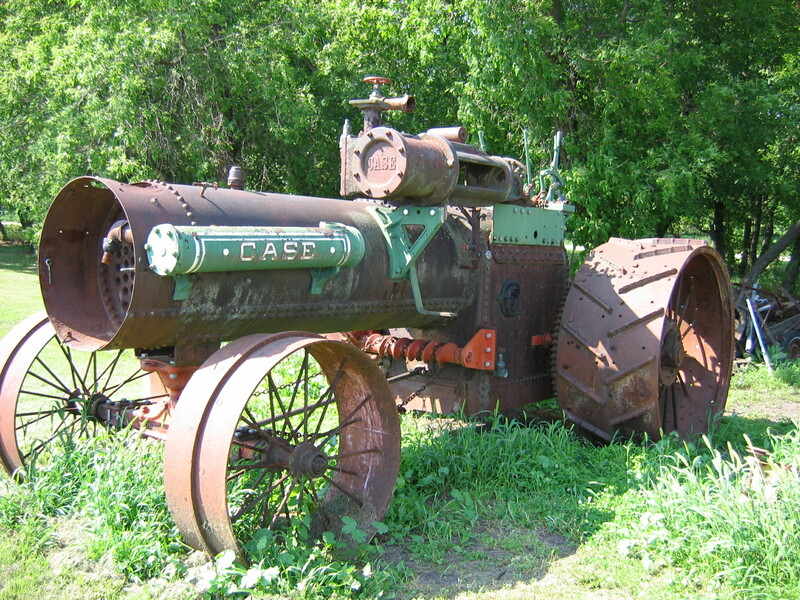 I’ve also ran the Austin Museum’s Case 65 since it returned to the grounds. And I’ve helped out at various other shows too. 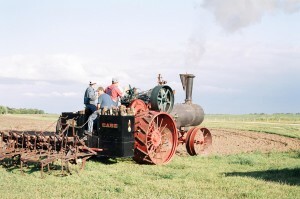 But even to this day, after running these things for over 20 years, I’m still considered new to the hobby. Time to start on the project! 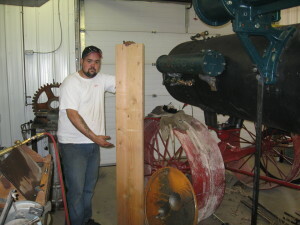 Another friend, Lee, offered up his shop for the project. His shop is well equipped and heated so it was a natural choice. 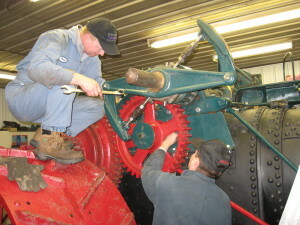 So starting this day: myself, Lee, and Bruce started the major wrenching. We got the engine bed apart. Actually, we eventually ended up pulling apart two and used the parts I originally had, not those Doug had provided. 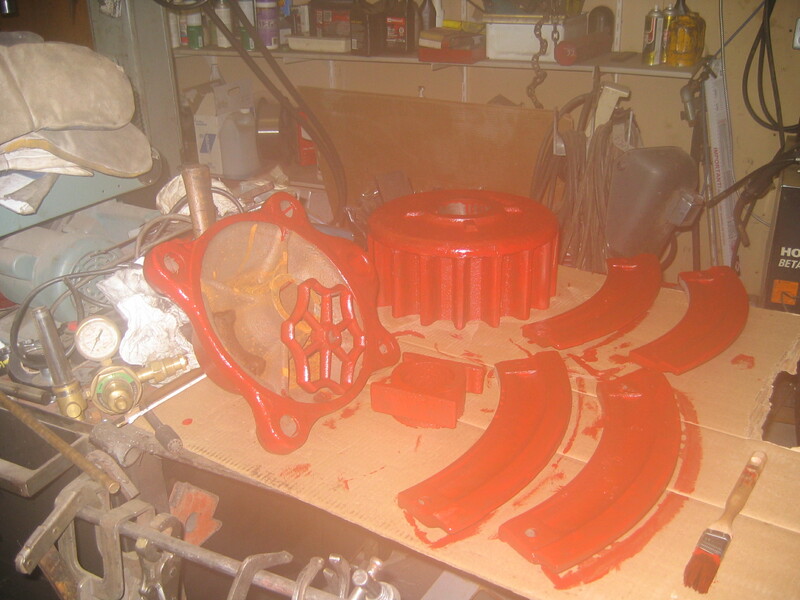 My engine bed appeared to be in decent shape (where-as Doug’s had a badly worn crosshead guide – beyond repair), and my cylinder definitely needed bored (where his was good). 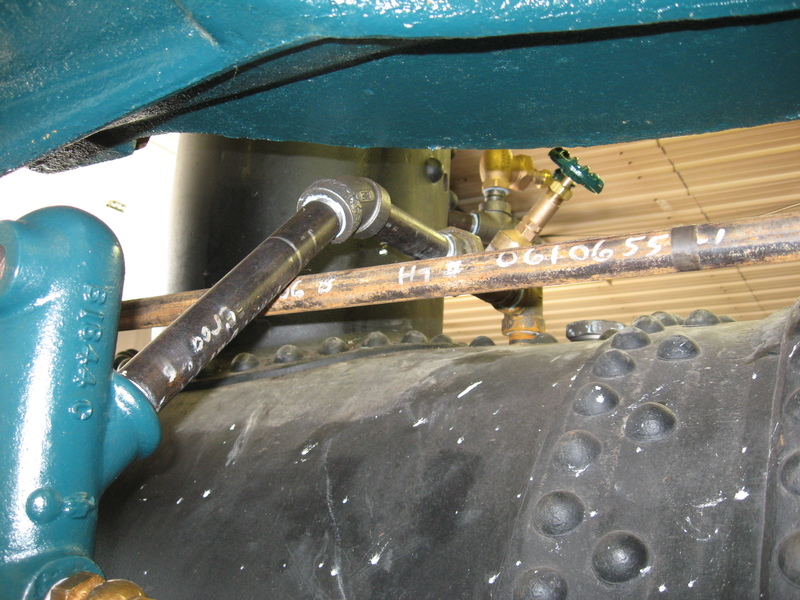 I knew we were going to bore the cylinder so it made sense to use the worst of the two (actually 3 if you count the cylinder off the 1906, but it was almost perfect). 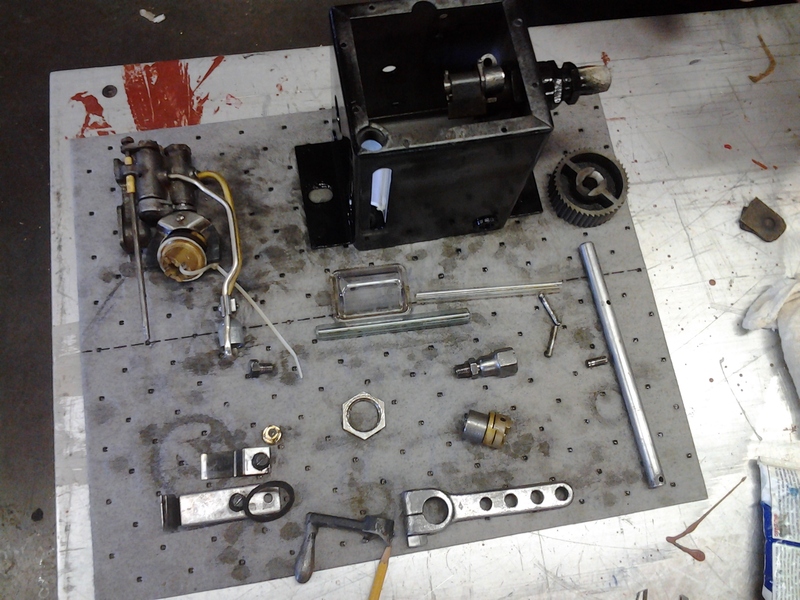 All of my prior projects had taught me an important lesson: When in doubt, machine or rebuild a part. Never just reuse it because you’ll end up doing it anyway, sometime in the future. It takes more time and $ up-front, but it always pays off in the end. And this project re-enforced this lesson time and again – there’s going to be a long list of parts we thought looked great until we measured. What a way to end off the calendar year! Since mid-November, it was tough to get back to the project. Elie is an hour away, we’re into the holiday season, and it was just tough for all of us to coordinate. But we got more work done. We pulled apart the crankshaft assembly. 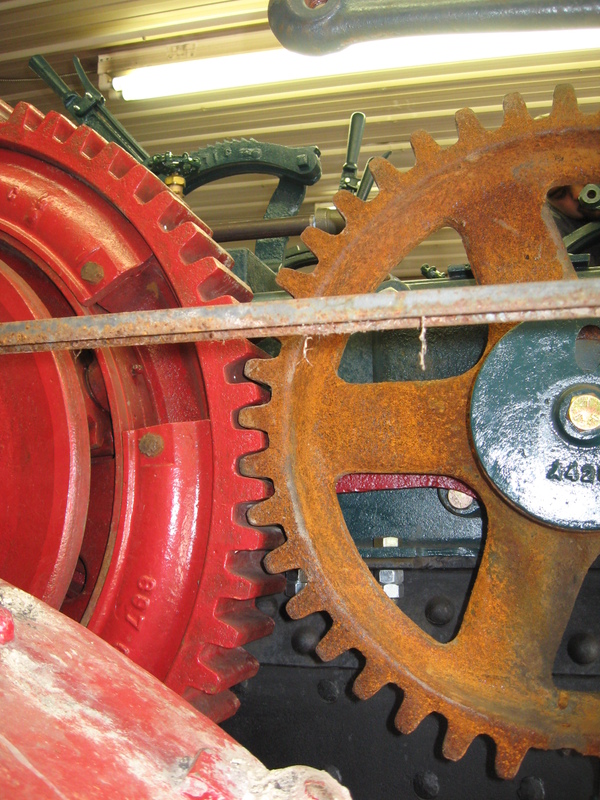 The flywheel was great, and even better, there was very little (negligible) wear on the crankshaft or crank pin. 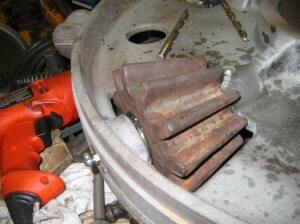 The clutch assembly was a mess, but the pinion was in great shape too. Here, Lee poses for the camera. Vanna White, he is not! 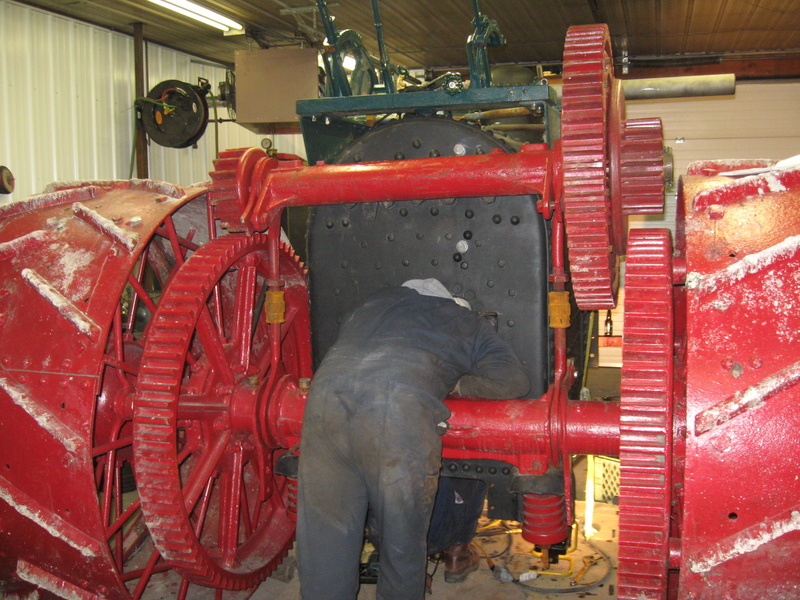 More disassembly! 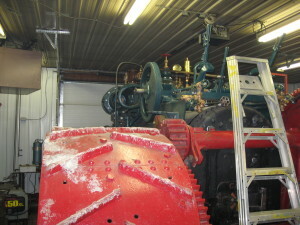 Time to attack the pedestal, dome valve, and differential. Well…we didn’t get much further than pulling the stuff into the shop…insufficient tooling. Let’s try this again! Okay, we got the differential apart this time. Here, you can see Bruce and Lee. 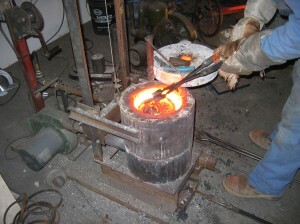 Lots of heat, tapping, and beer was required! 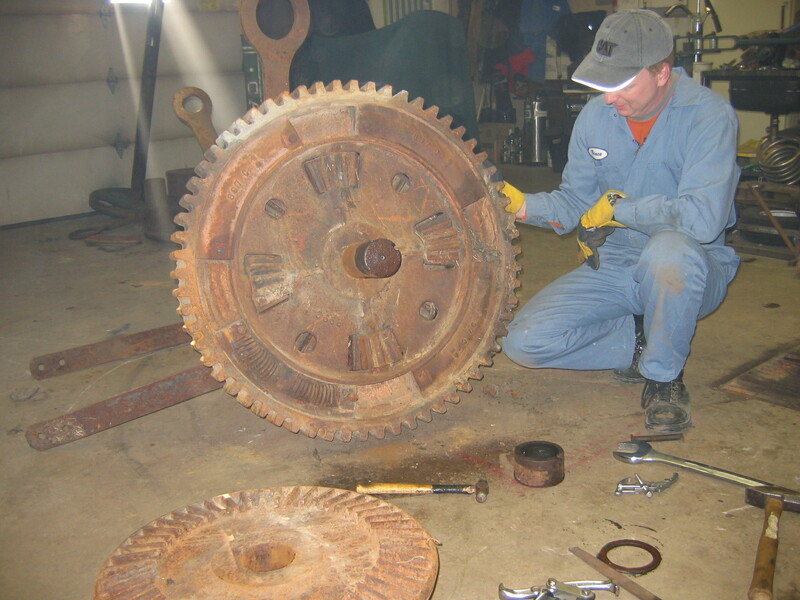 We were happy to find that there were no broken parts, including the differential springs. There was some wear, but that’s to be expected. 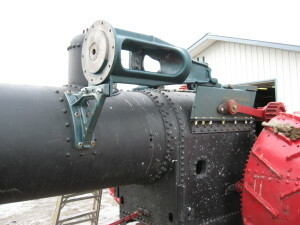 The babbit on the upper cannon will need redone. The outer platter gear definitely needed bushed. Lots of work is taking place now. 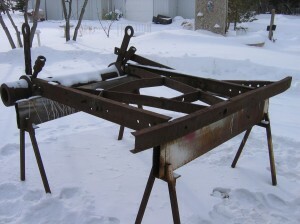 I had borrowed a rear hitch frame (to use as a pattern) from Doug that we needed to reproduce. Plus we needed some parts off of it. 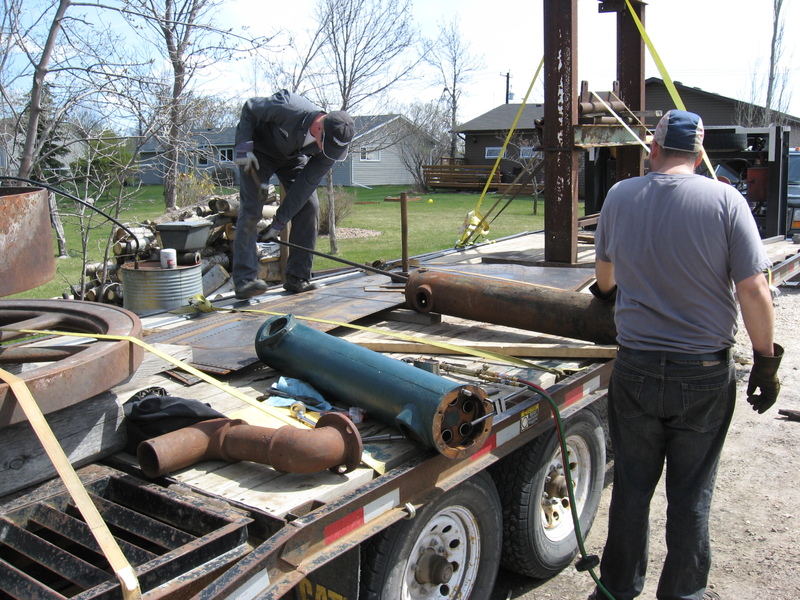 And we were sandblasting parts too. 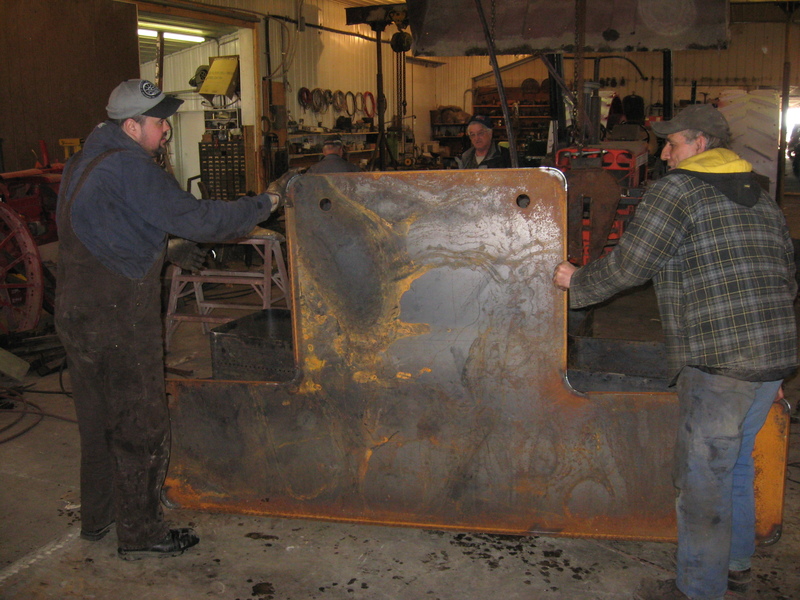 You can see Gery (the partner on the project) busy sandblasting. And as you can see, we also brazed a bunch on the clutch assembly. It showed a fair bit of wear. I’ve had enough experiences with sloppy Case steamer clutches that I certainly wanted to avoid that on this engine, if at all possible! This was a productive day/weekend! 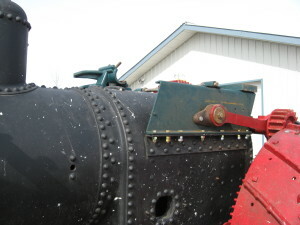 The upper canon was the target for action. 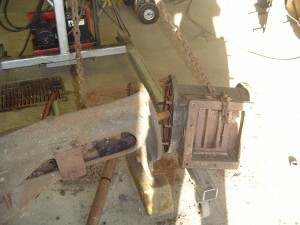 The pictures here show the general process. We started the day by melting out the old babbit. 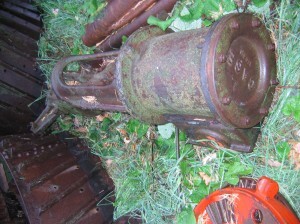 It was interesting, there were a lot of impurities, but no surprise, it must have seen a lot of use. We didn’t reuse this babbit. Then, we sandblasted the upper canon. 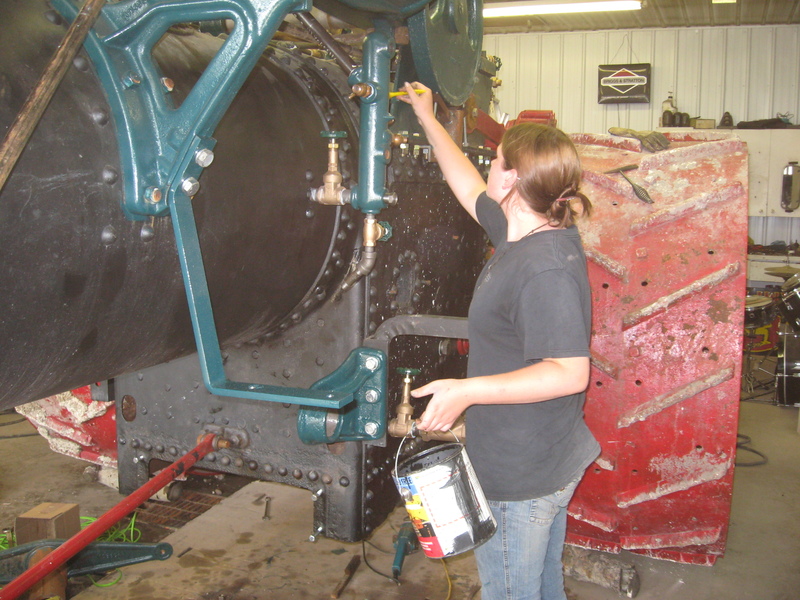 In the end, every single part on the engine will sandblasted, including the boiler. 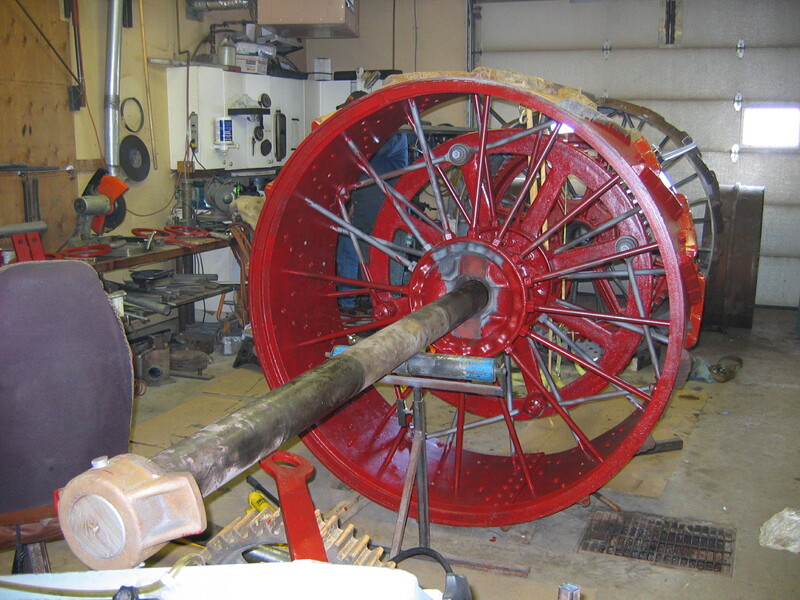 The shaft had already been checked to be round, straight, and true, so that was good. 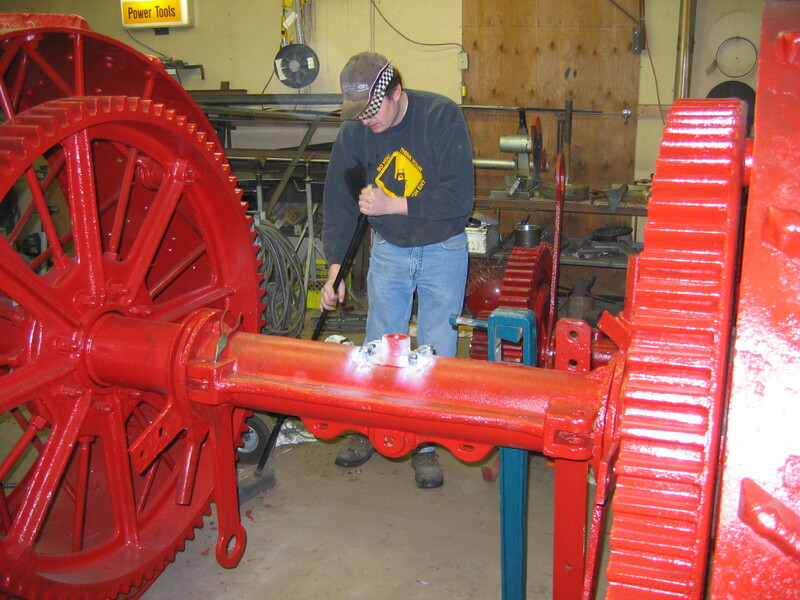 Here, you can see Lee applying newspaper to set the bearing clearances. We followed the instructions we had found. 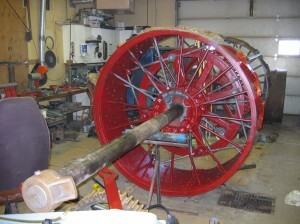 In the 4th picture, you can see the axle ready for the bearings to be poured. Lee had machined up some jigs to make sure that the axle was perfectly centered in the upper canon housing. 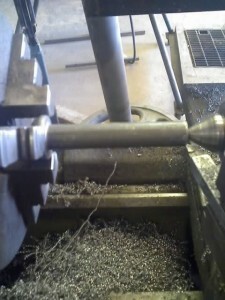 Some people may figure that “close is good enough” but when you have a lathe, it’s easy enough to make it accurate. 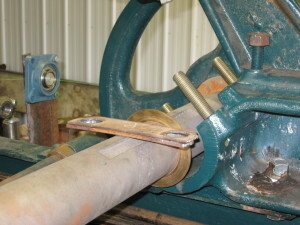 We also did something else: I believe in thrust washers, so his jigs purposely left provision for a thin layer of babbit on the end of the housing to act as a thrust washer. 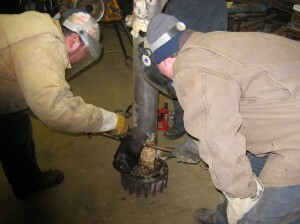 In the 5th picture, you can see us pouring the 2nd bearing. 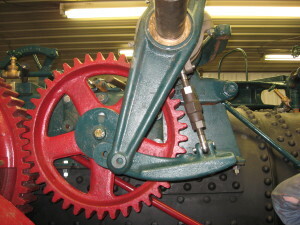 The pinion gear is only there to help balance the assembly. This, however, may not be WCB approved attire, but it got the job done! We filled up the babbit to the level of the hole. The housing also has provision for a slot to hammer out the key for the left-hand pinion. We opted to fill that in with babbit to keep the crud out. 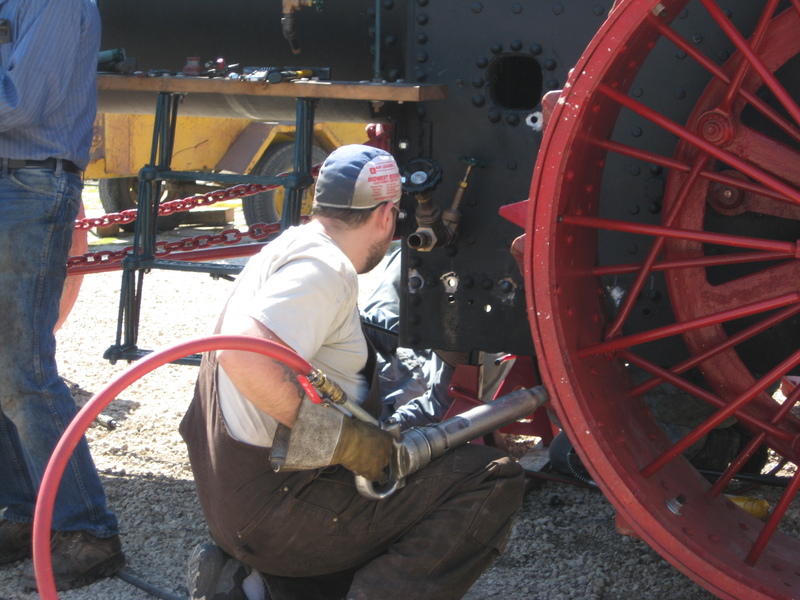 If we need to remove the key, we’ll weld to the end of it – something that couldn’t have been done 100 years ago. We also used the old tried-and-true approach to using standard household flour to retain the babbit. And you know what? It works – as well as anything! In the last picture, you can see the axle assembly being pressed apart. As the bearings cool, they shrink, making it very tight! 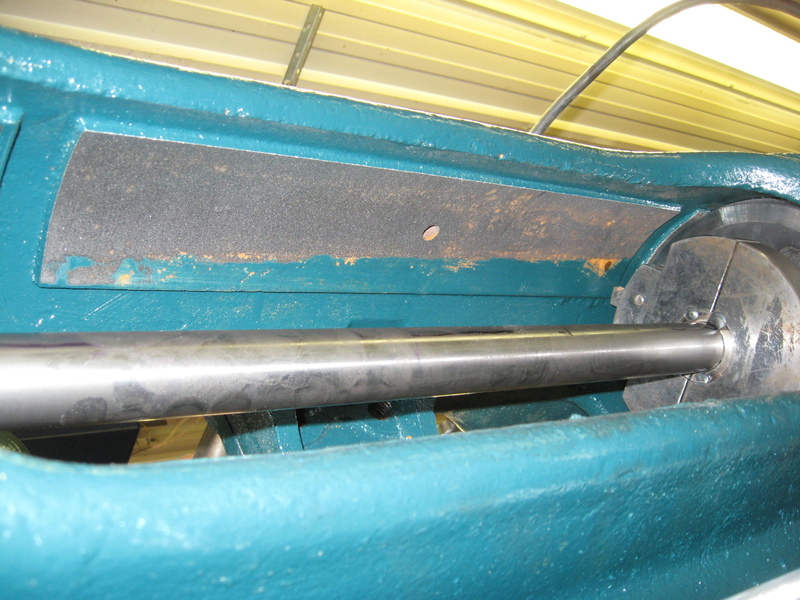 It took a decent push on the hydraulic ram to push the shaft out of 2 long bearings. You’ve probably figured out we’re tackling a few different projects at the same time. This lets us keep the project moving forward while we gather tools, information, and parts. Here’s a good example. Last weekend, we worked on the upper canon while a big socket was sourced to pull apart the main dome valve. That dome valve didn’t want to let go! 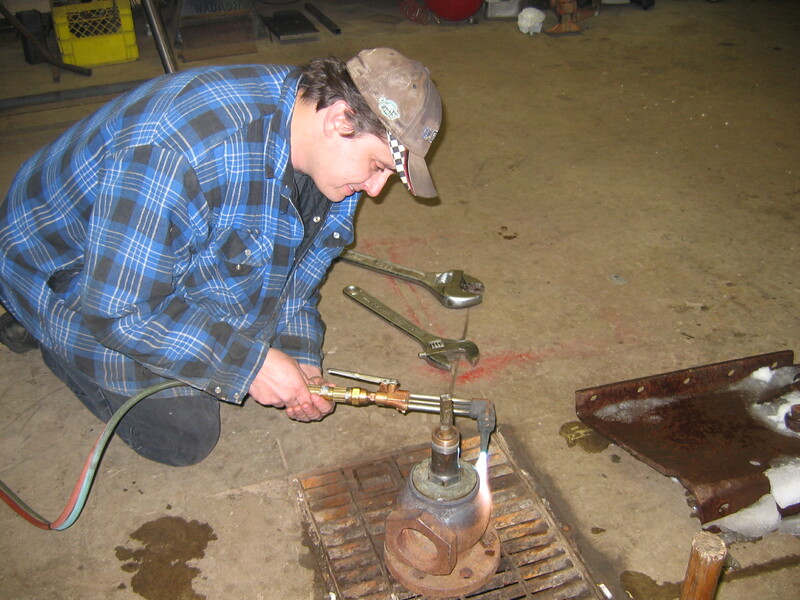 So far, we had broken a few wrenches and applied a lot of heat. 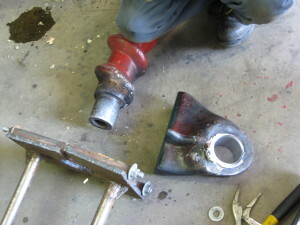 Well, that socket turned into the tool shown here. 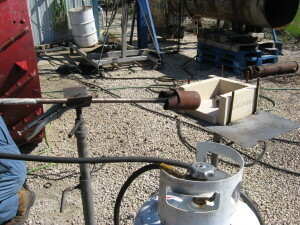 The valve did come apart, but not after bending that long snipe! 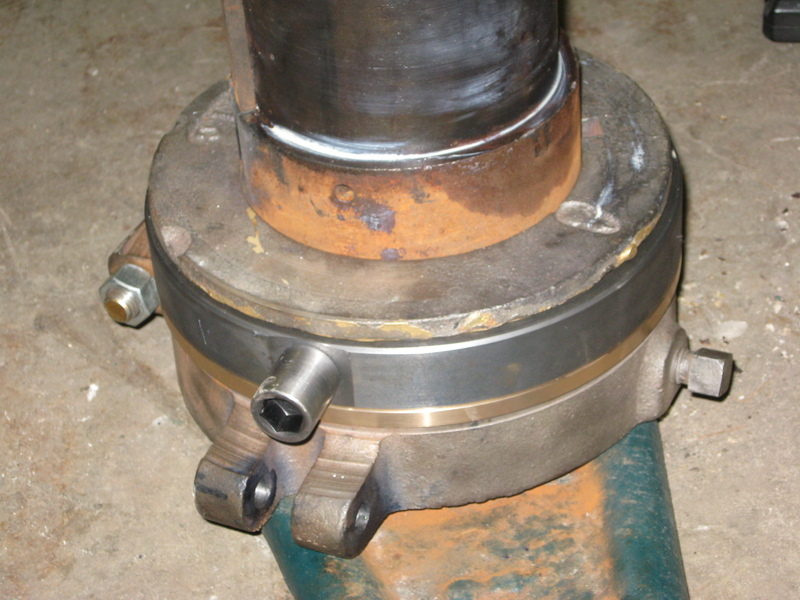 In last week’s entry, I mentioned how I like thrust washers. 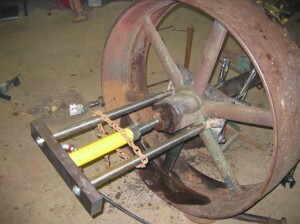 Well, we had hoped to use a babbit thrust washer poured with the bearings. The plan was good, but the thrust surface didn’t survive disassembly. 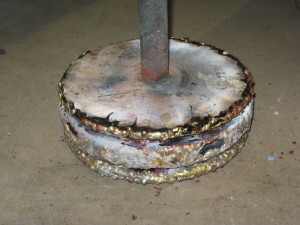 Here you can see the brass thrust washer that we ended up using. In reality, it probably doesn’t make a big difference, but I treat it as a “nice to have” that the Case could have put in but didn’t. We won’t get a good colour match off the original paint. Blue and yellow pigments are going to fade at different rates, inevitably making it more blue than it originally was. We found some good samples of green on our flywheel, but we aren’t taking it as gospel for this very reason. 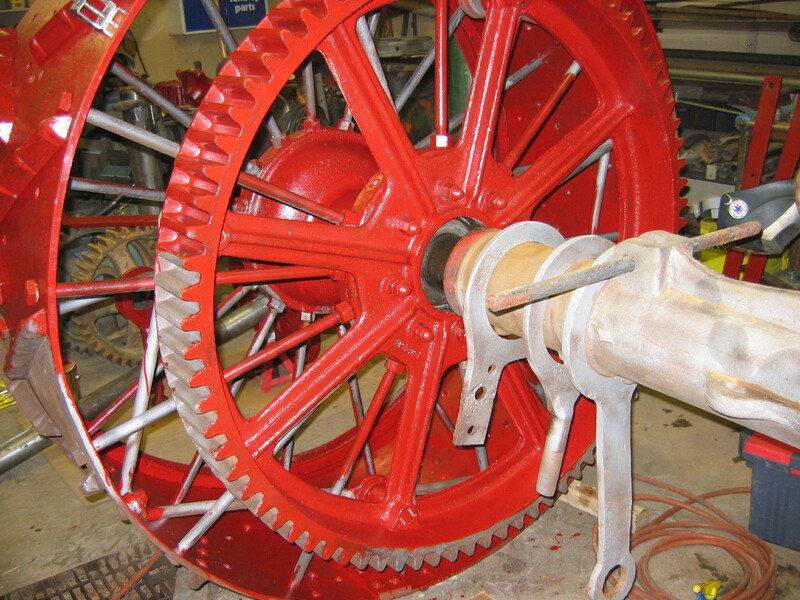 Manufacturers can’t 100% reliably colour match paint in large quantities today! There was certainly variation 100 years ago. People’s memories change over time, and many people have troubles with different shades of blues and greens, so I don’t get excited about 3rd-hand stories about what some fanatic’s dad’s old-timer friend who says what he remembers is correct. I like my green! I hope you do! I scoured the internet forums, asked tons of people, and aimed to get as close as we could to what we thought could be right, and then fine-tuned it to what we liked. But if you want to use another green, then that’s great too! 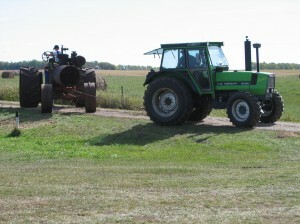 The shade of green doesn’t affect the engine’s operation. So let’s be happy and move on. 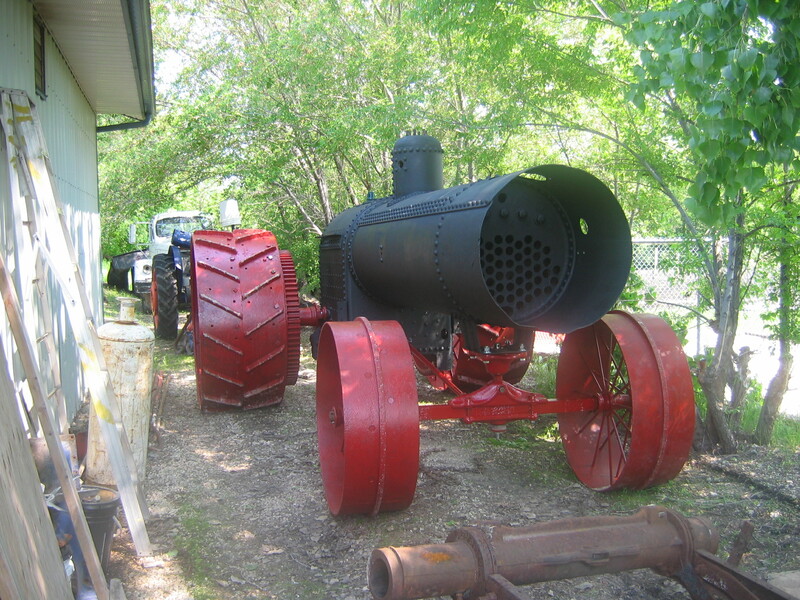 Well, there’s just no way our little sandblaster is going to keep up. Time to call in the big guns! So off we go to some friends of Lee’s – the local colony. Lots of blasting, done quickly and on the cheap, means the rest of the weekend was painting parts and working on the rear wheels. We also had a chance to machine up the platter gear pinion. 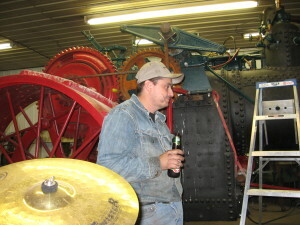 The shaft had already been turned (before we poured the upper canon), and there was some slop in the platter anyway. So it was turned and bushed to fit. Typical for what we’ve found out about Case, I’m told that the hub wasn’t perfectly centered to the platter gear anyway, so it’s a good thing we took the time to do it right. We did a trial fit, to make sure we were happy with how things were going to go, and that the links were snug and everything. Then I made Lee pull the lower axle shaft for a 3rd time! 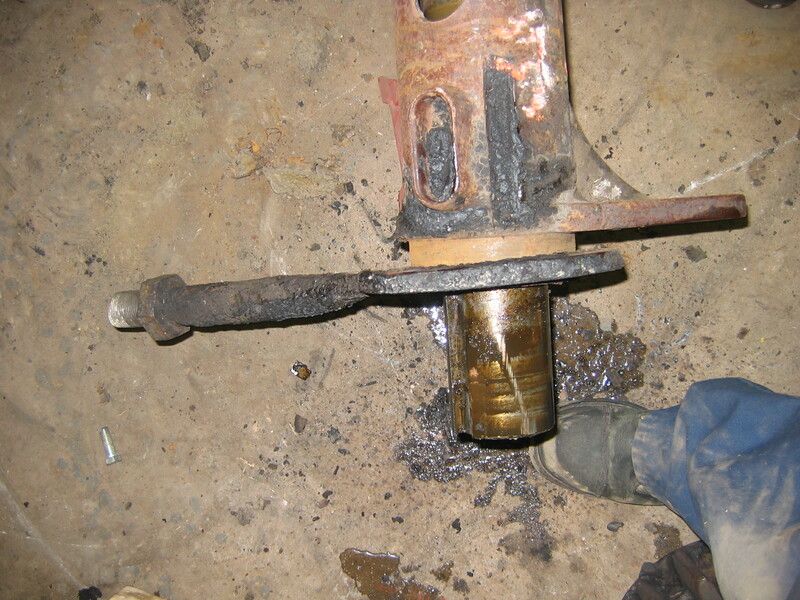 The right-hand hub was a bit loose on the shaft – the shaft itself was good, but the hub showed some wear (or was just originally machined loose), so we bushed that to tighten it up. I’ve seen lots of engines with leaning wheels and it detracts from the restoration so that wasn’t going to happen here! We did plan ahead, though. 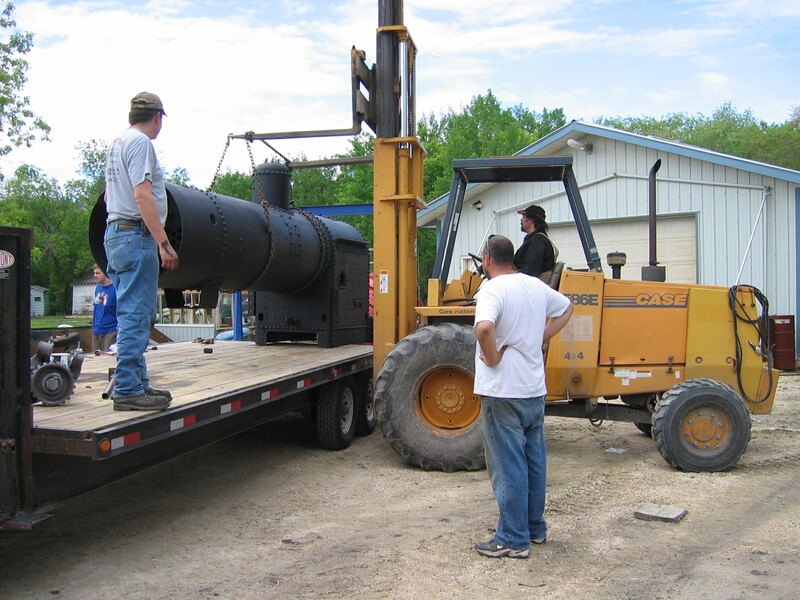 We assembled the upper canon too, and made sure it was 110% happy. 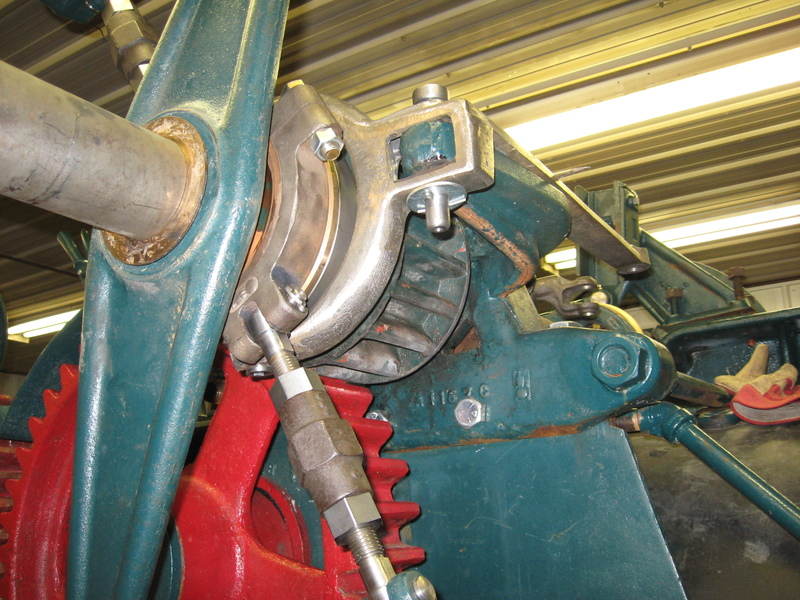 We spent some time figuring out the proper orientation of the links (and correcting how one turnbuckle link was assembled before), and installed those thrust washers. We then took careful measurements and calculated the proper shims for each wheel. 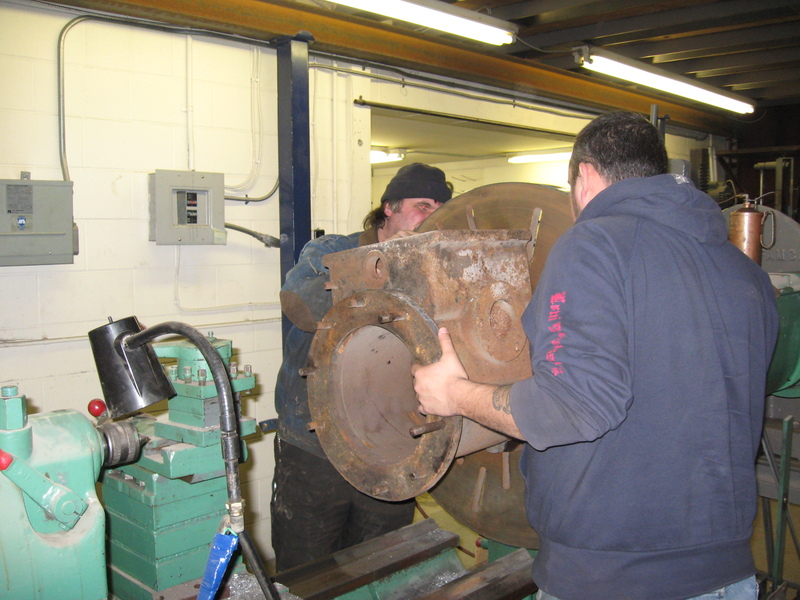 That careful work paid off – we were bang on, perfect, and we’ve never had to come back and adjust the shims since the engine was installed. 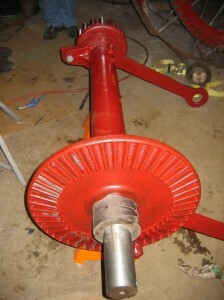 We also had to finish off spoking the rear hubs. Garth had respoked most of them already. He just used straight 1-inch rod, so we just continued to do the same. 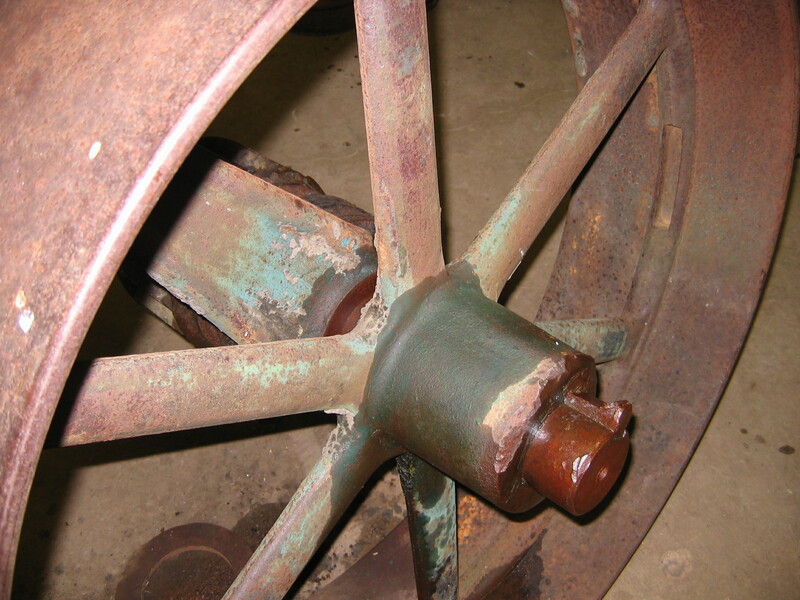 This, as it turns out, appears to be another known weak link in the Case design – small spokes regularly end up bent! 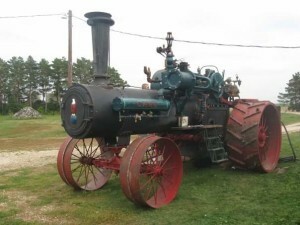 Case upsized them on later engines, and ran more, heavier spokes on the road wheels but cheaped out on the farmer’s engines. 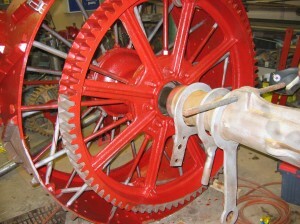 To be correct, these spokes should be upset at the threads. But with the wider (30-inch drivers) creating more leverage, it made sense to just leave them the full 1-inch diameter. It may not be anatomically and historically accurate, but at least I shouldn’t have to fix them in the future. Well, the rear axle is well on its way. We had great bull gears (that Garth had originally installed), there was little wear on the lower canon, the upper canon was going together, so we switched focus to the front axle and boiler. Remember that lesson earlier about “just do it”? Well, we had a few old timers suggest that the original brass plugs are just fine. They’ve lasted this long! And you can’t get brass like this today! 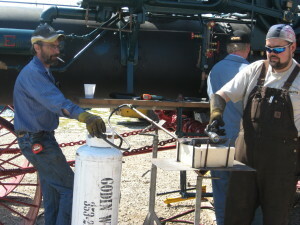 Well, you can see Lee cutting the tubes in one picture here. Another is our level of success in extracting these “great” original brass plugs. All but 2 came out in pieces. For the price of a plug, and how these literally disintegrated, I don’t know why anyone would cheap out here. 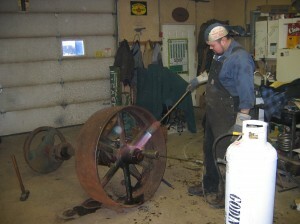 Here, Lee’s heating up the axle for to straighten it. I must say that those Caterpillar mechanics sure know how to swing a hammer! There’s no entry for last week. 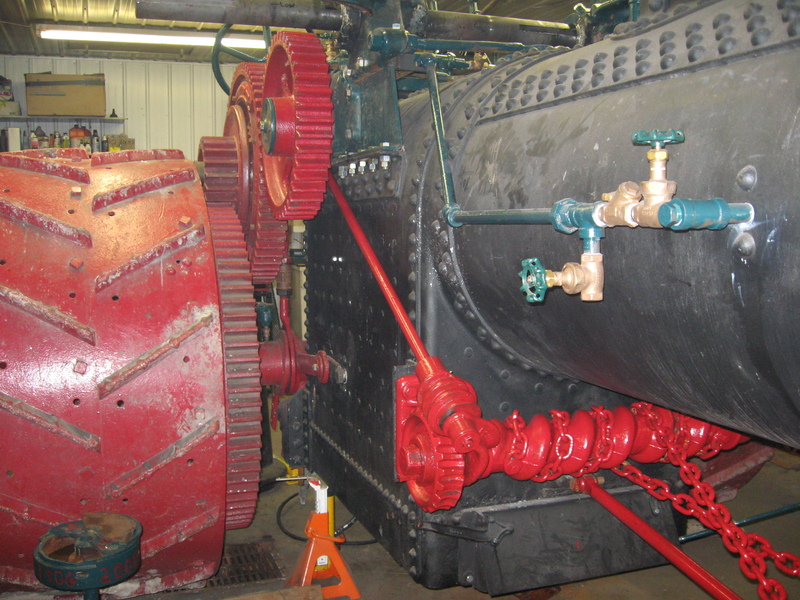 We were still working on the project, but it was more prep for the boiler repairs. 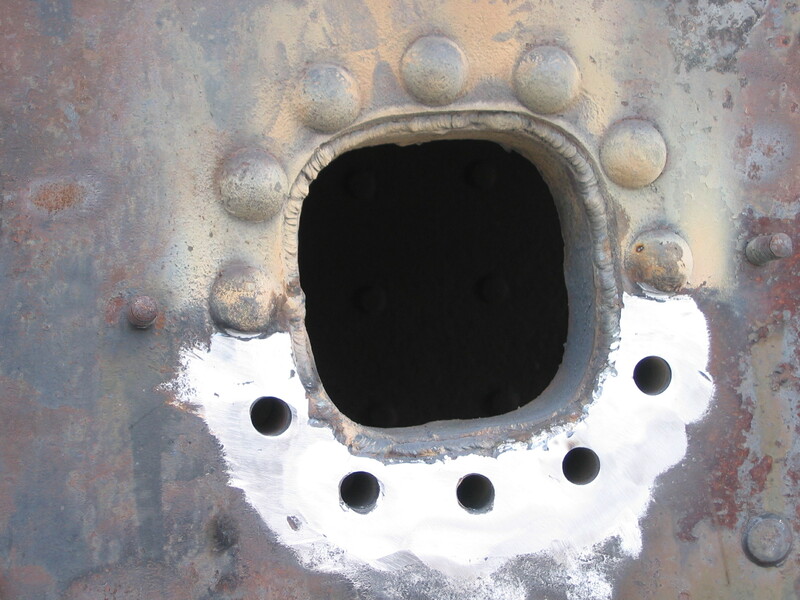 We found a few thin small spots in the firebox, and around the front handhole, all of which can be repaired with pad welding. I wasn’t that happy with my inspectors, though, since they want some crown stays welded even though the plate material is still over 0.300″, and there’s no necking on the stays. 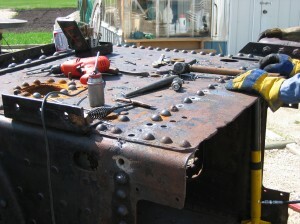 We also had to replace a variety of rivets. We had already decided to do this voluntarily, though. It appears that there is virtually no water-side corrosion (which is good), but someone in its past neglected to clean out the ash, since there’s a lot of ash corrosion. Most of this is limited to rivet heads in the OG curve, and the bottom half of the peep hole, though. 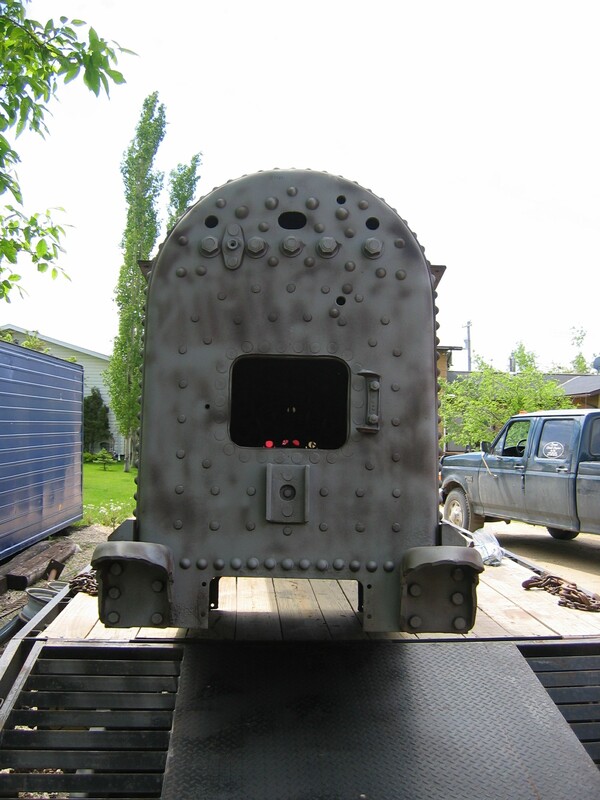 So I rented an air hammer and we popped out the decayed rivets. 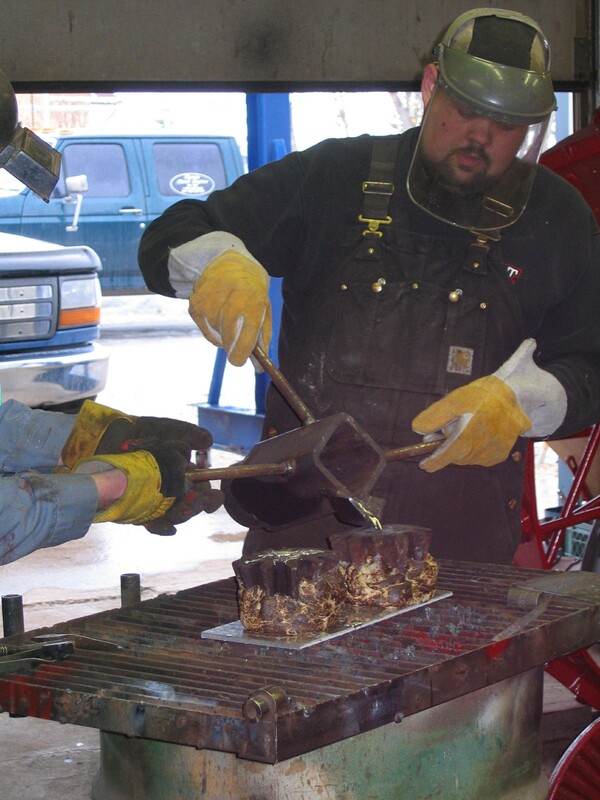 While doing the weld repairs, we also had my welder (another friend of Lee’s, HJL, great guy) weld on that overly expensive front axle pedestal. 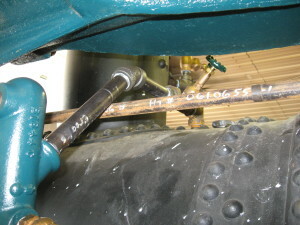 There was a reference hole for the original banding for the boiler jacket to use as a guideline, plus I also measured against a few other boilers to make sure it was correct. I’m not against the boiler running uphill a bit, but I wasn’t keen on the idea of the boiler running downhill after assembly. We also spent more time in the shop, too. Back to work on the differential! Here, we were in for more Crooked Case surprises! We had already decided to re-babbit the spider gears in the differential. We were surprised that the original holes for the pins were not centered in the carrier, and were not keyed at 90 degrees, like they were supposed to be. 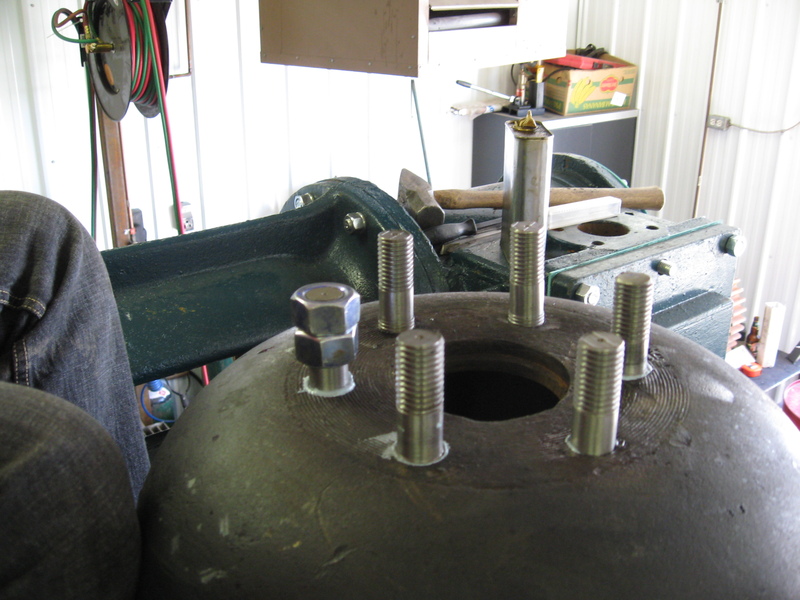 Lee made up a jig where we could rotate the carrier exactly 90 degrees, and, then we reamed each hole larger to center the pins. Only one was close to being centered, the other 3 were offset by as much as 1/8″! 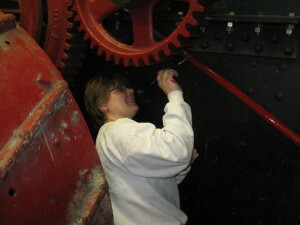 The second picture above shows Lee pouring new babbit into the spider gears. 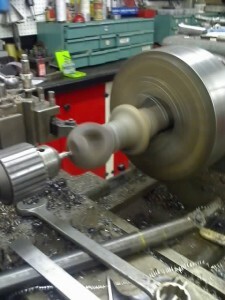 We didn’t core the babbit, he later chucked up the gears in the lathe to bore new holes for the new pins. This way we knew things were properly centered. 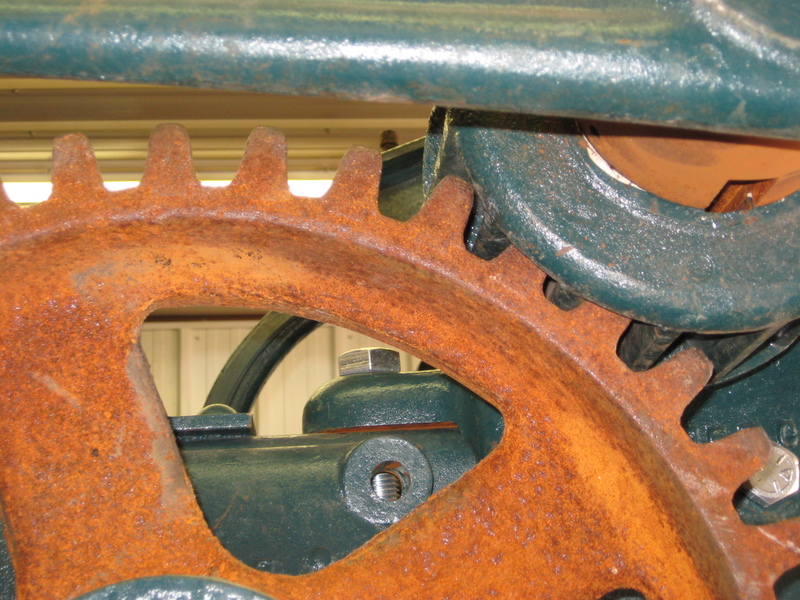 This poor tolerance will put undo load on individual spider and platter gear teeth, rather than spreading the load evenly and lead to breakage under high load. The spiders, though, can walk up and down inside the carrier by about 1/8″ as well. This introduces play in the gearing which does make it more forgiving to loose tolerances, but makes it more susceptible to breakage during jarring motions that can occur, for example, if someone is “rammy” with the engine. Since we corrected the other stuff, I decided we could shim the spiders towards the center to remove that play. After doing so, we did have to bench-test the differential to make sure that there were no issues with high spots on the rough castings. Everything was happy, so we left the spiders shimmed tighter. Lee also machined up new pins for the spider gears. 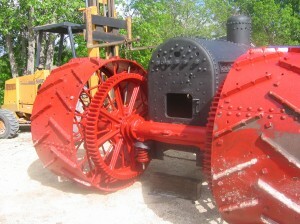 The original design lubricates the differential with oil. We changed this to grease zerks. 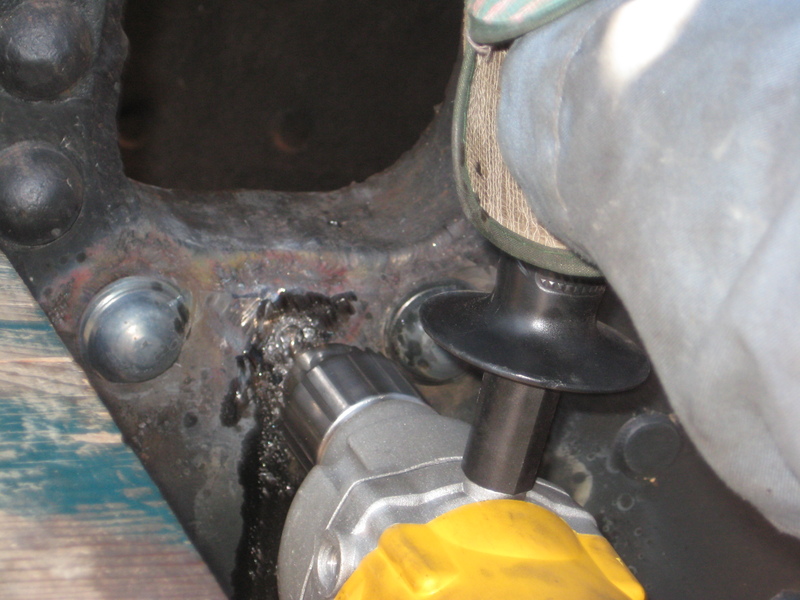 The carrier hub is also lubricated with oil, but the oil passages were completely full of dirt and as it’s designed, it won’t receive great lubrication because half the time the lubrication hole is facing down (allowing drainage of that lubricating oil). So, this also received a zerk. 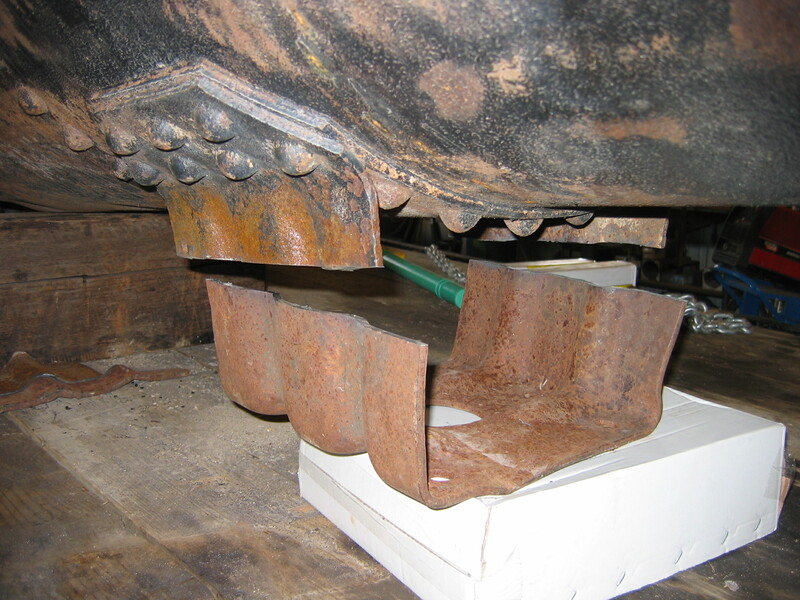 I was warned that this may lead to premature wear because grease + dirt leads to a very good grinding compound. Time will tell, though. My thoughts are with enough grease, the dirt should never reach the wear surfaces. Also, the original design led a lot to be desired anyway. We completely assembled the differential now. 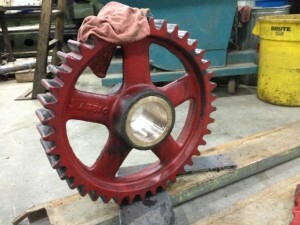 Earlier, I discussed bushing the platter gear. 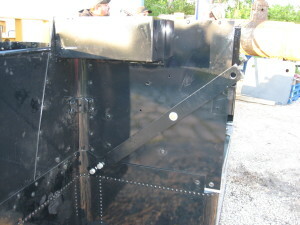 Here, you can see it installed and finished. We popped in the new springs and tested it all again. 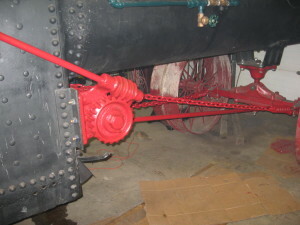 Here, you can see the lower cannon and axle assembly basically together. Of note, the pads that keep the cannon from rotating against the boiler were worn. 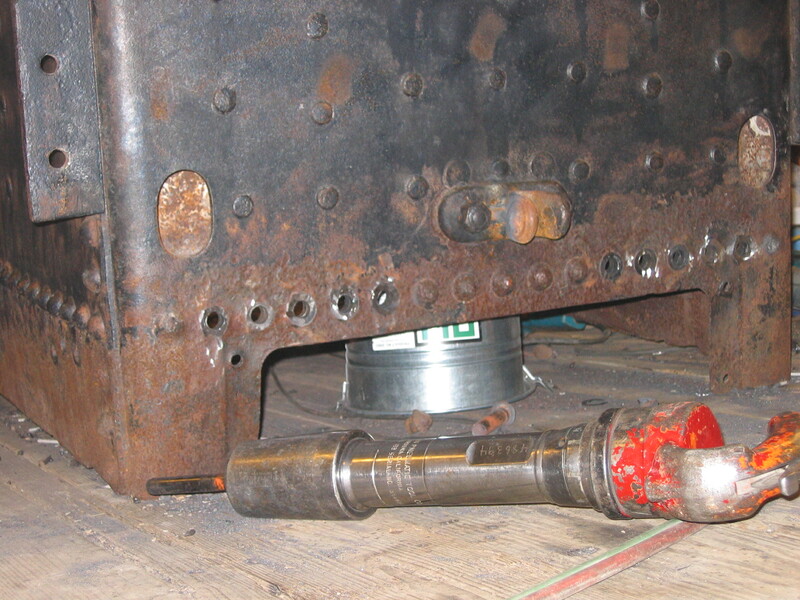 I was concerned about jarring motions and the cannon rotating up against the back of the boiler, excessive play, etc., so we welded up these pads a bit. Garth had respoked most of the rear wheels already, but we had a few more to add. 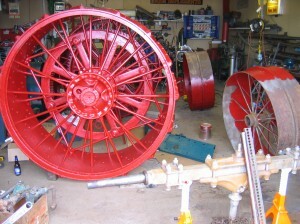 Now the rear wheels are done too. 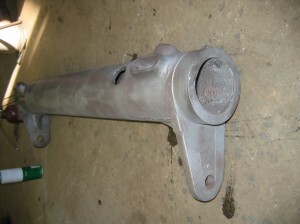 With the rear end components coming together, we decided to refocus on the front axle. 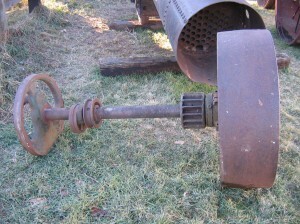 This axle is early enough to be square, but with a truncated cone inside the hub. Here, again, there was a lot of wear. The bushings that sit inboard of the wheel were in rough shape. The truncated cone itself saw a lot of wear, and the bore inside the hubs was equally worn. 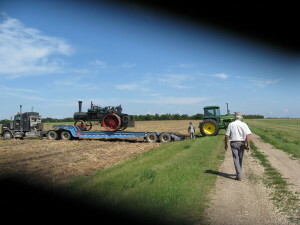 I hate seeing an old tractor rumble by with loose front wheels flopping around. 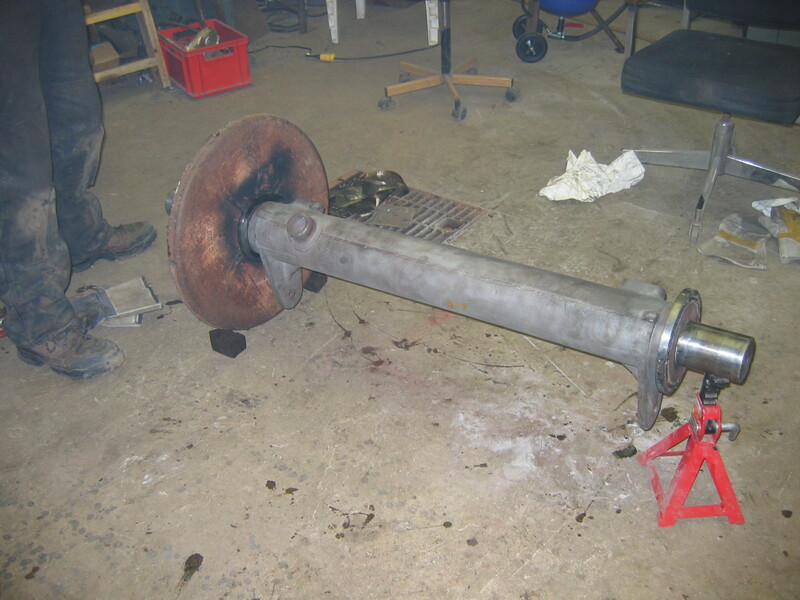 But I wasn’t keen on replacing the hubs, or the axle, so we bought some thin steel and wrapped it around the cone, then welded into place. We did later mark for high spots and smooth it down – the logic being it’s going to be far better than it was. 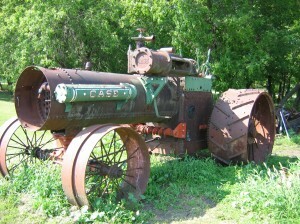 And here is one area that I easily can come back to and improve on this restoration. 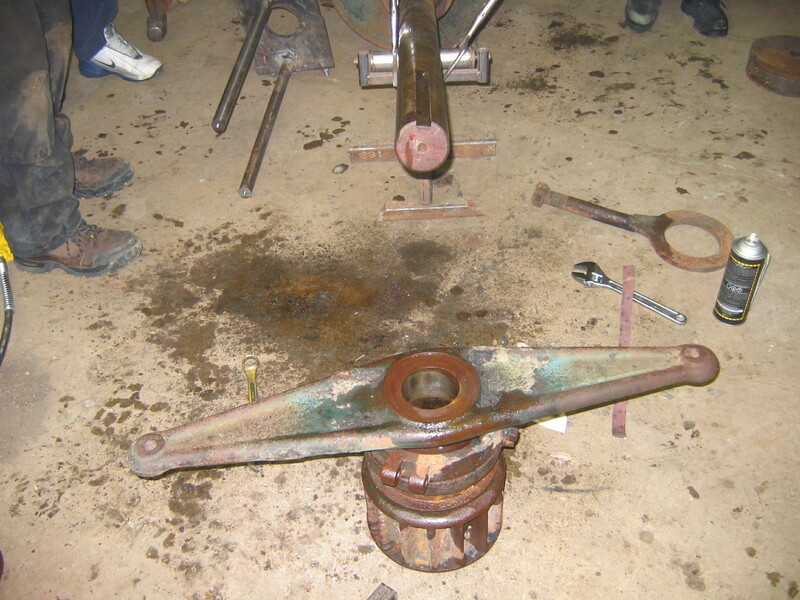 So far, though, with lots of grease and dissimilar materials, everything has been good so far. We were careful to ensure that the taper depth was correct, so that the bushings on either side of the wheel wouldn’t bear the brunt of the load. More work on the front axle! 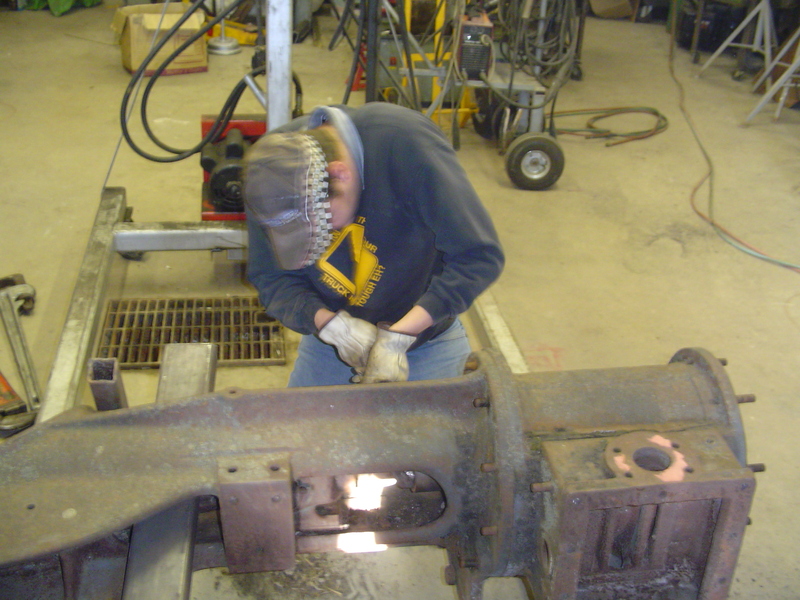 This time, we focused on the front axle castings. 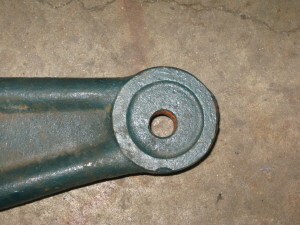 The pin that supports the front axle was badly worn, as was the hole for the pin. As shown in the first picture here, Norm bored it out to the next reasonably larger hole. There is also a vertical pin the front axle pivots on. We had to bore that out to match. But we ran into another surprise. This vertical pin wasn’t bent, it was just never straight at all. My machinist wanted to just make a new one. 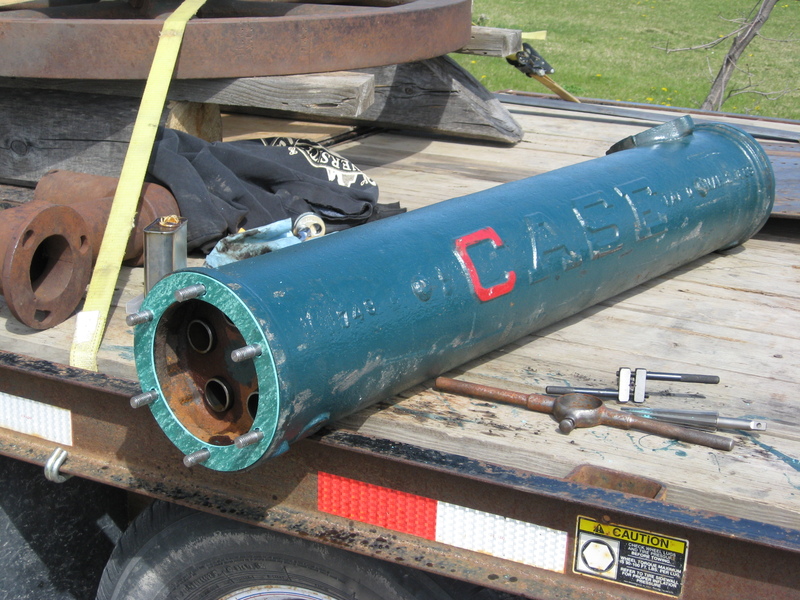 The wear surfaces weren’t true to the shaft, the shaft was not true to the cage that fits into the casting in the front picture, it’s just crooked in every respect. I opted to re-use this pin, though. 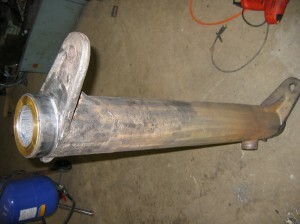 That was accomplished by a bunch of welding and lathing. This, in fact, used up the rest of the weekend. Perhaps a new pin would have been a better choice. Multitasking this weekend! I had to spend a week in Alberta, so while I was away, Lee went ahead and did a bunch of prep work to prepare to the boiler. 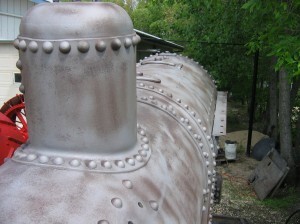 Now, I had purchased some grade A-36 rivets from Jim @ Larson. 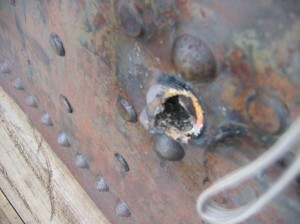 These were 3/4-inch rivets. 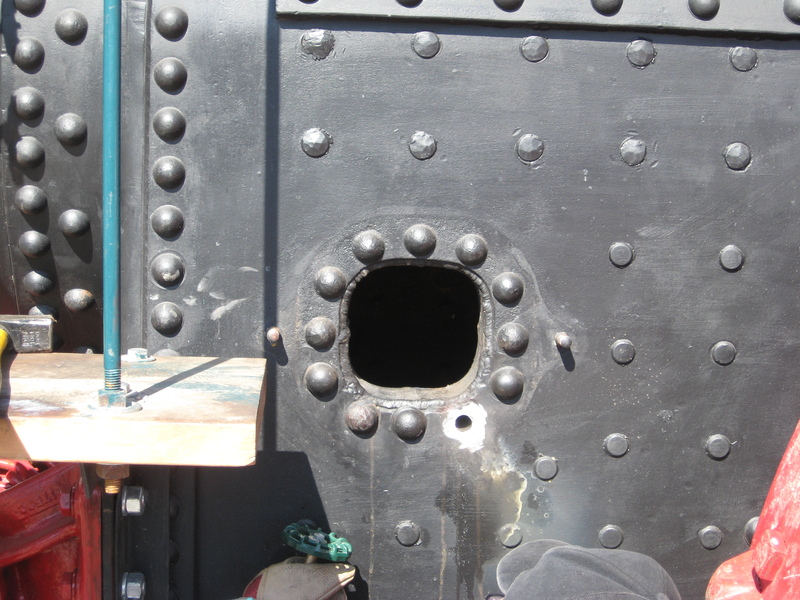 But the blueprints indicated we needed 11/16-inch rivets, so Lee had to turn down every rivet to be installed. So, I had to order ones that were longer than needed so he could properly chuck them up. 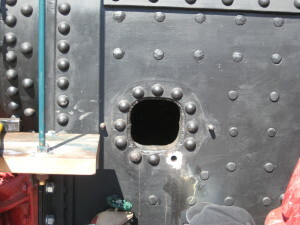 40-odd rivets were installed. 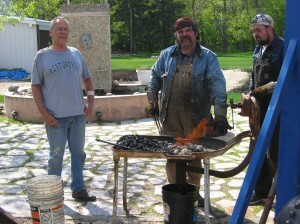 While they were rivetting, I spent the weekend at Garth’s place and he introduced me to the world of cast iron. 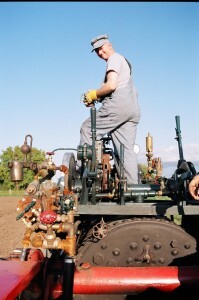 Now, this type of work in the hobby is really what separates the men from the boys! 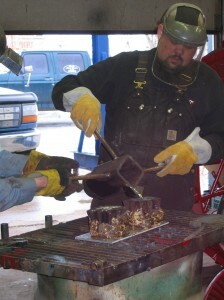 Most people understand the need to recast to duplicate original parts. 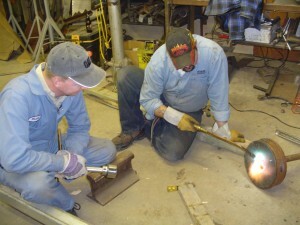 Of those, most people know who to contact, either directly or via a friend, of a shop that will perform the recasting. 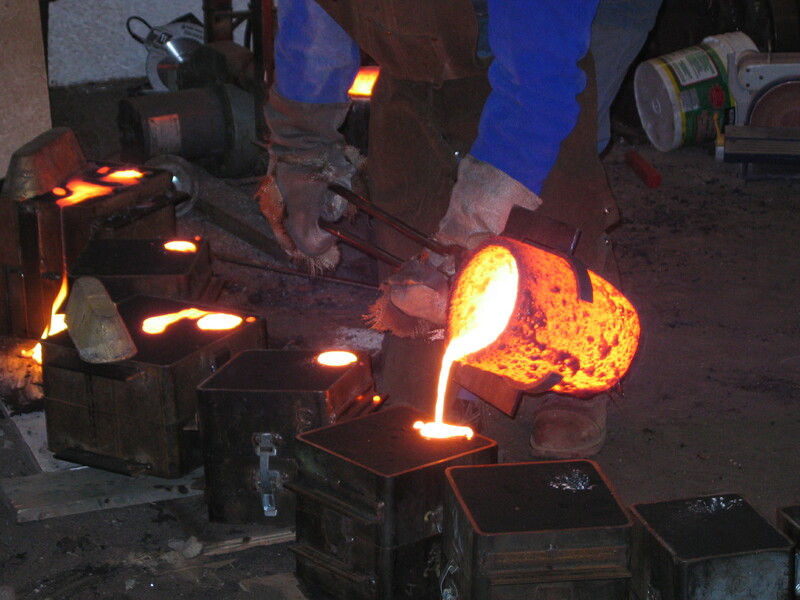 Very few people are like Garth, who are capable of performing all tasks – including casting – pouring molten iron into sand by hand – to reproduce parts. I’ll happily admit that this will remain beyond my abilities! 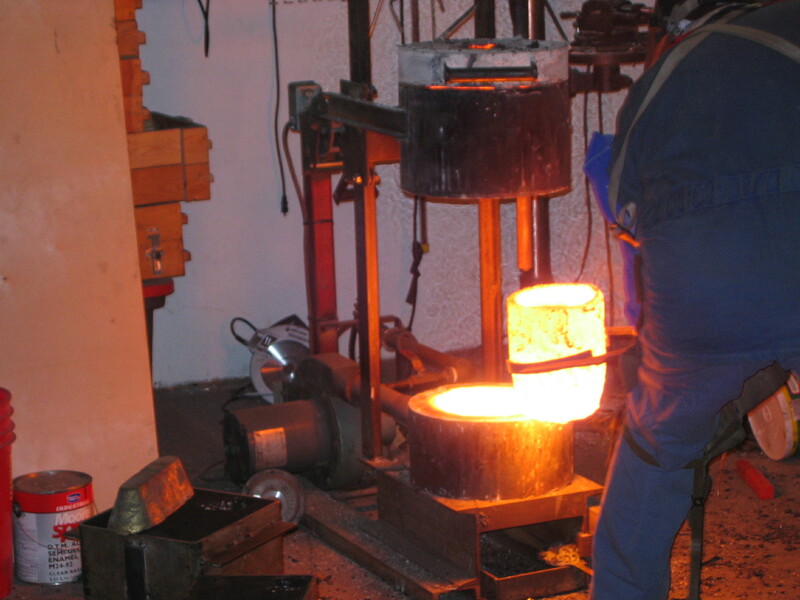 It was very impressive to see it, be involved by helping make the molds, and generally observe what is required. Friends! I had to spend another week in Alberta. So while I was away, a bunch of that boiler riveting took place! I don’t know who all was involved, but Gery, Norm, and Lee certainly were. 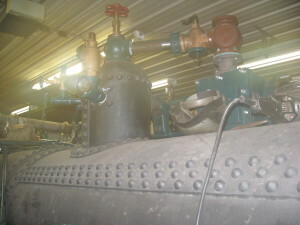 I’m told it went steady and smooth, and that you could hear the boiler “set” as it cooled back off. Assembly! We’ve got the front and rear axles together now. 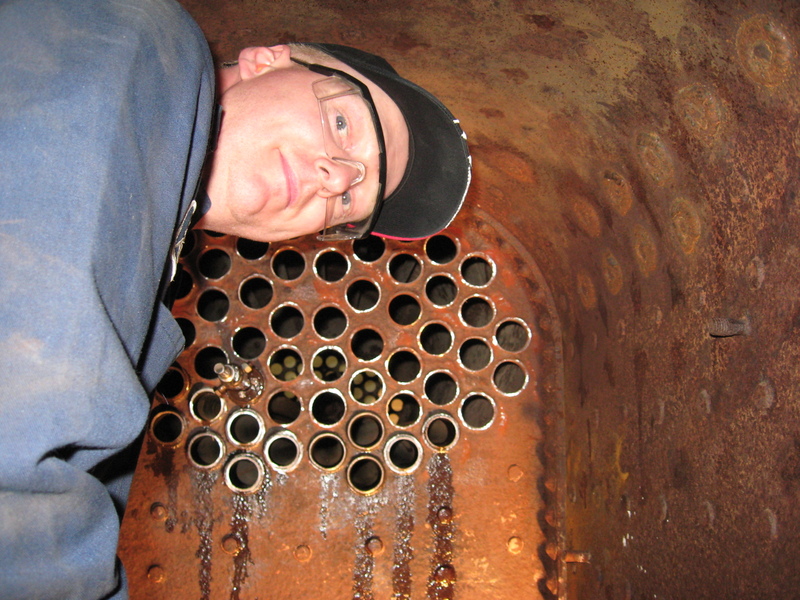 We’ve finished the boiler repairs. What else to do other than to put a few things together?! Lee knows people at the local Hutterite colony. 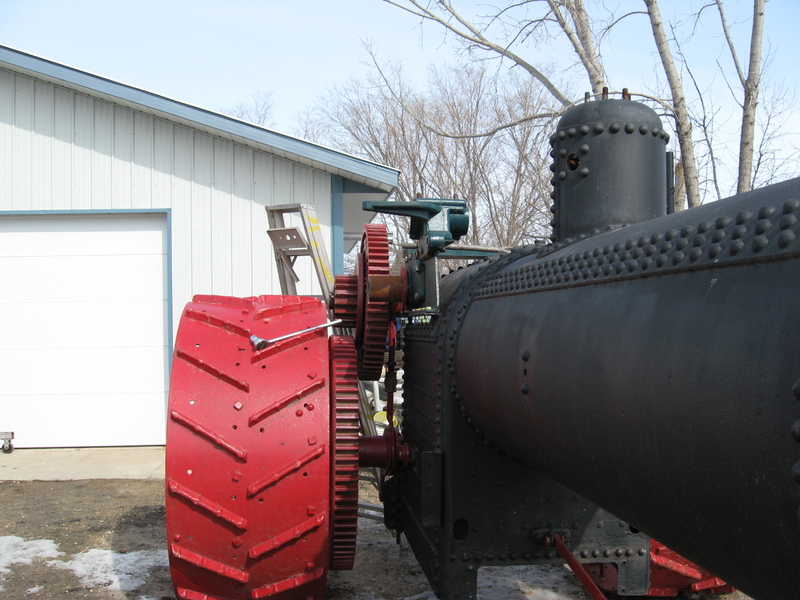 So they did the sandblasting – and at an extremely reasonable cost! We then immediately painted the boiler, in its entirety, heat resistant flat black paint. We had also planned for to find a good weekend when Norm could bring around some heavy equipment to get this job done. I’d like to say it all went 100% smoothly, but it didn’t. It turns out that we used the incorrect length links! We used the links off the 1906 boiler and didn’t confirm if they’d work on this boiler. Well, after dealing with that (relatively) minor issue, everything else did go smoothly. Castings! 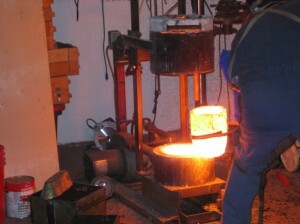 Personally, when a piece is ready to be put onto a project, I like to do that. It lets you know that it fits and it cleans up your collection of parts a bit more. 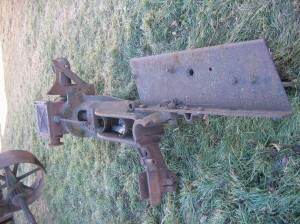 Incidentally, this engine bracket turns out to be a hard piece to secure. 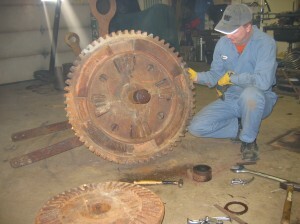 This was another piece garnered from Doug, off a 1910 boiler he had. 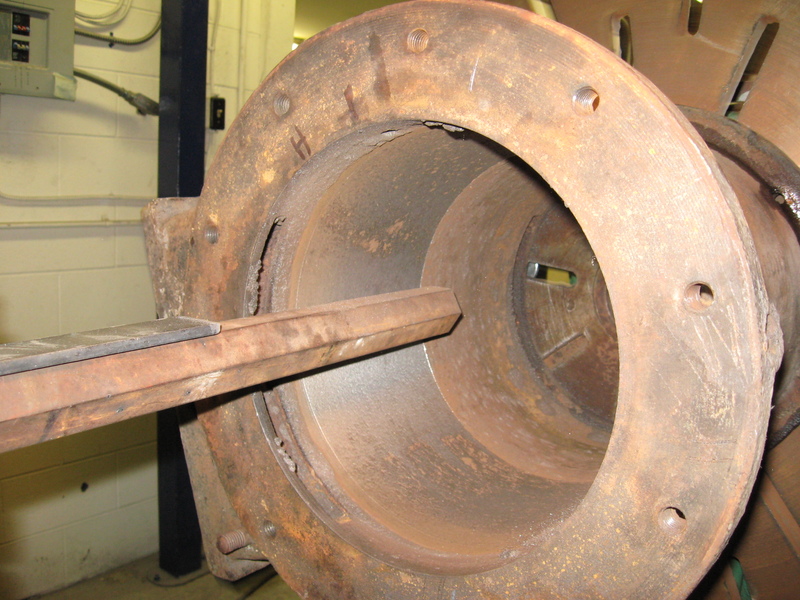 As per our repair plan (approved by our boilers branch), I also had to have NDE performed on the weld repairs done to this boiler (earlier). The weather was good, the NDE guy had time, so this happened smoothly. I remember this day all too well. I was at home loading the camper on the truck for the weekend. 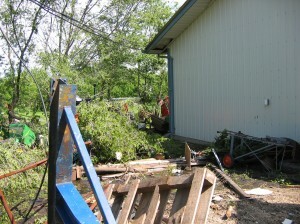 I remember the radio discussing possible tornado touch-downs just east of Portage. I thought nothing of it, there’s always warning of things that might happen, but they seldom if ever do. 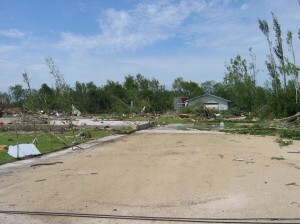 These pictures were taken the day after. Lee and I and others had to head to a wedding, so I was going to pick him up. Well, we still went to the wedding, there wasn’t much else we could do here. Fate is strange, though. 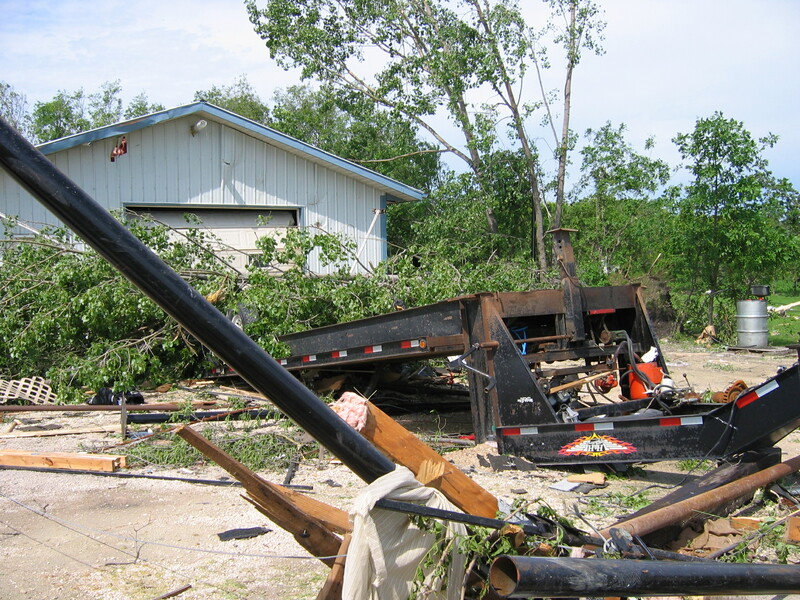 Lee loses a house – completely – the tornado goes around his shop (and hurts it), and disrupts trees behind it. And my steam engine (and the neighbour’s dogs) survive basically unscathed. 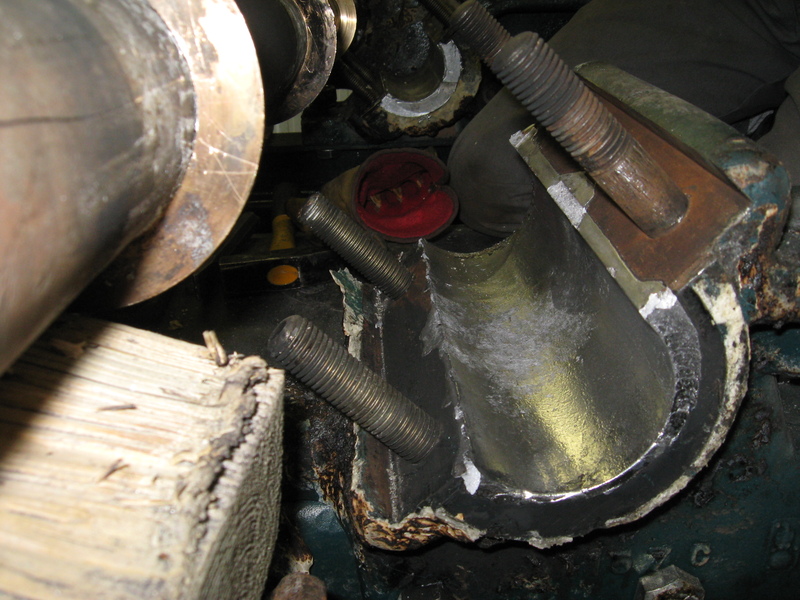 In fact, on the last picture you can see a pile of brand new flues waiting for installation piled behind the engine, left completely intact and untouched. 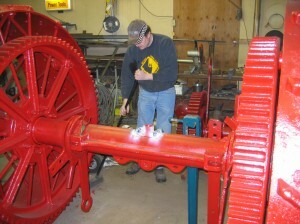 Some white paint ended up on the steamer. My steering wheel was broken (wasn’t installed yet), but that was it! 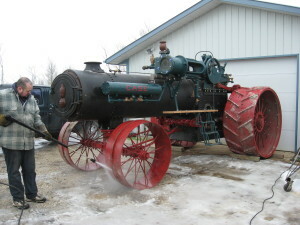 I’ve covered some of the white paint (must have been touch-up paint in someone’s basement), but decided to leave the rest – the engine has “earned its stripes” so-to-speak. 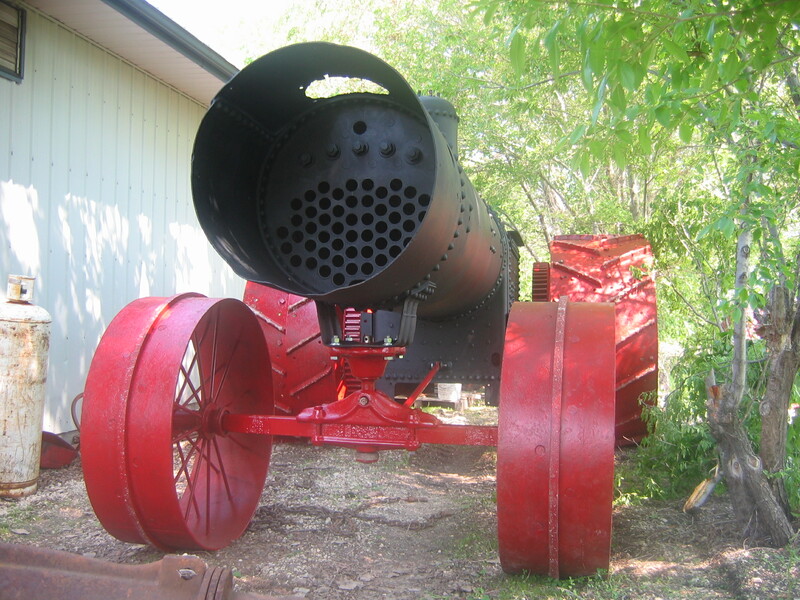 And this is what named the engine TWISTER. Time to plan ahead. 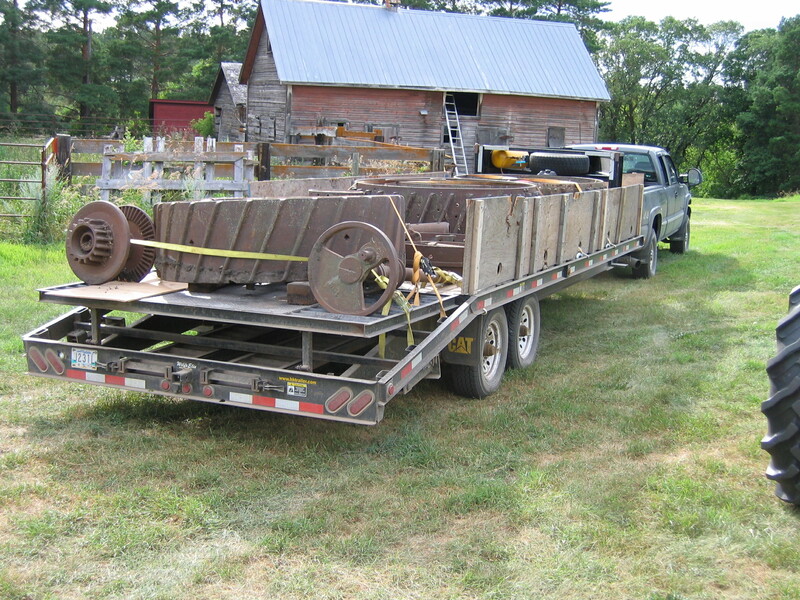 We knew we were going to need tenders, so I ordered up the blueprints for the tenders and frame for this engine, right from Case! Rich, on the other end of the phone, was extremely helpful and patient in making sure that I was getting the right stuff. Kudo’s to Case for keeping this old information on hand and available. 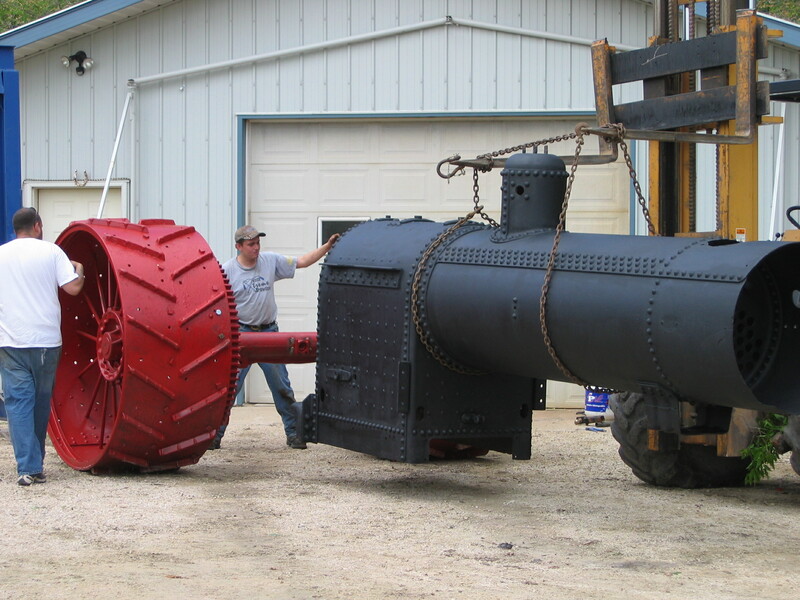 Changing boilers from a 1906 to a 1911 also means that I needed a new smokebox door. 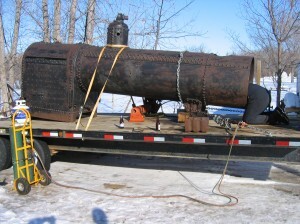 The old boiler is a smaller diameter than the new one, so Jim @ Larson Welding helped out here, and was able to get the appropriate door cast up off an original. Thanks! 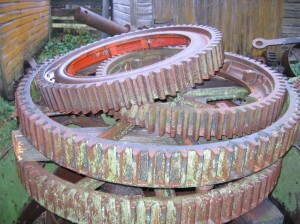 Well, searching has proved to be in vane for any parts left-over from old Case tenders. 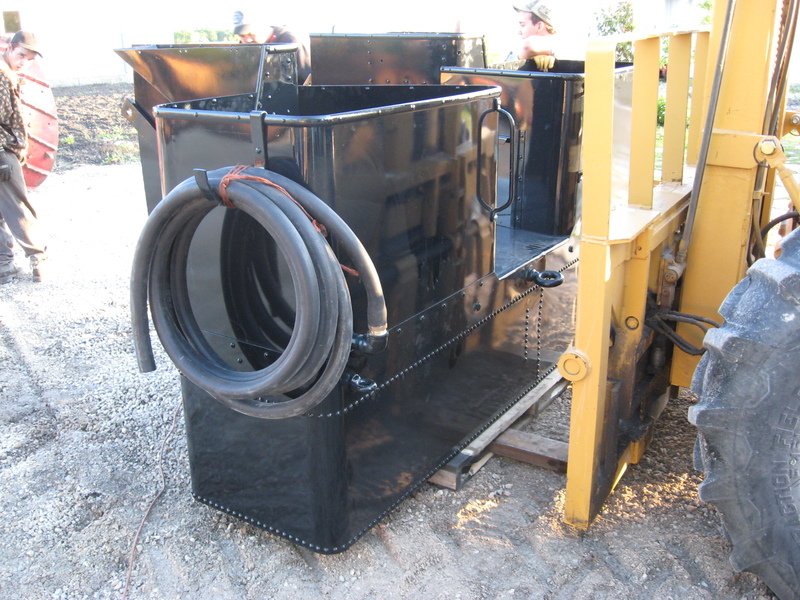 Case tenders have “half-round” material long the edges and ridges of the bunkers to help reinforce the tin, and to give you something to grab on to. Bernard, another friend, couldn’t find any either. So a trip to Darwin’s solve this. Darwin builds tenders too, and had some new half-round stock on hand. 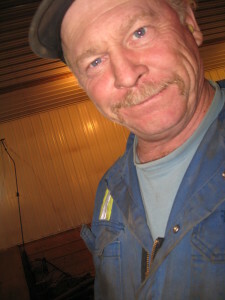 He was nice enough to sell me what was needed for Bernard, myself, and another set of tenders in the future. It’s pretty hard to come by (and not cheap) so I was glad that this stuff surfaced. 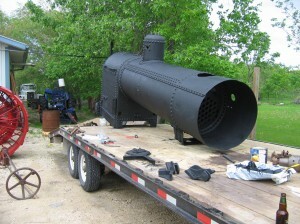 Grant is also building a Case steamer, and he needed some stuff cast up. He was nice enough to let me get in on some of the castings, and now I have a good (new) gear shield casting, and a few other bits. Lee’s life was turned upside down with the destruction of his house. The project had to be placed on hold for a while, and it was. 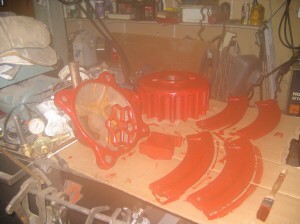 We restarted the project with the start of the new calendar year, and began with work on the engine bed and cylinder. Norm was working at a local shop in Portage and had a lot of big equipment. The cylinder, as mentioned before, needed bored out because of a lot of corrosion, and you can see Lee and Norm positioning the cylinder for that bore job here. You can see the boring bar doing its thing in the second picture, too. 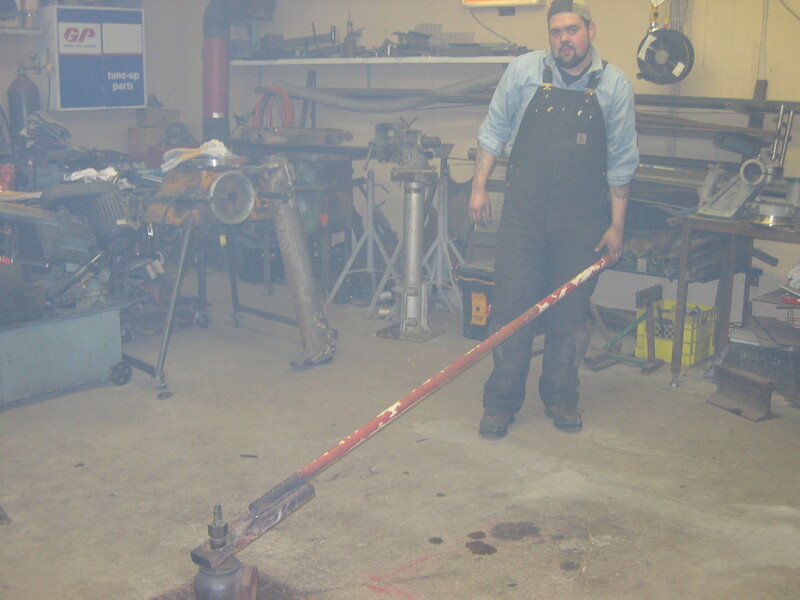 Norm did a great job cleaning up the bore, but left the cylinder with about 0.022″ taper, I had it remachined for a straight bore by another good friend, Ryan, shortly afterwards. It’s nice that we’re able to keep finding and making more parts. I only had 1 clutch shoe that was in good shape. I had a second that needed repair, but sometimes it’s easier to case up new ones, so that’s what we did. Doug needed a few for his projects too, so we cast up a few at once. I still haven’t figured this out, yet, though. I supplied the original clutch shoe for casting, but had to buy back 2 new ones from Doug? 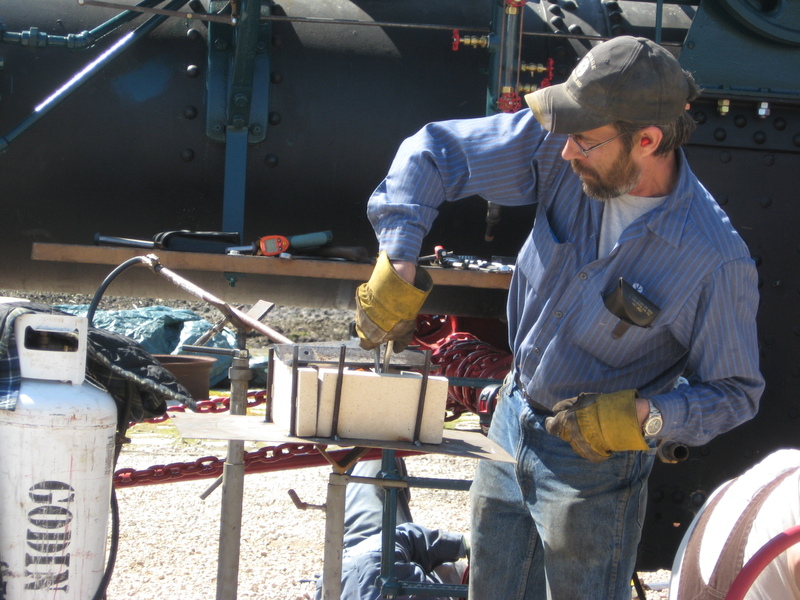 Well, I won’t sweat it, he’s helped me out with parts, and delivered the parts to and from the foundry. Let’s fast-forward a few weeks. 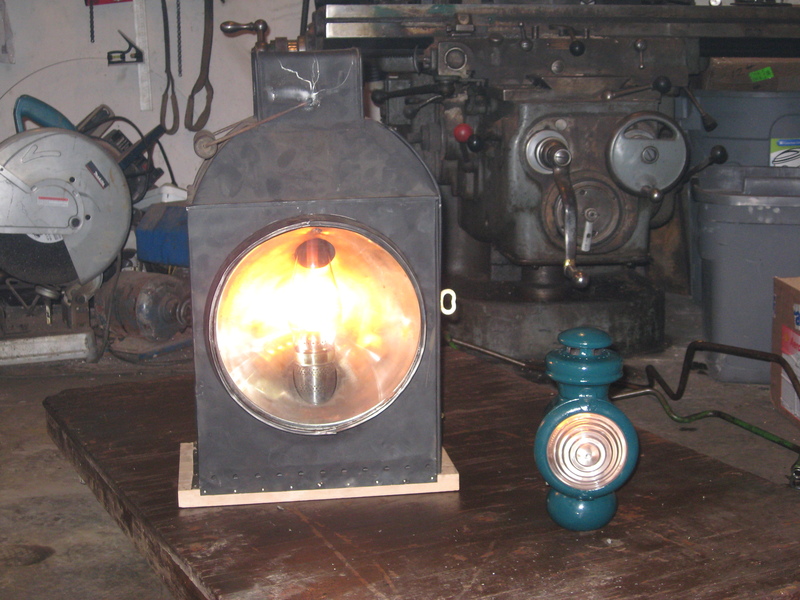 It’s the middle of winter, we were getting things done, but the weather wasn’t great and I needed to get that cylinder remachined. I also had a lot of winter contract work to get done, so it wasn’t possible to devote every weekend to the steamer, either. This was the first weekend since January that I took any pictures of any real progress. And we sure did make progress! The engine bed, crankshaft, and cylinder were freshly sandblasted and needed paint. 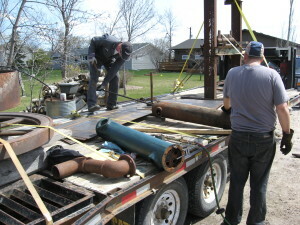 And the weather was good enough for us to finally plan to do some real assembly! 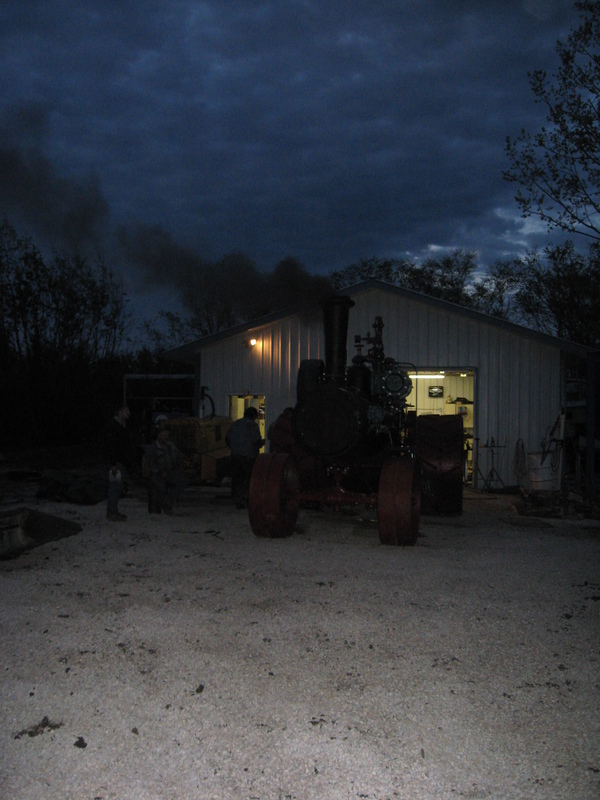 Of course, all the best projects take place at night, and in the dark. Why would this be any different? Let’s install the wing sheets and differential onto the engine (all at the same time – easier this way), in the winter, in the dark. Sounds like fun, right? Well, it must have been – both Bruce and Lee are smiling! This time, I’m happy to report that the links all lined up correctly, and the time that we spent earlier to orient the turnbuckles correctly also paid off. Amber and Adam showed up too! 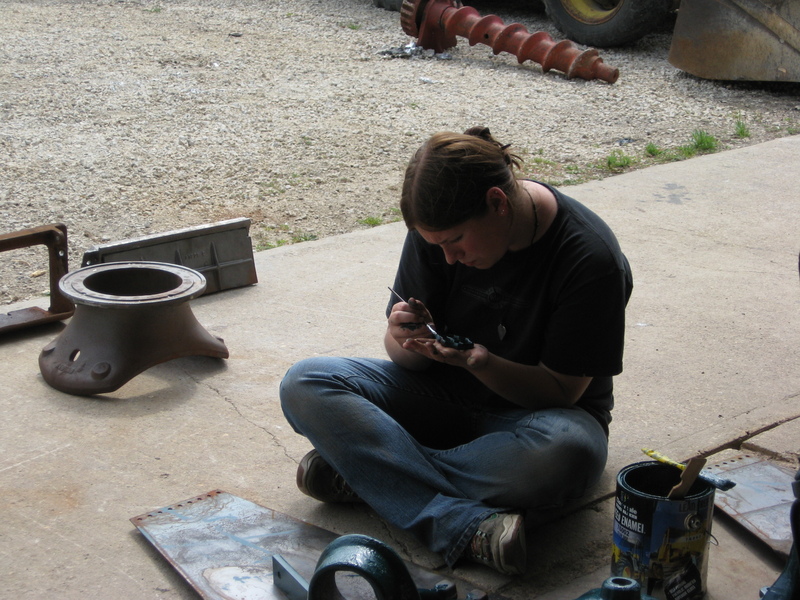 While Adam, Lee and I were busy jawing over the project, outside, Amber is who actually did a lot of the painting on these parts! Thanks, Amber! The next day, we continued. 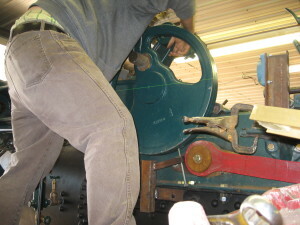 We got the lever platform installed, bolted up the right-hand crankshaft bearing, and even got the engine bed into place! Suddenly, it’s starting to look like something! And it sure felt good to get back onto the project. 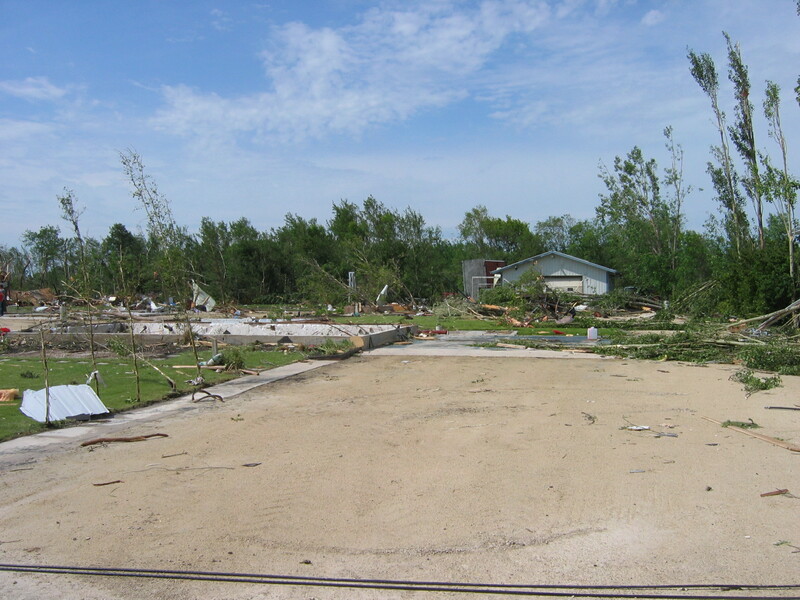 You can also see a lot of the splattered paint from Lee losing his house in that tornado. 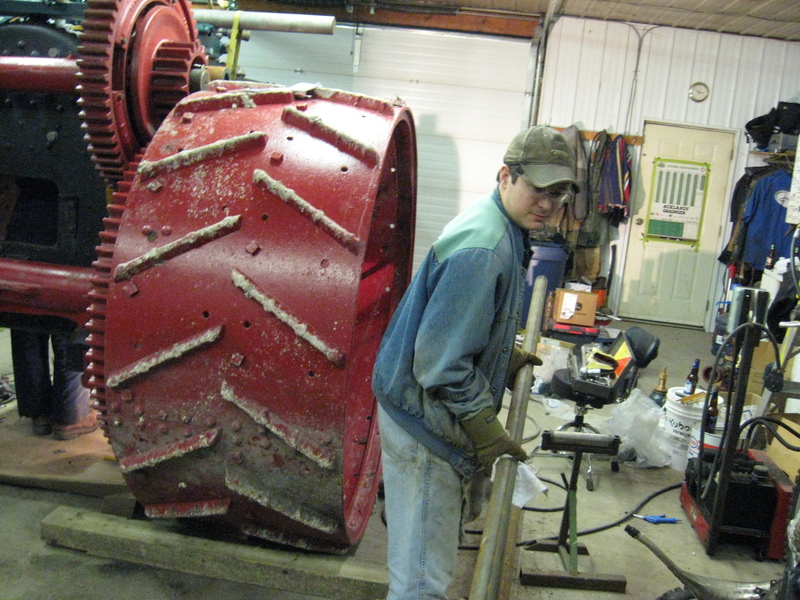 Erron has many talents, and one of them is drafting with SolidWorks. I leaned on him pretty heavy, but he was able to take the original Case blueprints and re-draft the tenders into Solidworks, and supply me with DXF files for lazer cutting. In the process, he was able to correct some minor errors in the blueprints. We also spent some time to compare actual tenders with what Case intended on the drafting table, and Erron was able to compensate for that too. Finally, we spent some time to figure out where best to place rivet holes, and what to leave out to deal with our assembly tolerance, so that everything could go smooth and come together cleanly. 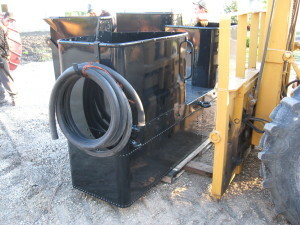 Well, the planning and work paid off, and I got to go and pick up all the sheet metal for 2 sets of tenders (one for Doug, one for me), ready to bend, from Russell Metals in Winnipeg! This all went smoothly, but let’s just say that I don’t enjoy trying to pull a goose neck trailer through Winnipeg during rush hour! I’ll try to avoid that in the future! 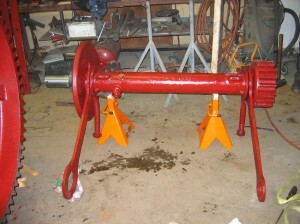 Have a look at the tenders in later pictures, and you’ll see how nice they turn out. If anybody wants to contact Erron about their tenders, then please contact me and I’ll put you in touch. His work is proven to work out perfectly. Another short hiatus from pictures, but more work has been done. Here’s a few pictures showing how we’ve moved ahead. Some plumbing and the water column was put on, levers have been installed on the lever platform, and the crankshaft has now been lifted into place. But the weekend, wasn’t done, not by any stretch. Lee and Bruce were accompanied by Ryan, Travis, Reid, and “the little hemorrhoid”, Garrett! Many thanks, guys. 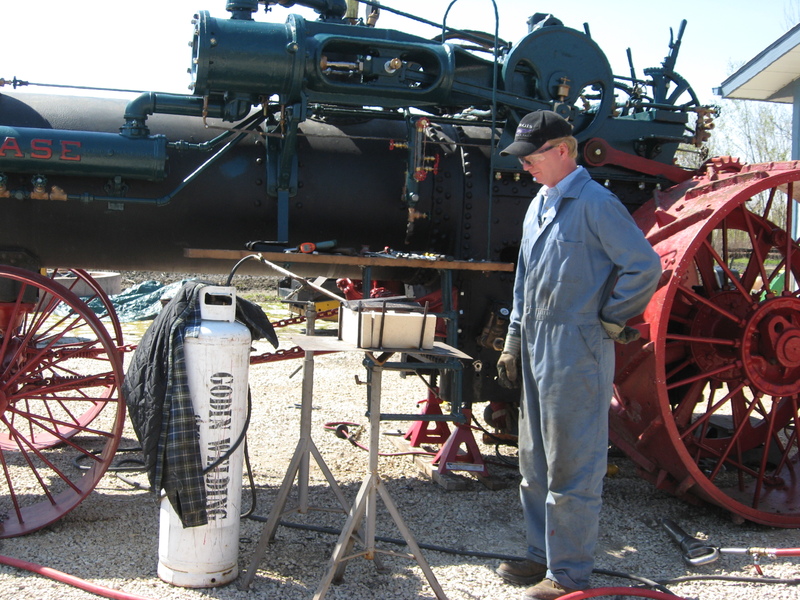 Retubing a boiler is a very big job, and many hands make for light work (and it did here). 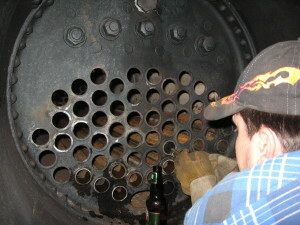 Bruce was rolling tubes inside the firebox, myself on the outside. 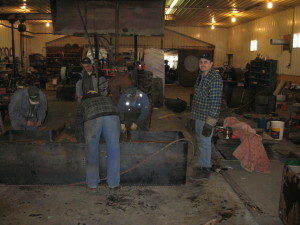 Reid (looking as impressed as always) was cutting tubes to length, and Ryan and Travis were running tubes, and everybody was taking turns helping get the job done. With the tubes in, and lots of pieces bolted on, we were able to refocus on parts that needed machining. I wasn’t keen on the condition of the brass bushings for the con-rod, so we took some pictures and measurements and ordered up copies of the (original!) blueprints. 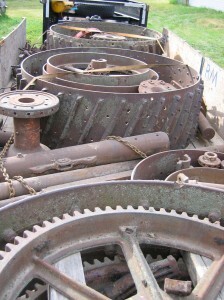 These were shipped out to another machinist friend, Norm, in BC, who performed his magic to make up new ones. Lee also had a machinist contact, and we had new crosshead pins made up. We got to pick up (and see them) this weekend too. Beautiful work. The weather is certainly getting nice now, and we’re able to spend good days working outside as well as inside. 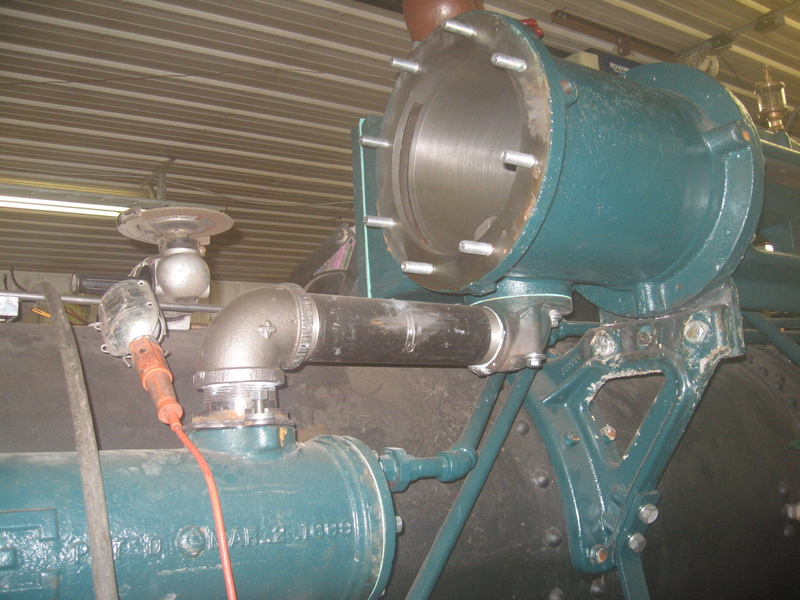 We installed new studs into the dome (B7 grade, machined by Jim @ Larson Welding – beautiful work, got these in the start of April), and got that dome valve installed. A few other things are also put onto the boiler, and with the shop full of “steam engine” we proceeded to do some work on Lee’s trailer deck. 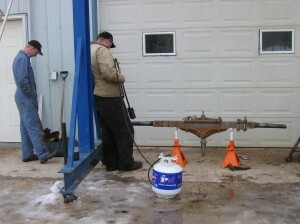 More steady progress, we were able to install the heater and a few more bits of plumbing. 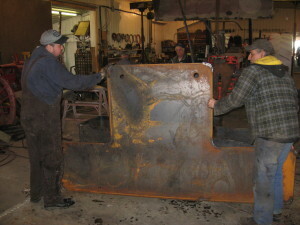 We’re finally getting somewhere with our sheet metal for the tenders. Milltown Colony was able to bend up the sharp edges, following Erron’s drawings. They couldn’t bend the large radius corners, but at least we got some stuff done. Wow, this was a productive weekend! We got the step installed, it was even Lee-approved. We worked more on the exhaust plumbing, got the injector lines routed a bit more, firebox door installed, and front and rear draft doors. 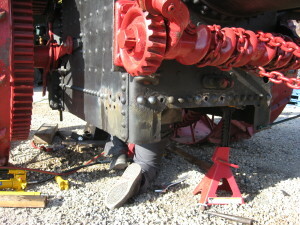 We also started installing the steering castings. You can also see the brand new firebox door (Cattail Foundries) here. A lot was accomplished, but this was partly because of pre-planning. 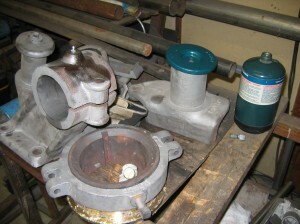 The plumbing and new castings had been ordered months before, and everything was ready for installation. It does feel good to see things come together, though. It’s great to have steady, measurable progress every day that we get to work on it, now. This weekend, right after Austin, we tackled one of the most important jobs of this restoration. When we first measured up the engine bed, it didn’t indicate much wear – Norm figured about 0.020″. 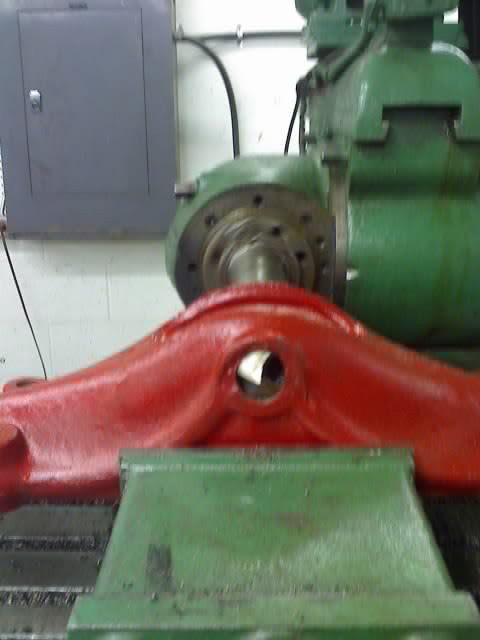 But, like every project, I hate just assuming things are okay, I want it machined so I know it’s okay. After a lot of soul searching, I had asked Ryan to line-bore the engine bed. 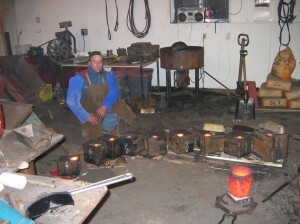 He had spent a few weeks making up jigs and he was finally able to do this work. 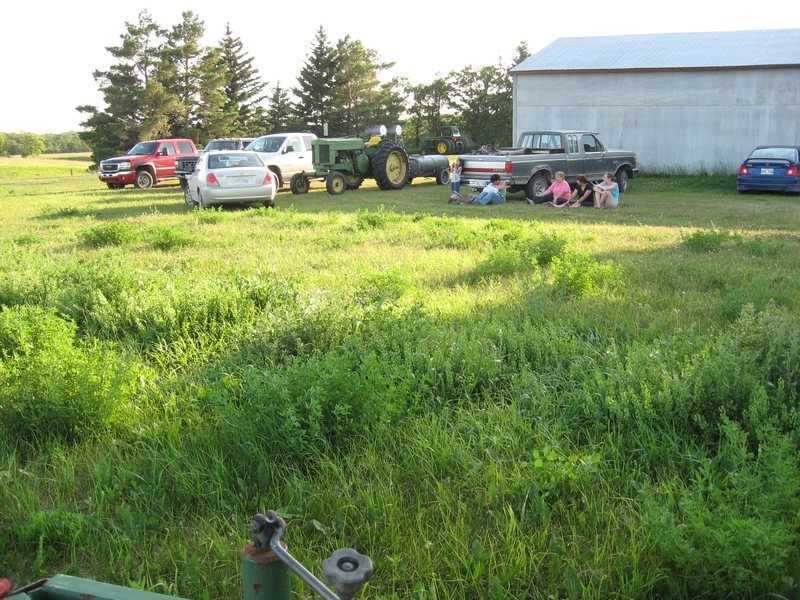 Here, you can see the effects of the first cut, and a big part of why we joke around, calling it a “Crooked Case”. Not only was there wear, but the wear wasn’t straight with the casting. 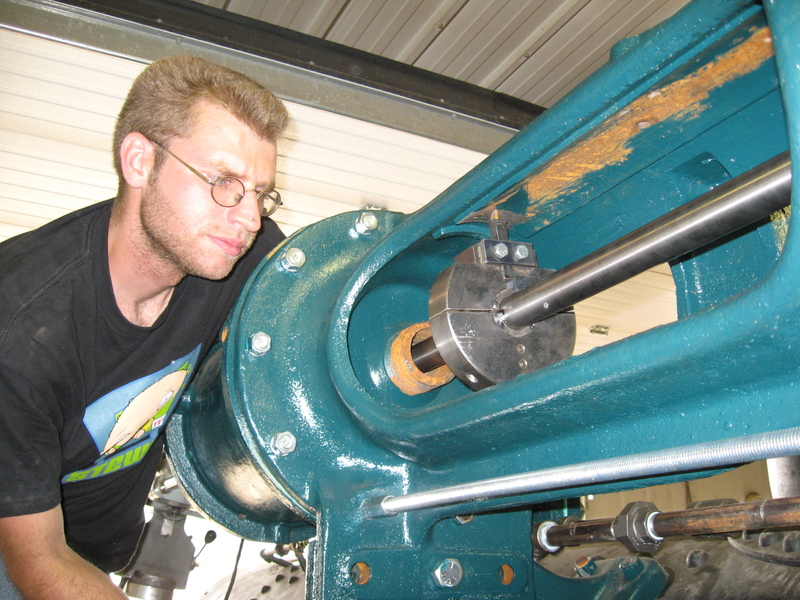 Ryan aligned the tooling with the ends of the crosshead guides, where there was no wear. 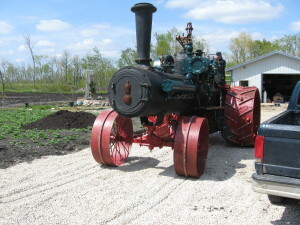 This engine was never set up to run straight. 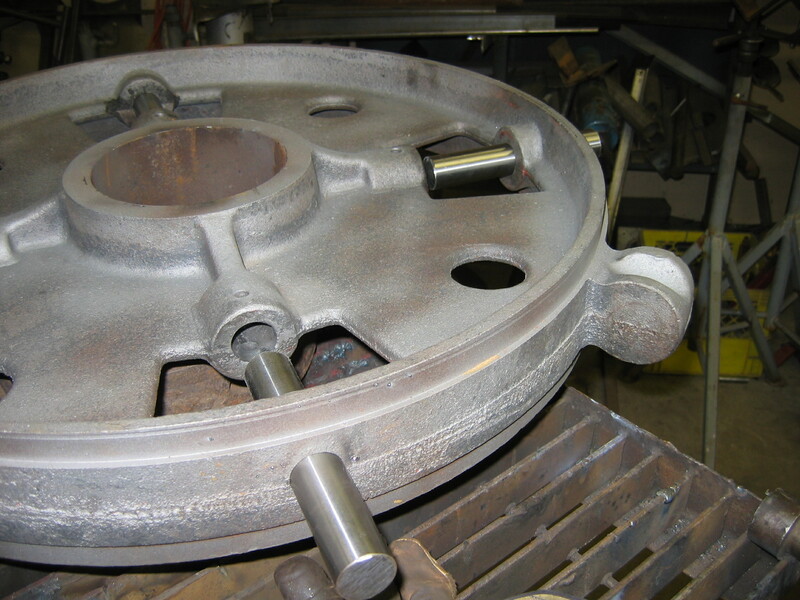 The crosshead had to have been pulled out of alignment and it was worn so far off true that it took 0.090″ of machining off each runner to clean this up and make it straight again! This engine, back in the day, had to have been fighting against itself all the time, and probably explains why it had a bent connecting rod – or that the bent con-rod forced misalignment creating this poor wear pattern. 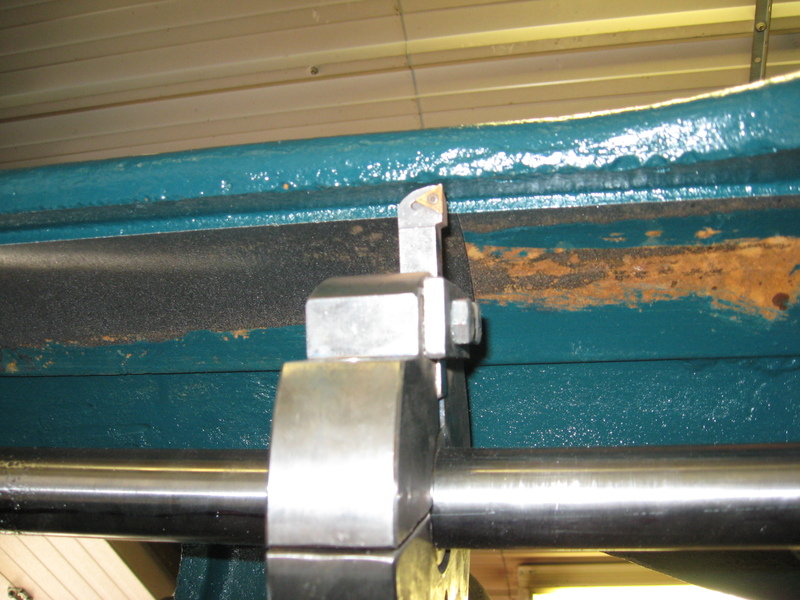 If anybody reading this is considering not machining their crosshead guides, use this as an example: just measuring wear didn’t uncover this issue, it wasn’t until we decided to simply machine it that this issue was uncovered. 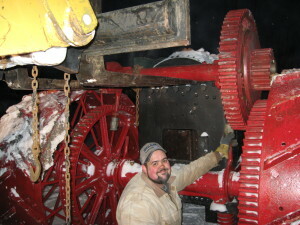 Had I not proceeded, this engine would have never run happily, and we wouldn’t have found the issue until this took place! You can also see that more plumbing is done, so other progress is still taking place! 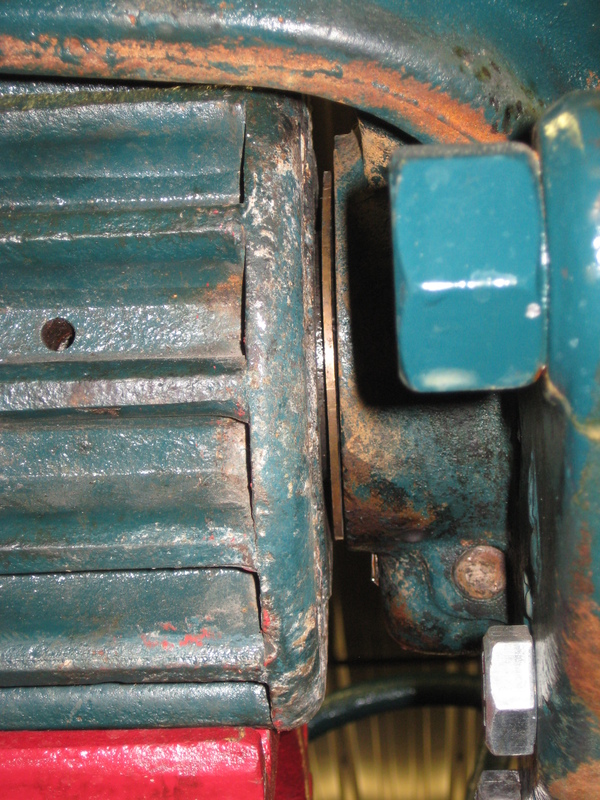 I started off trying to set the right-hand end of the crankshaft so that there was a good gear mesh. I set the pinion a hair tighter than was likely recommended, with the intent that with some wear inside the pinion, the gears should find the correct mesh when running. 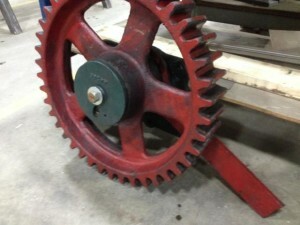 I also squared the pinion gear itself (as best I could) to the intermediate gear. With everything being crooked, we had to be careful about what to align off of. Nothing is straight! The wingsheets aren’t square to the boiler, and they weren’t square to the intermediate gear! Given those parts don’t move, I elected to align off the intermediate gear only, and let the rest end up where it will. But it doesn’t end here! 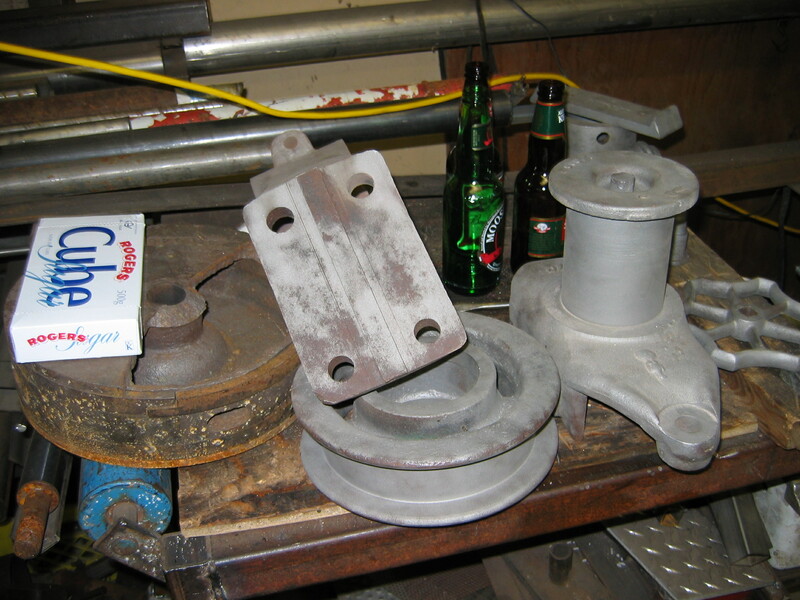 We’ve also got crooked castings! I needed new bearing caps cast up because I couldn’t find a set. (Well, Mr. Pedestal advertised one but he made it clear that he’d rather my engine not go together, than sell me that part…yup, a real contributor to the hobby!) So we had new caps cast up (thanks Bob M.!) and machined them out. 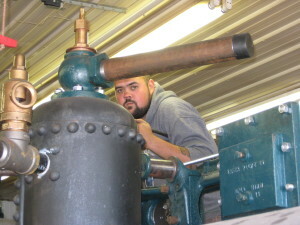 Ryan (who line-bored the engine) ended up swearing at the castings that the caps fit into. 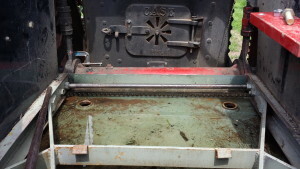 Not only were the stud holes completely relocated from one engine bed to another but the “lands” that securely position the the cap from moving during operation were not machined square. In the picture, you can see shims that were bolted onto the edges of the caps. They had to be machined (after 3 tries) with a taper to finally fit properly in the original castings. So not only was this Case engine never running true but the original bearing caps could have never fit properly/tightly. to move the RH bearing back a bit to effectively raise the crank pinion, but that would pull the crankshaft back even further, and we were already at the limit for moving the engine bed back, away from the forward bracket. 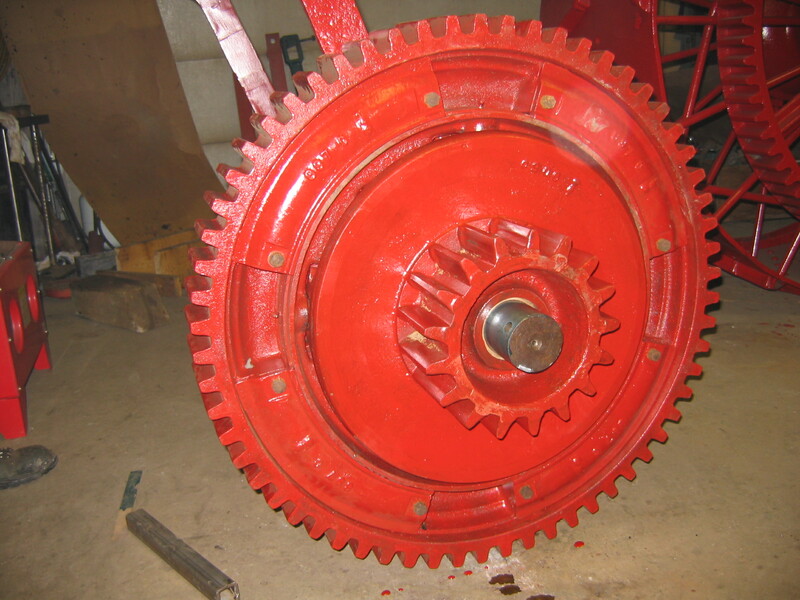 to move the intermediate gear and/or the wingsheet forward, but that would mean welding in and redrilling tons of holes, and trying to realign the other wingsheet too. 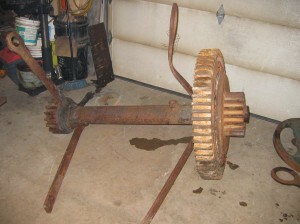 We had already squared up the differential to everything else, so that wasn’t going to happen either. Given the clearance for the upper cannon panhard rod, it’s a good thing we didn’t do this. 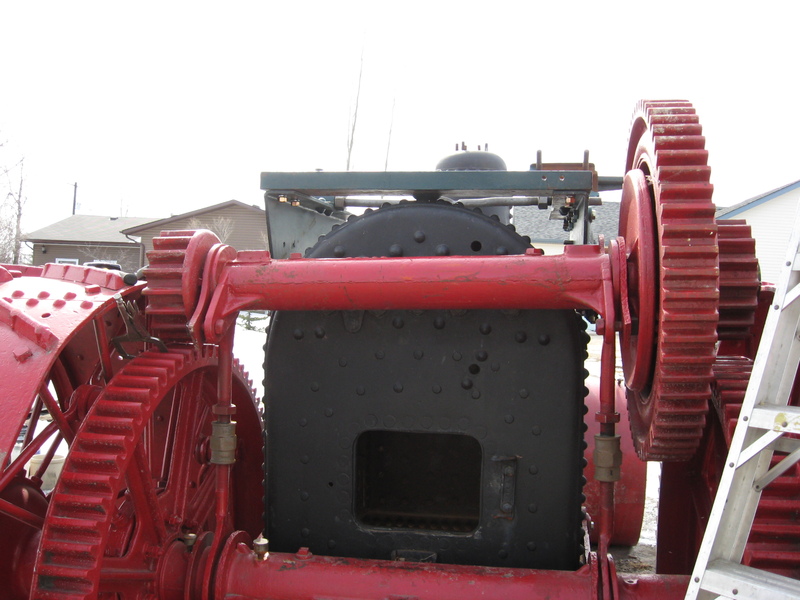 This was our happy medium to find a balance between a lined up engine and a good gear mesh. 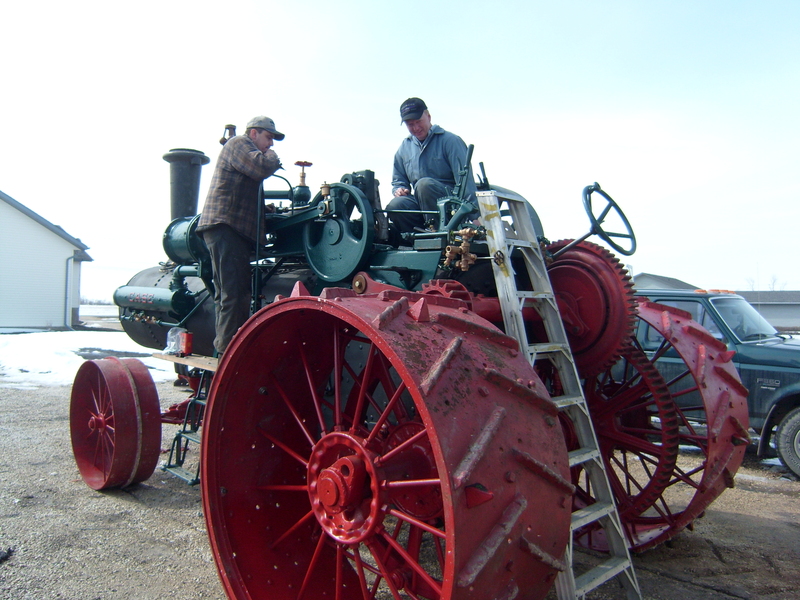 Lee and Bruce were chuckling all afternoon – I spent about a half-day lining this engine up before we were happy enough to finally start pouring the bearings… I was from one side to the other countless times to check how a movement would affect the other side. 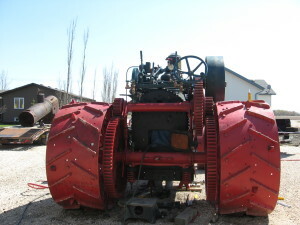 But it paid off, the engine will run smoothly and generates good power! Time for a new entry! Time to pour babbit! We had aligned everything before, and I double-checked it again to make sure I was confident that it was correct. 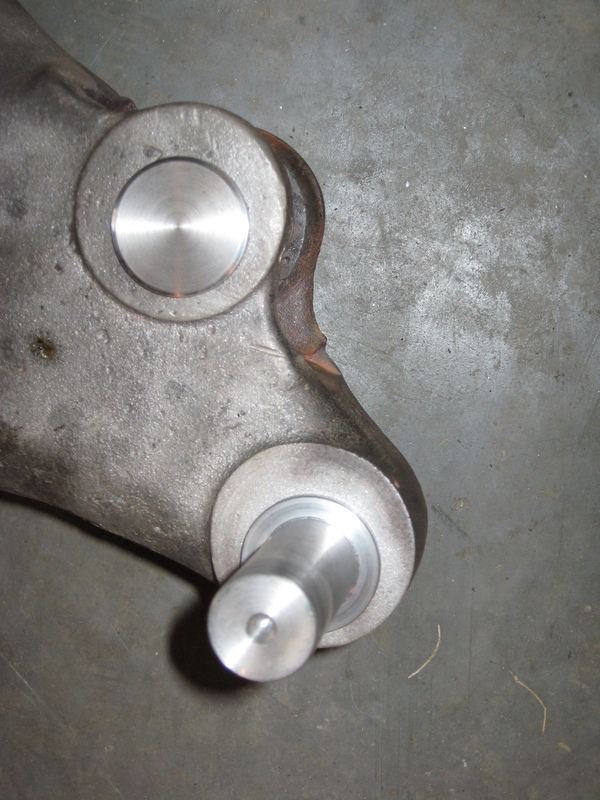 I had asked around, I didn’t know if I should set the crankshaft up about 1/32″ to compensate for wear, but everybody I spoke to wasn’t concerned, so we left that as-is. 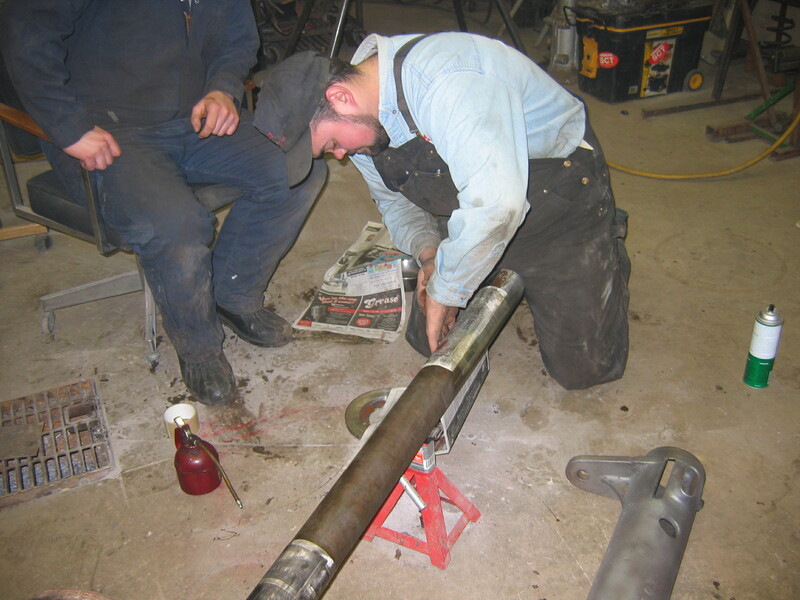 We also taped up and lined up the steering shaft, because if you’re going to get babbit hot and pour, you may as well do 4 bearings, rather than just 2.
here, you can see that we’ve pulled the crank pinion gear back off, so that we can dam everything up with flour. 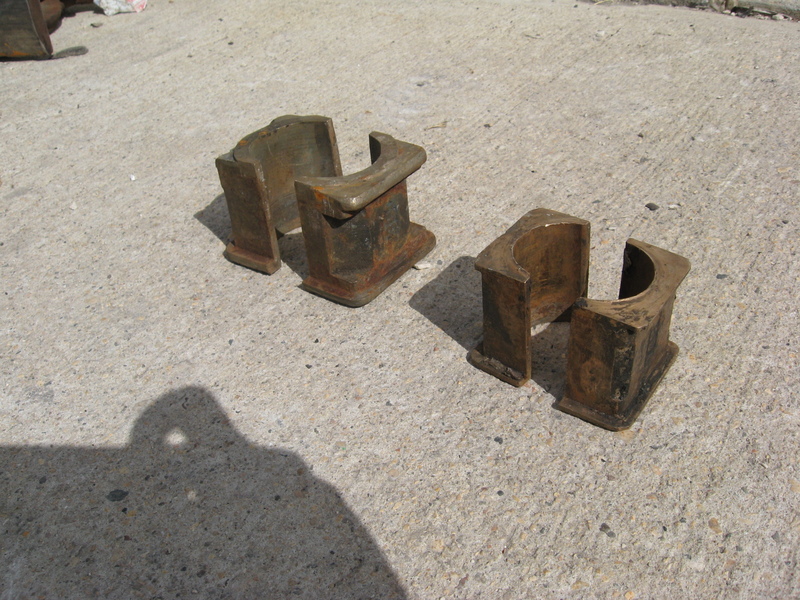 The second picture shows the completed bearings (lower halves – we poured both halves at once, too). 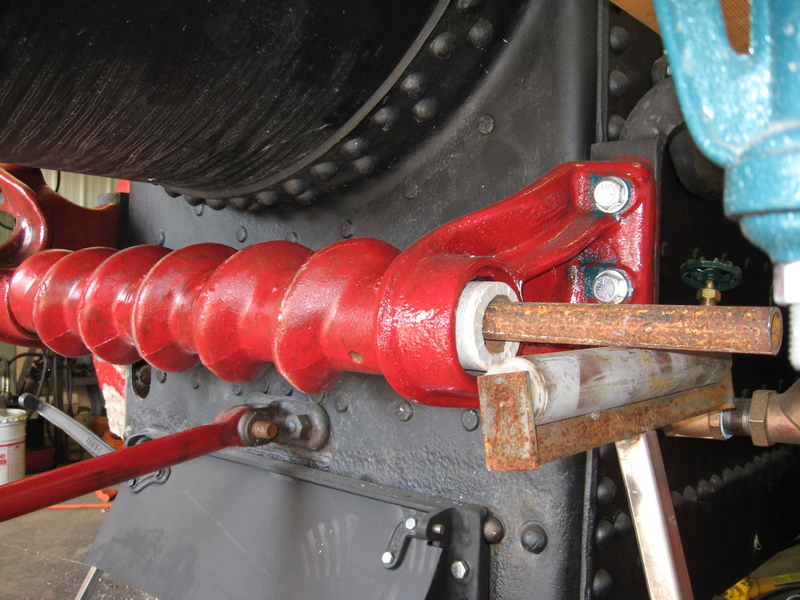 Here, it’s very clear how thin the babbit is on the right-hand bearing, yet how thick it is on the other side. Remember, I couldn’t drop the other side and keep it correctly positioned. Actually, the left-hand bearing went nicely, we only had to pour that once, and I expected that to be the problem child given how hard it is to dam behind the crankshaft disk, and how much had to be poured into it. The right-hand bearing was a different story. What I thought would be easy certainly wasn’t. It took us 3 tries to get a good pour here, between leaks, air dams, etc. But this is the completed result. The steering went smoothly. 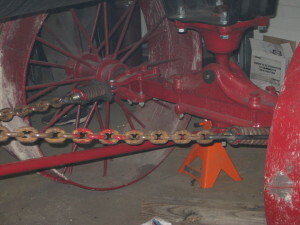 We taped up the steering roller and positioned it on some stands. 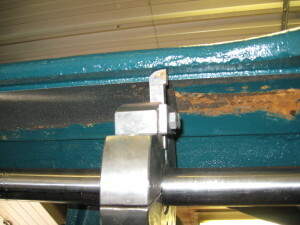 With that, we could carefully square the roller to the boiler and balance the bearing thicknesses here too. The left-hand steering casting was a new casting so this didn’t line up perfectly either. However, this is because the new casting would be smaller than the original. I really have no words for this picture. Any suggestions for a caption? This was another very successful weekend. We had poured babbit before (the upper cannon) but the crankshaft bearings were a much larger pour, and we had to lift molten babbit (around 650F) up onto the top of the engine to pour those bearings. 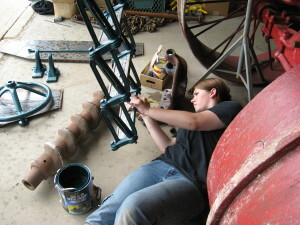 And we still had time to set up, pour, and disassemble, and clean up the steering bearings too! And nobody got hurt! Update July 27, 2015: we also scraped in the bearings, like you’re supposed to. I was told to only remove the high points, and make sure it was clean. I’ve never scraped bearings before, so this was new to me. I scraped in the clutch side, Doug (who seemed to know what he was doing) scraped in the crank disk side. He removed a lot more material, to the point where I was concerned about it affecting my crankshaft alignment. Well, the engine runs well, but the crank side bearing uses about twice as much oil as the clutch side bearing, even after trying 3 different types of oil, and adjusting the bearing. 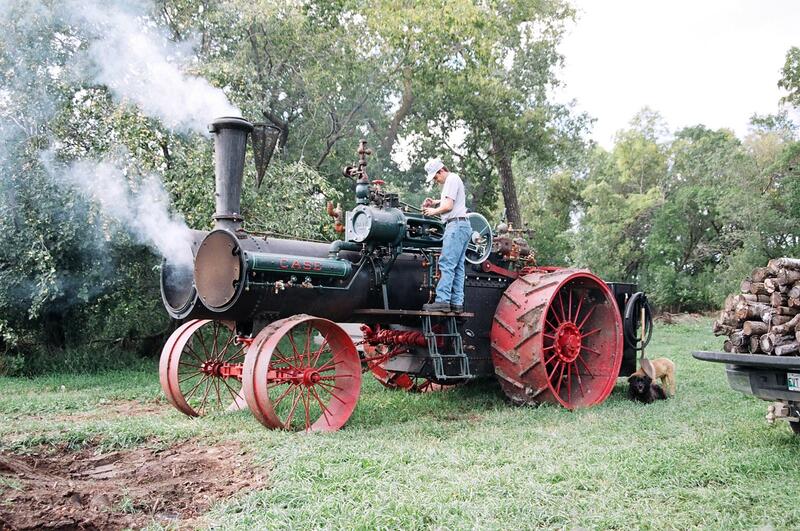 And when the engine is pulling really hard – 90+ hp, you can hear a bit of a knock. 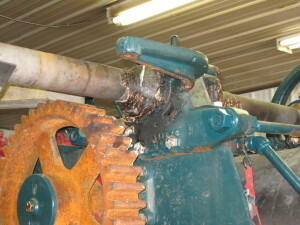 I’m not sure if this is due to the thrust being greater on that bearing, or if it was “over-scraped”. 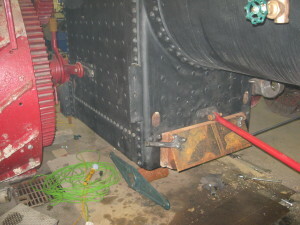 We’ve had to remove more shims on that side too. Someday, it may be something to come back to and fix this. In the mean time, it runs good so I’ll focus on other projects. My lesson here was to do as I was told – only remove enough material to deal with the high points. 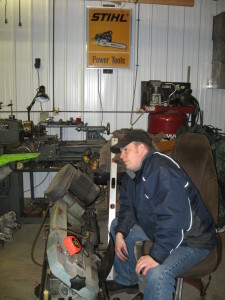 I had a chance to go to Larson Welding for the annual Rollag meeting back in the spring. That was educational, and it was fun to meet people. 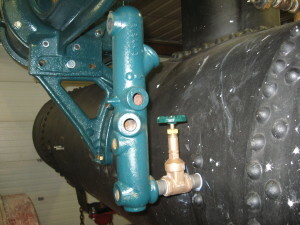 I was lucky enough to meet a fellow with a spare Baker valve – he had swapped out the Baker and returned to a D valve because his would lift water every so often. We made a deal, and I finally got to see it, and buy it! It’s a bit different from my Baker valve – mine has drain ports which likely deals with his problems. 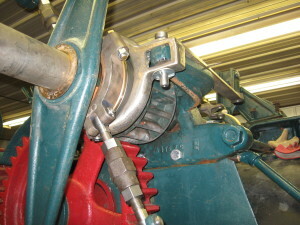 Mine also has an adjustable valve assembly, where you can change the distance between valve pistons. But at least, it was set the same as this spare. To back up a bit, the original parts collection came with a Baker valve (with the correct steam chest cover) and a Pickering governor, which I’m told was the “best of the best” combination of parts, making this a bit of a “hot rod” engine! 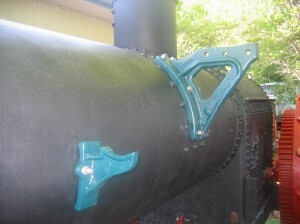 Well, that appealed to me so this engine will certainly have these. 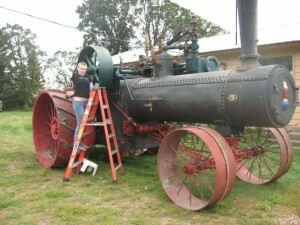 So when the opportunity arose to pick up spare “hot rod” parts, I jumped at it. Another lengthy period since the last entry! Sorry. 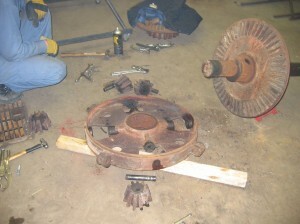 We’ve tackled more stuff, now that the bearings were done and the crankshaft was placed. 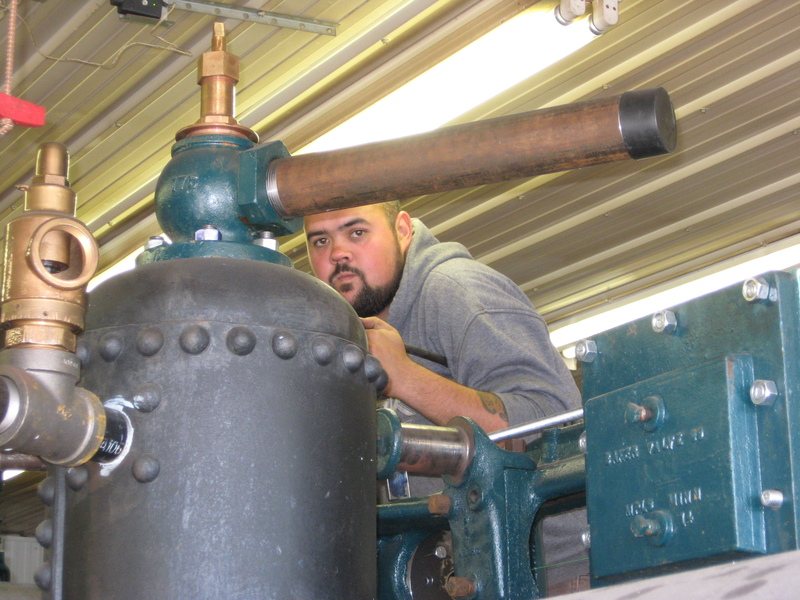 Lee machined up the steam pipe going from the dome valve to the throttle and governor. 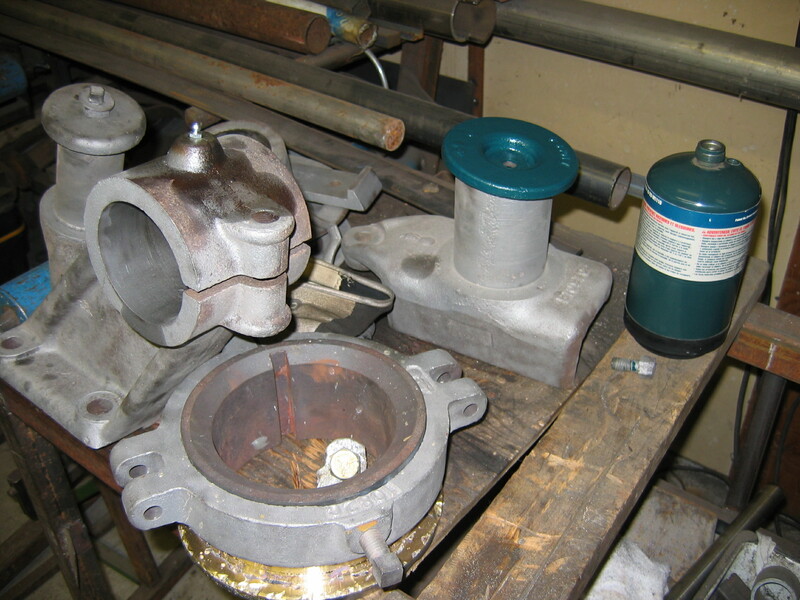 Out of all of my governor spacer blocks, none quite fit right, so we had to make up a kind of a double gasket to align the parts. I was talking to a true expert over this (Clyde) and I was complaining about this other misalignment, and he was clear that I got off easy! 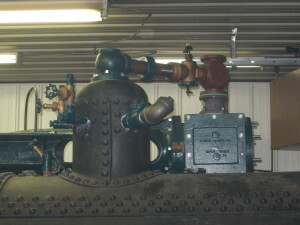 With a great story about how not all domes are lined up square/vertical on boilers, it’s clear that I’m happy this Case wasn’t quite as crooked as a few others that he’s encountered! With the steering roll in place, we were also able to install the steering chains, making it far easier to move this thing around now, too. 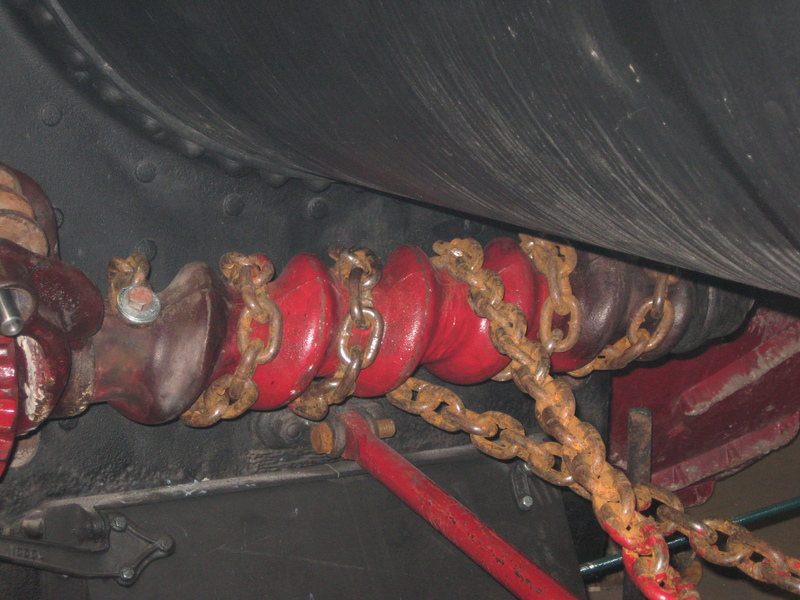 Some of the steering castings came from Clyde, too. 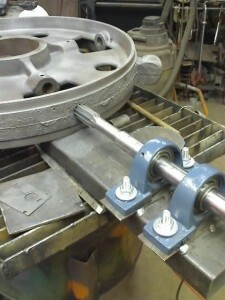 We also prep’d some other parts for machining. 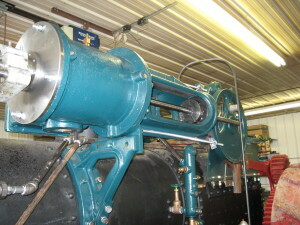 Since the cylinder was overbored, the piston needed replaced or built up (oversized). We chose to oversize it. 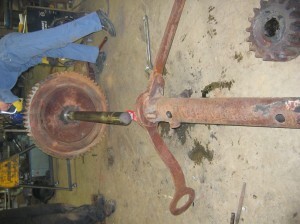 We also had to bake the oil out of it, as well as the eccentric hub. 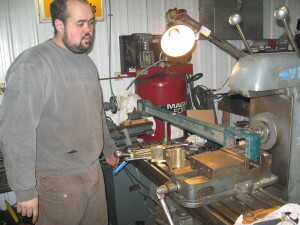 Norm’s machinework on new connecting rod brasses is amazing. 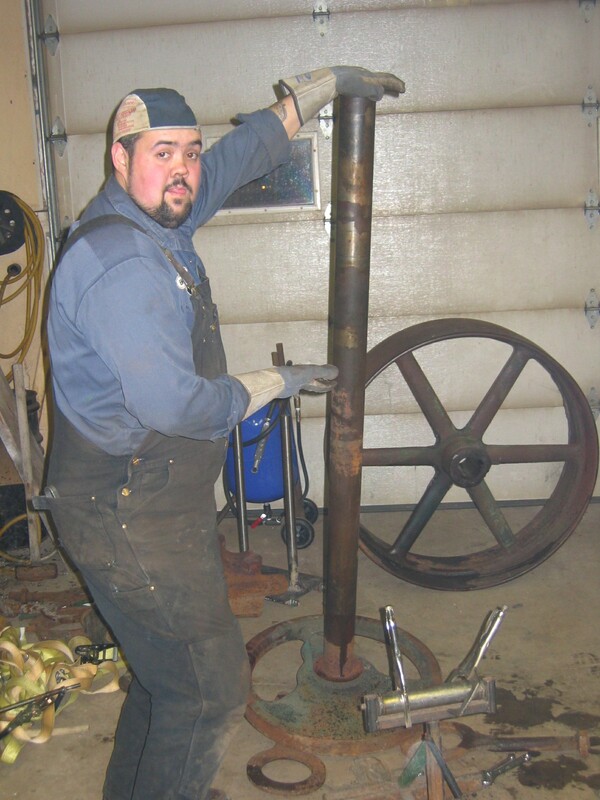 Seeing the quality of his work, it was clear that I wanted him to make up a new piston rod too. So we shipped out the original. We’ve asked him for 3 – one for me, one for Doug, one for Lee. 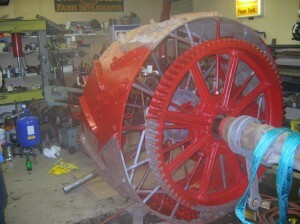 These next few pictures show the work that’s been taking place. 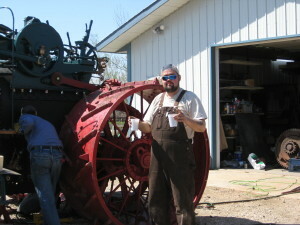 Work on the steamer has been slow, between my contract work and Lee’s preparing to move into his new house. But, some work has been accomplished. 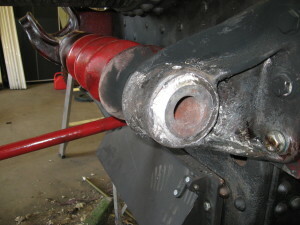 The exhaust from the cylinder to the heater was completed. This was a bit of a chore, with the pipe being about 1/8″ too long, and it sure was a fight to get that one more turn on that tapered thread, to get things lined up! It took all three of us (Bruce, Lee, myself) to leverage on this! 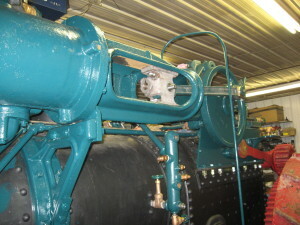 We’ve also been able to do a bit more of the plumbing fit-up. And Aaron came out for a day and helped weld build-up around the smokestack base. Lots more progress this weekend, too. Bruce’s wife graciously came out to paint stuff up, while we worked on more plumbing, and install the smokestack base. This is another new casting that we got from Cattail Foundry. She’s now starting to look pretty good! We also got back the new piston rods from Norm, wow do they look nice! There’s detail work to be done in making a good running engine, better. We tackled some of it this weekend. Here, you can see Bruce finishing off brazing up the hole in the quadrant lever that always wears, and Lee machining out the wear in the connecting rod. 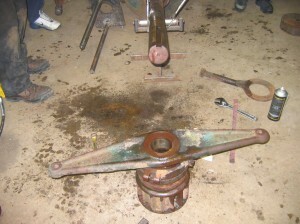 We also cleaned up all the other wear in the quadrant lever too. 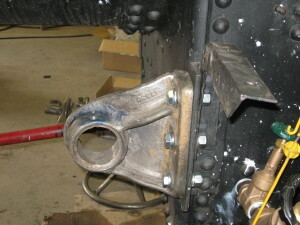 And Lee also bushed the rocking arm, and lathed the bracket that the rocker arm swings on for a nice fit. The connecting rod is another story! 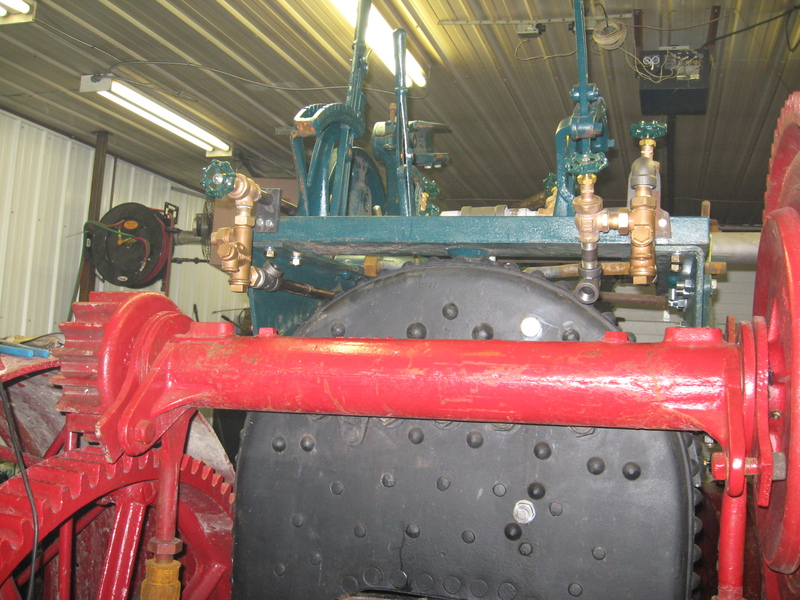 We had the original con-rod from this engine, but with parts now machined straight, I’d have to bend (straighten?) it to actually use it. I had a few others, but they weren’t lining up nicely either. With brand new brasses, a brand new crosshead pin, and a crank pin with less than 0.0025 wear, we figured we could get this pretty much perfect. I ended up using a con-rod that I had on the shelf with 2 slight bends in it. 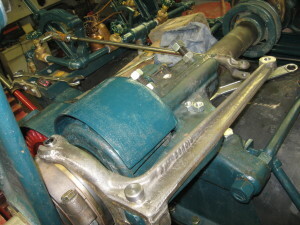 A perfectly straight con-rod wasn’t going to work due to clearances between the brand new (build to factory spec) brasses, and the crank disk. So yes, even with everything perfectly straight, I purposely installed a crooked part to get this engine to roll over without any bearing load! Talk about crooked! 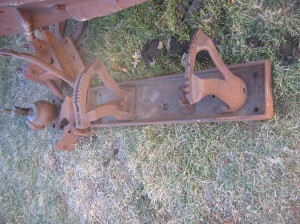 We also spent some time with the eccentric and its bracket. 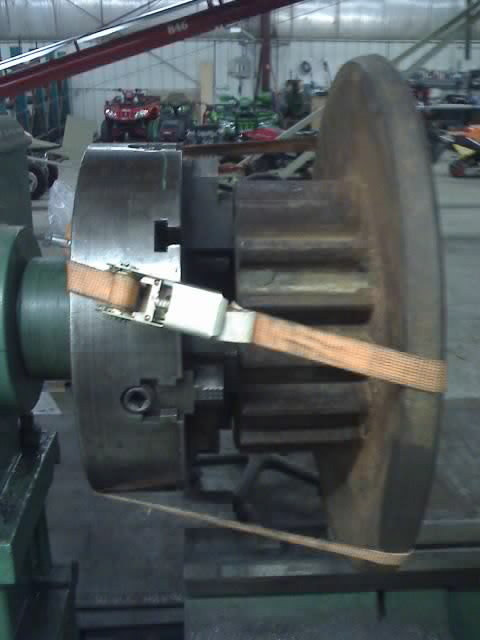 The pile of parts from Garth had a brand new old stock eccentric strap! That was a nice find, and it also had the latest series part number, so it should have all the latest updates too. We measured it up, and it matched the blueprints. Ryan also remachined the eccentric hub back to original dimensions (thanks to blueprints, again) so this should run good! The pedestal (for the block) is off a different engine, so we took a long time to time this thing. I had to keep on dropping the pedestal. 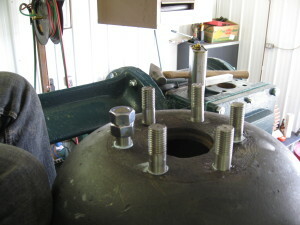 Lee machined a LOT off the pedestal’s base. 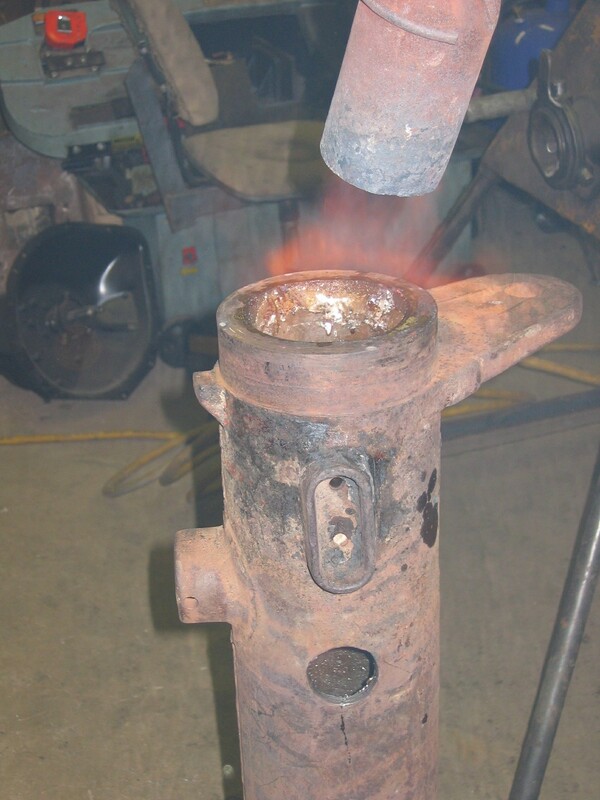 Given how poorly the crankshaft sat in the casting when we poured the main bearings, I’m guessing that it’s just more issues from a mix-match series of parts from various engines. I’m hoping it’ll run well… I’m told that Case (and every company) had a bin full of parts and if one didn’t line up very well, the guys would just go back to the bin and grab another that fits better. We, unfortunately, don’t have that luxury. Spring is coming! 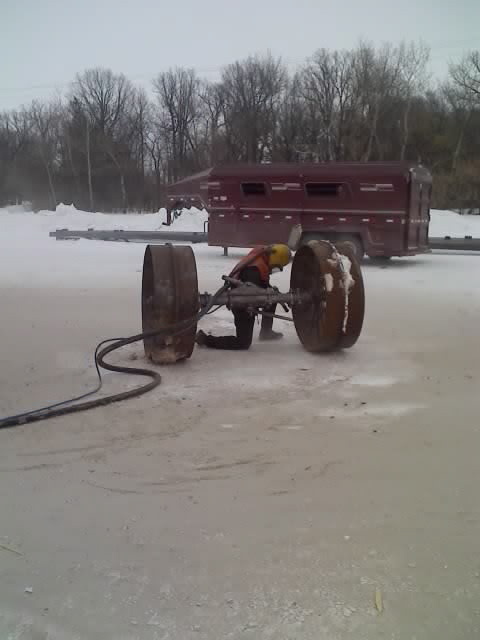 And it’s time to roll it out of the shop. 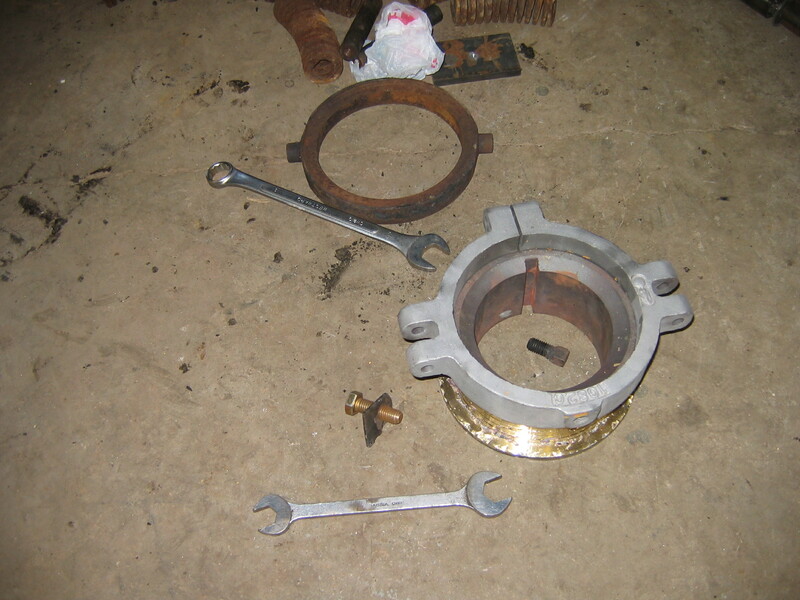 The clutch spider was in good shape, and we machined up a new ring and thrust washers for the actual clutch, to take out more wear and play in the parts. 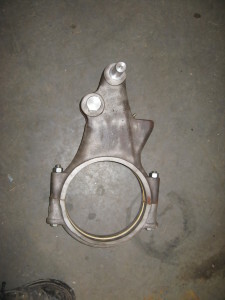 I like my thrust washers and we introduced another between the right-hand bearing and the clutch assembly too. We continue to be impressed with Case’s fine tolerance in precisely locating and drilling holes on these various parts. 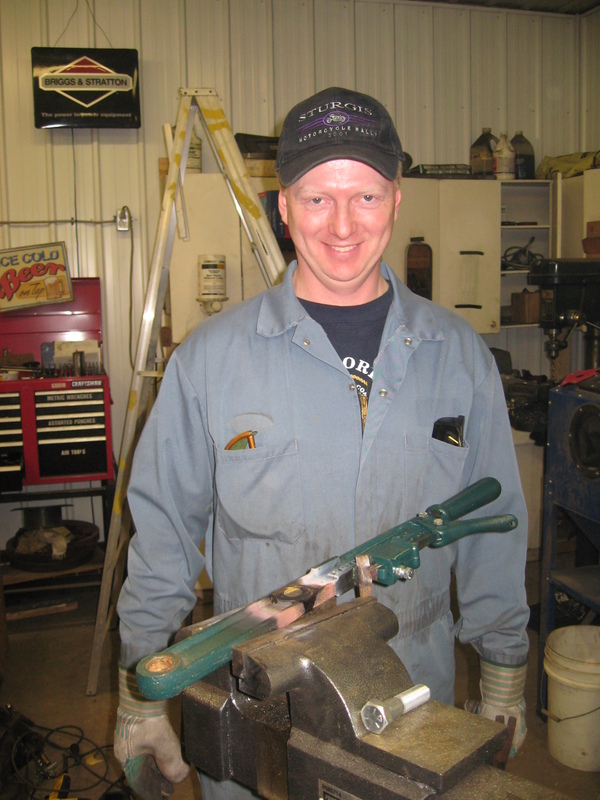 Ryan made up new turnbuckles for the clutch assembly too, and all the parts went together swimmingly. 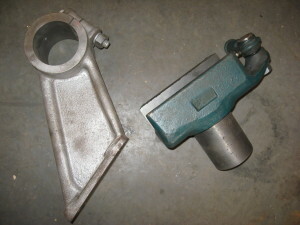 We also needed a new (recast) clutch arm, and that fit nicely as well. Thanks again to Bob M to loan us patterns! Also, with a brand newly machined engine bed, we also wanted brand newly machined crosshead shoes. Ryan came to the rescue here again. Here, you can see more trial fitting before finally pulling apart for painting, marking the end of this work weekend. 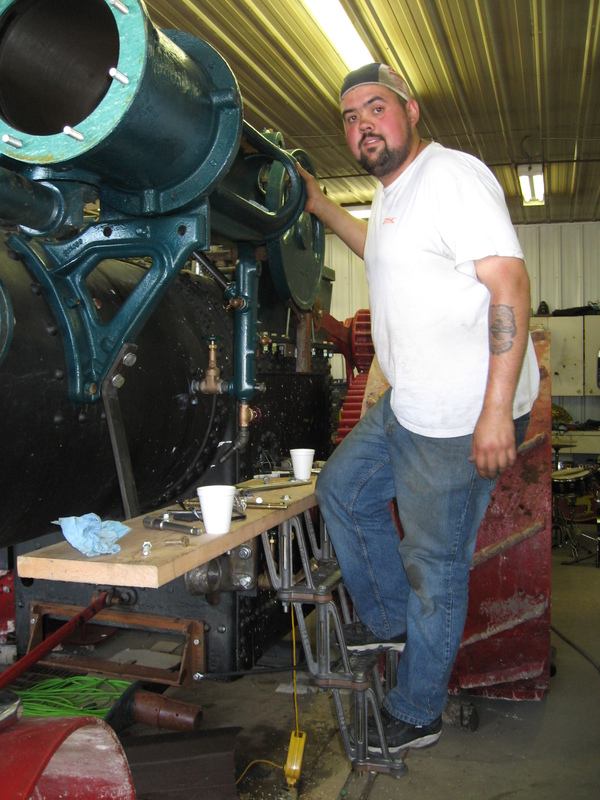 Well, we’re reaching the point where we just cannot do much more work inside the shop, the engine is growing too big! And with spring in full swing, out it came! We finally got to install the top to the governor, the smoke stack, and the flywheel! 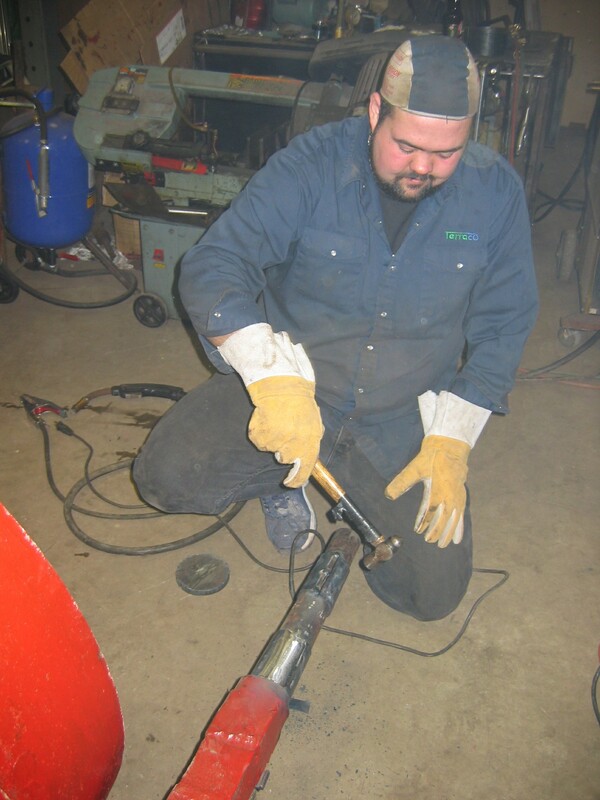 Here, we’re busy bolting on parts. 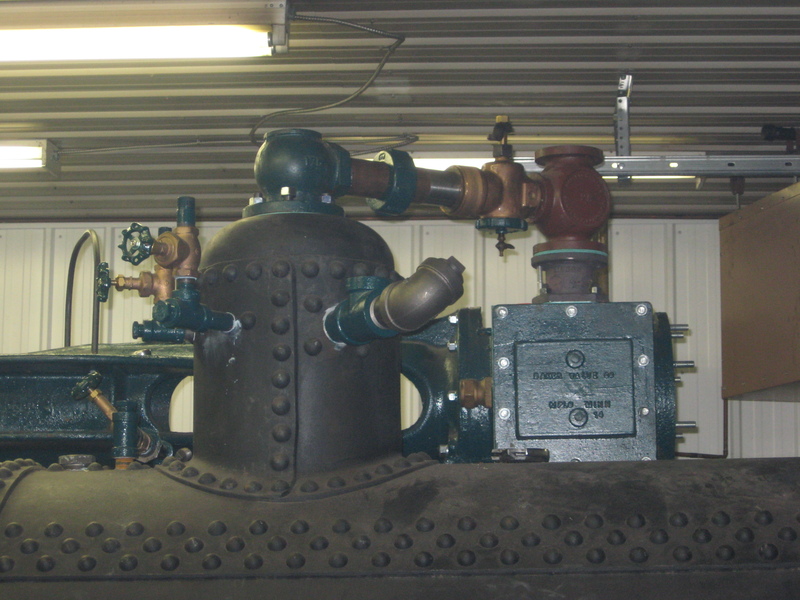 If you look closely, you’ll see another boiler. 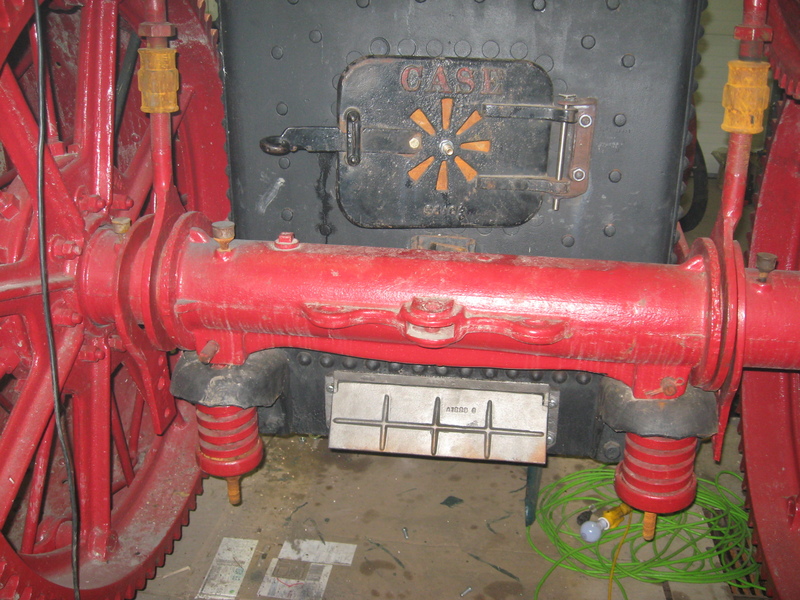 This is a 1910 Case 75 boiler, and it’s the heart of the Bruce-Lee engine! Yep, another project to start as soon as this one completes! You’ll also see other details too, like the steering is now all on, more plumbing, more brass, etc. She’s really starting to look like an engine now! 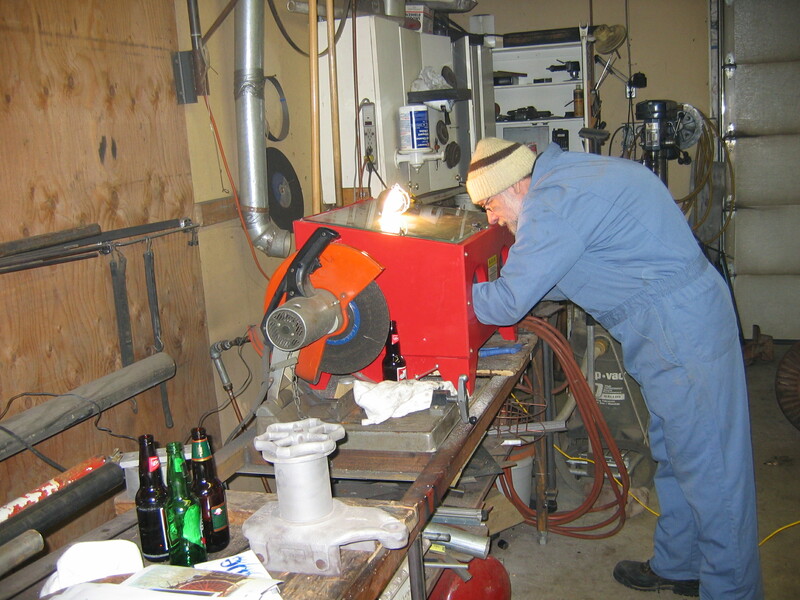 I borrowed Bill’s press, and Doug made up a sheet metal bender a few weeks ago. 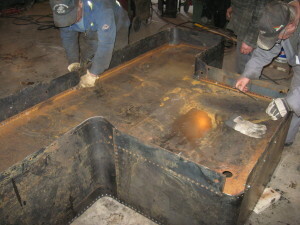 We spent one weekend day a few weeks ago bending up the radiused bends for the tenders. 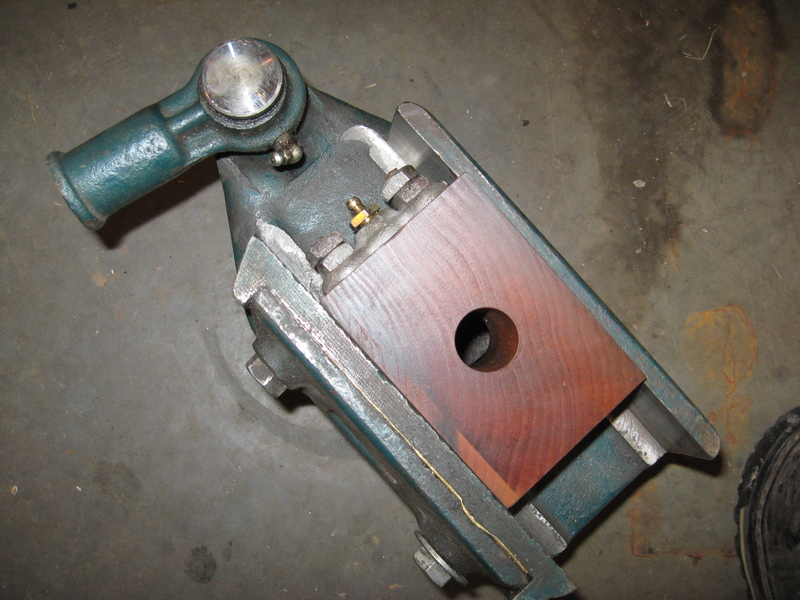 The bender worked great, and we were able to match the blueprints almost exactly. The actual bender looked a bit scabbed together, I as admittedly concerned, but it was adjustable and worked very well. 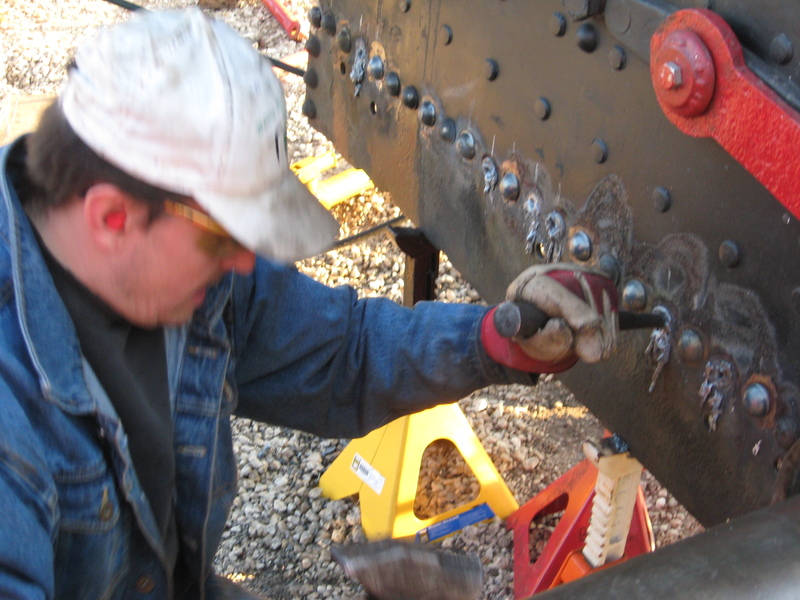 Erron’s work couldn’t be any better for rivet hole placement, fitting, etc. 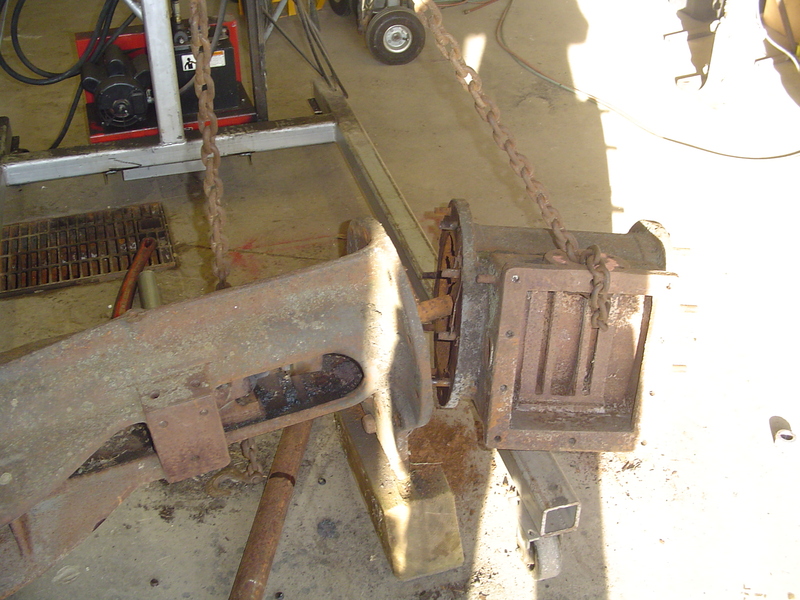 Doug’s bender worked great, and we actually got the bends in the right places. 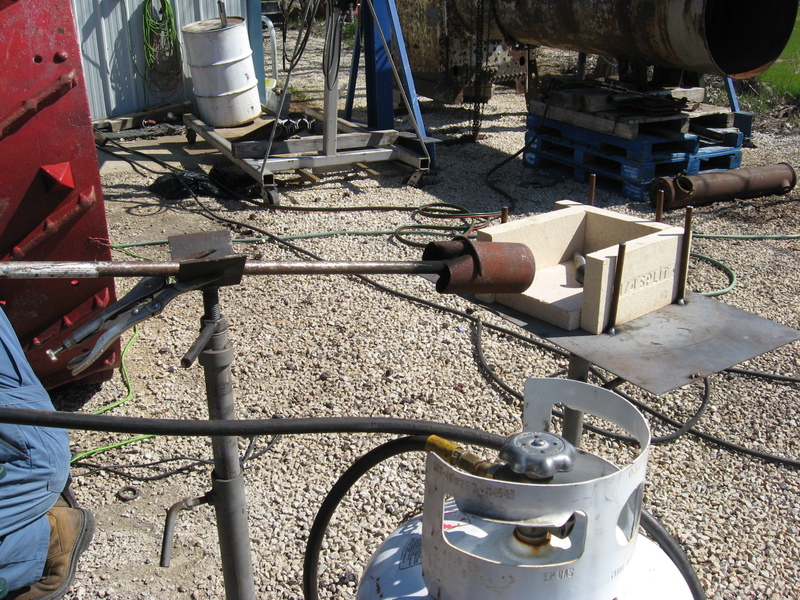 It was a bit of guess-work to decide exactly how the steel would stretch around corners, but I followed Erron’s advice and measurements, and it worked out great. A few edges had to be pulled a bit, but never more than about 1/8″. It couldn’t have gone any better. 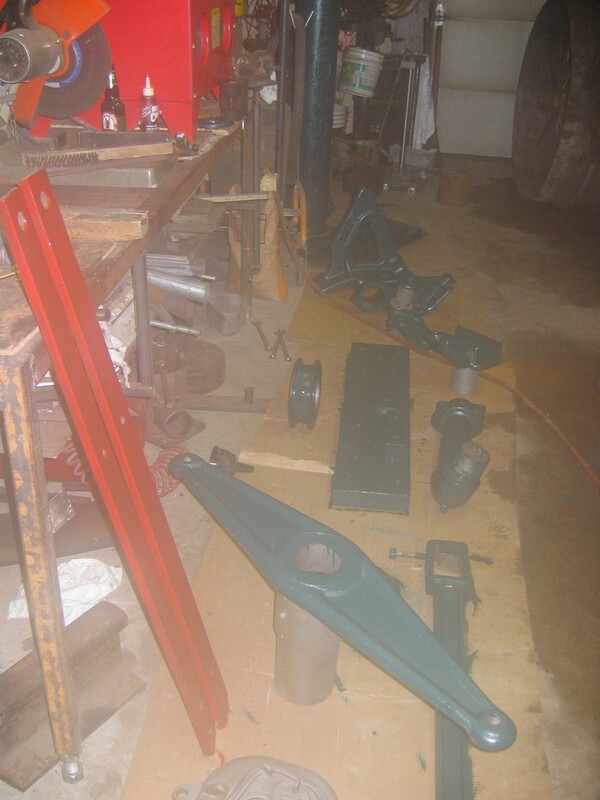 We picked up the paint for the tenders just 3 days ago, so with the parts coming together well, Bruce should be able to paint them pretty soon. The lower cannon doesn’t have much for adjustment. You can shim the wheels in and out, but the cannon is locate on the boiler with a few brackets. The upper cannon has a panhard rod, to keep it properly located. 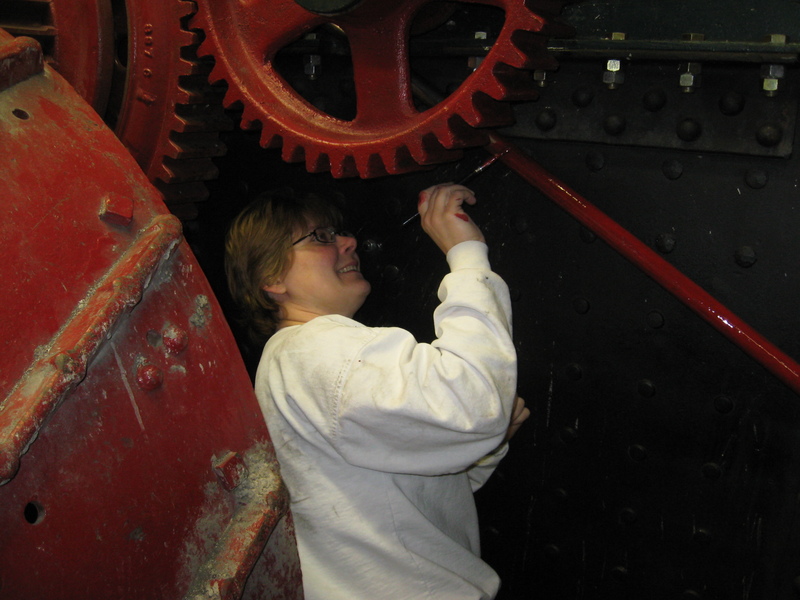 We had already set the shims for correct clearancing for the gears, but we still needed to position the upper cannon so it’s properly centering the pinion gears on the bull gears. I didn’t have a panhard rod, so we cut and fit one to do just that, and the gearing lined up good. This may have been to our advantage, too. If we had an original, we may have had to re-shim the rear wheels. You may recall that we replaced a lot of rivets some time ago. We used grade A-36 rivets which is allowed for new construction. 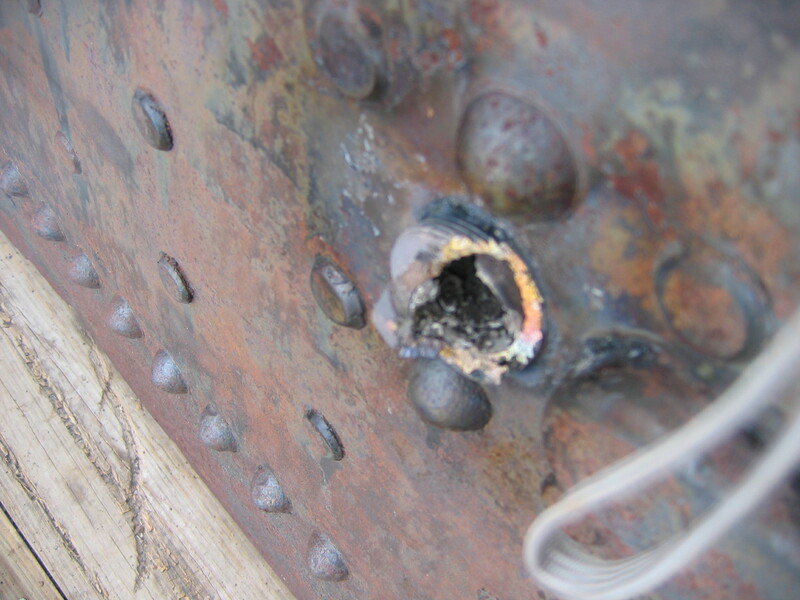 However, grade A-31 rivets are needed for old construction, per NBIC regulations. Our “friendly” neighbourhood inspector veto’d the previously approved work and required that we remove all of the first rivets and replace them with this softer rivet. Joy. Well, this is how this weekend went…same process as before, remove the old, lathe down the new, and install…but this time around an assembled engine, just to make life more interesting. Many thanks to Cliff and Garrett who showed up to help out too. This was no small (or quiet) task… As before, we had an approved repair plan, approved materials, and guys who knew what they were doing. But working around parts and being unable to reposition the boiler made for some interesting challenges (including simply removing some parts!) It sure felt good when it was done, but wow, lots of hard work. I’d like to say that the 2nd job was better than the first, but I don’t know if I can. 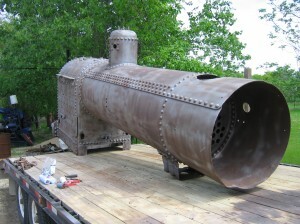 I think it could have been if we could have repositioned the boiler, though. This is the day that we’ve been waiting for! 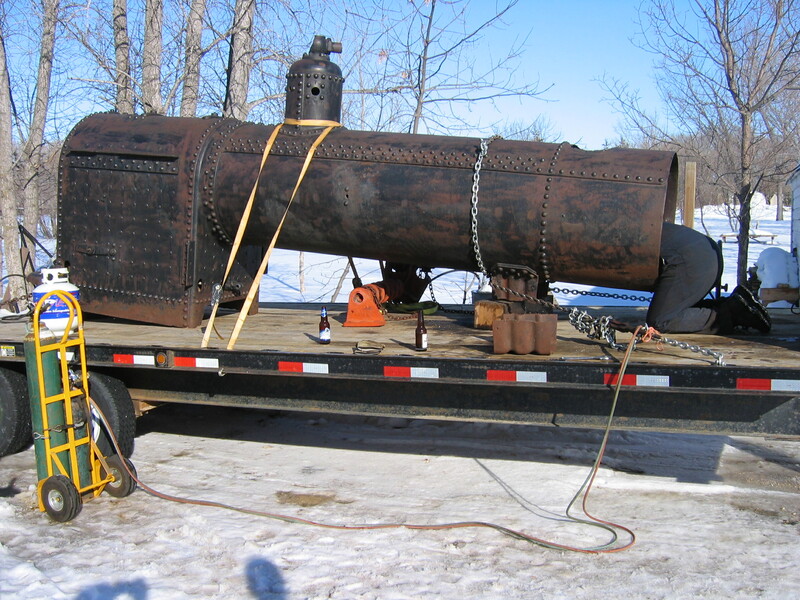 The new rivets are in, it’s out of the shop, it holds water (passes our hydro), we have good UT numbers so we know it’s in good shape, it’s finally time for a fire! 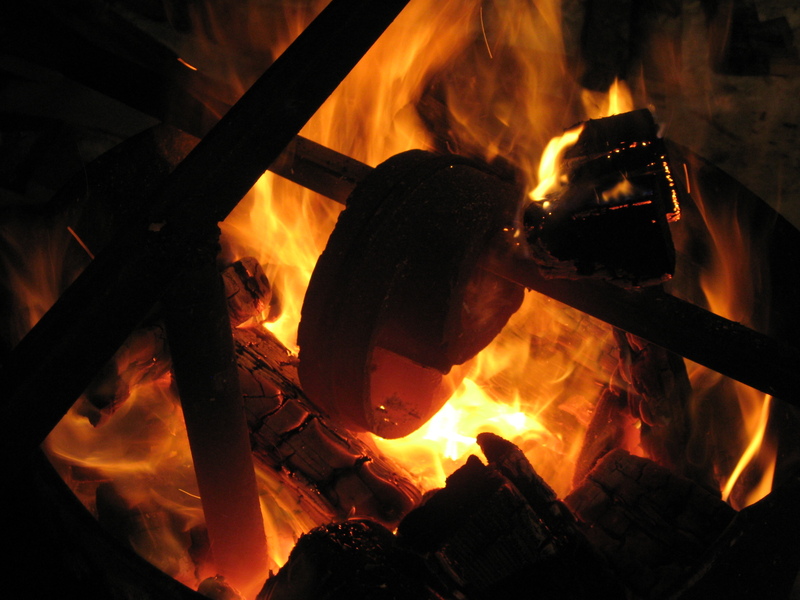 This first fire actually took place at night. 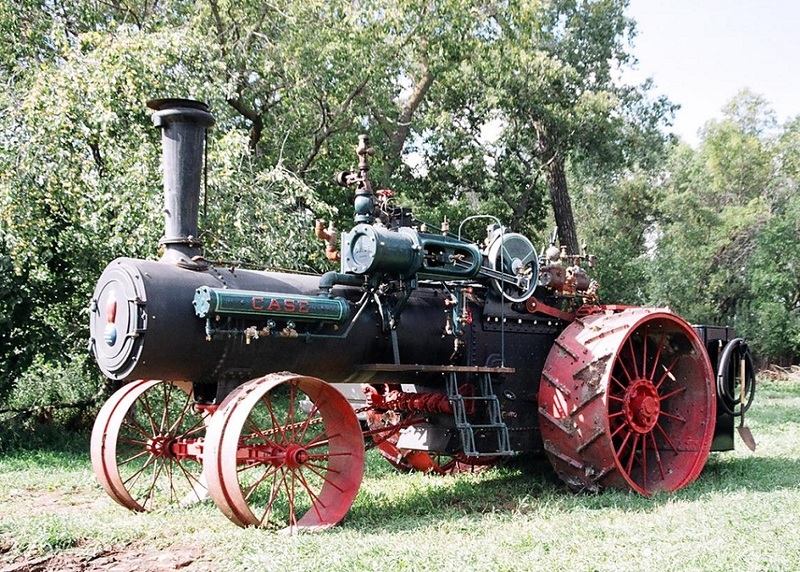 It’s kinda set a tone for the life of the engine to date…it’s probably been under fire as often, if not more often, in the dark, than during the day! That was a very long, great evening! This is years of hard work coming to a head, and wow, it was worth it! We got Bruce in trouble that night, but, well, those things happen. I doubt that the trains have heard a whistle respond to their horns when travelling through Elie for decades, though! It moves on its own too! We learned a lot here, but we also were pretty happy with how things came together. This is the first engine that I fully timed, much less set up and lined up from scratch, then timed, and with a Baker valve, not the factory D valve! She ran smooth and even! We spent a day tinkering and tuning, and simply enjoying what we’ve accomplished. To give you an idea of this project’s magnitude, the beer budget to date, alone, is approaching $1500! It’s been a few weeks since my last post, but we’ve been busy. The Austin show is coming up, but it’s time to spent a few more hours in Elie. Garrett came out to help us too, and he was a big asset in getting the brand new tenders installed. To say that I’m happy with the tenders would be an understatement! 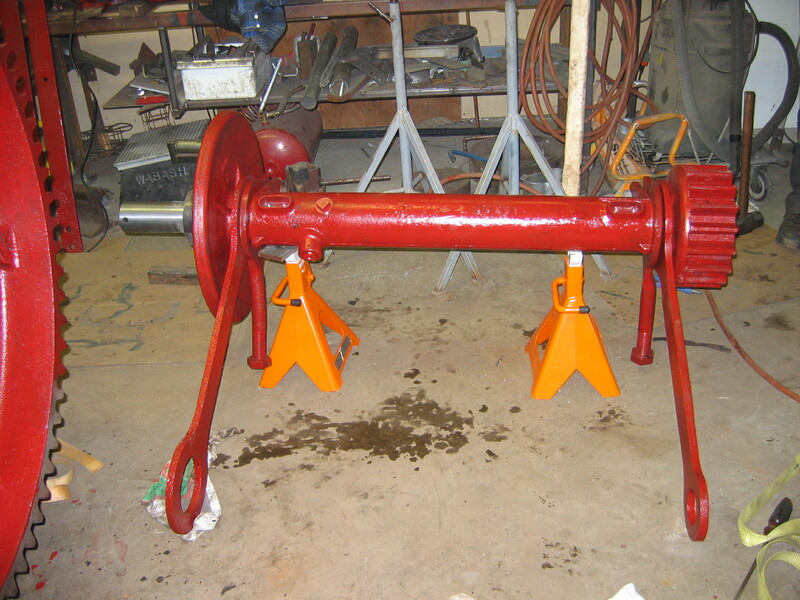 The frame, and tenders had never been fitted to the rear axle assembly until today, with it all freshly painted and ready to go. And while the fit was a bit tight, it went very well. Erron’s work on CAD’ing the drawings sure paid off! 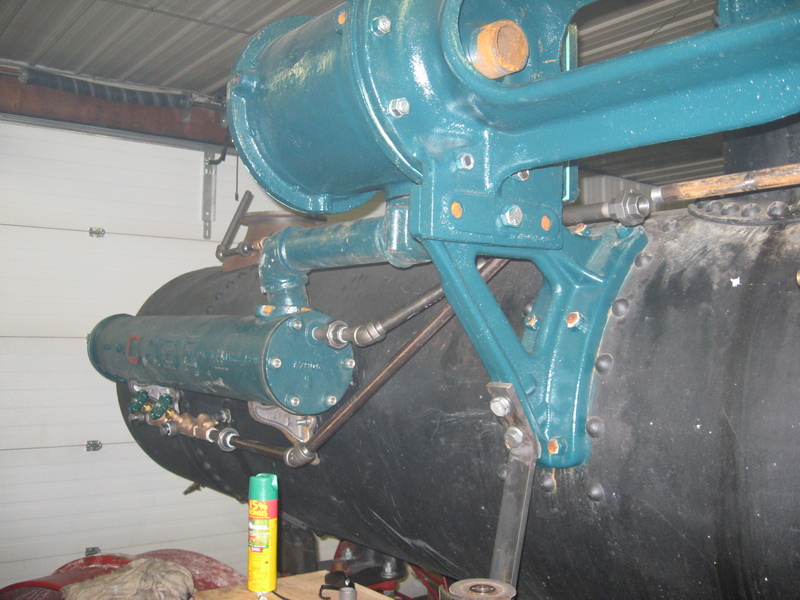 You can see here, that we also installed an ejector. I didn’t have the correct size, this is a bit smaller than what it’s supposed to be, but it still works well and is a nice feature. 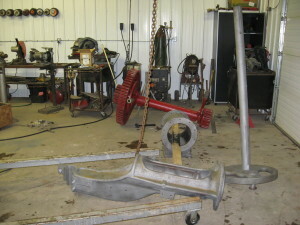 We also installed the Marsh “C” pump that I had purchased from Jim @ Larson Welding. 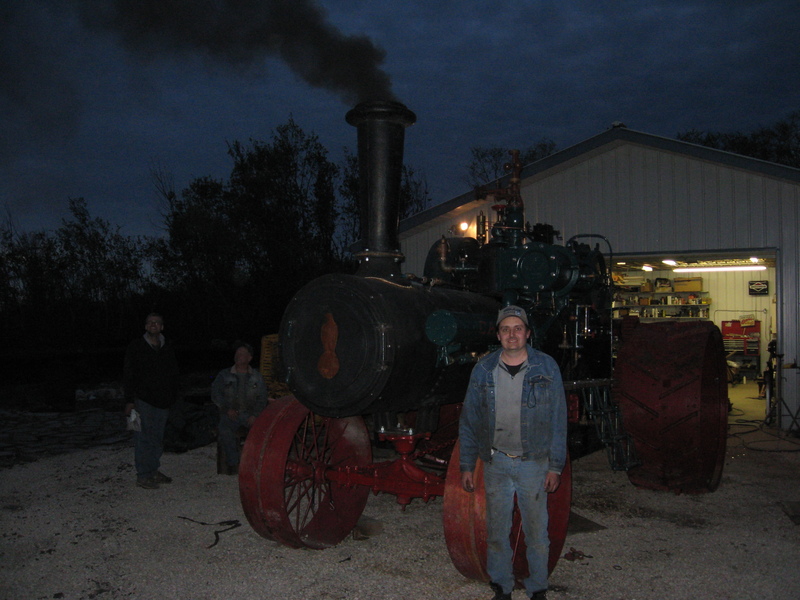 Jim also rebuilt it and I was pretty happy with this extra feature – it helps “finish” off the restoration, as not all engines have one. 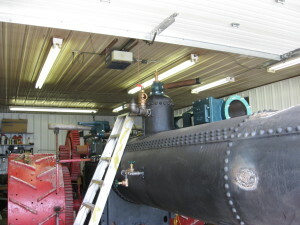 And with the pump, I now have 3 ways of getting water into the boiler (2 injectors as well)! 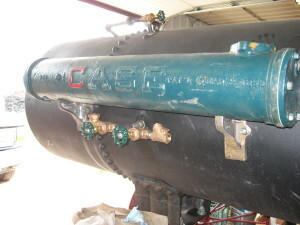 Boiler code requires 2. Well, another year of Austin is starting to wrap up. 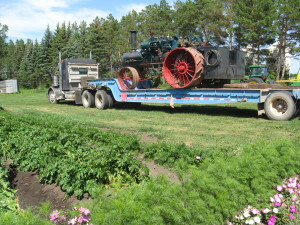 We hauled the steamer to the Museum first (thanks Lynn and Andrew!). The plan/hope is that the Chief Inspector would authorize its operation. 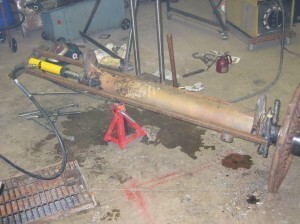 Given the work done (re-riveting, multiple NDE’s, etc. ), he indicated that I would likely be able to run it there, but after various left messages to him, he left me a voicemail reneging on that agreement – when we were en route to the Museum! 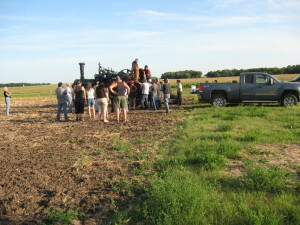 Well, we didn’t run it at the Museum, but we did take it to the farm and invite a few steamer friends out for a bit of fun. 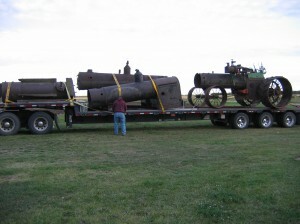 A few parts seem to have stiffened up during the transport. It steers harder than it did. The levers were also still stiff, but hey, it’s brand new! 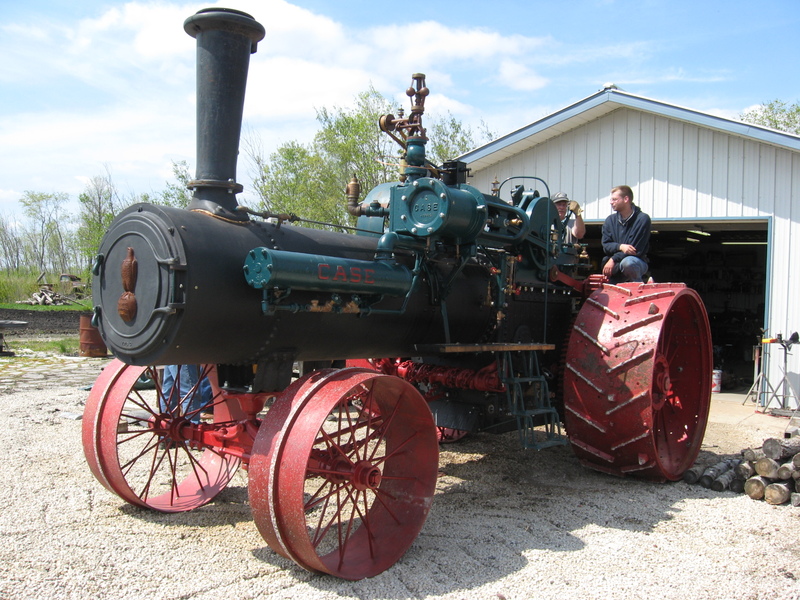 All in all, lots of people took it for a short spin, the engine ran very well (this was the first time it did anything other than move 150 feet forward and back on Lee’s driveway! 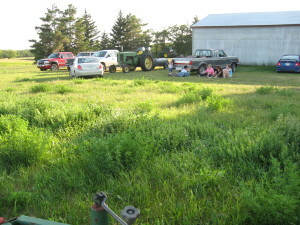 ), and smiles were had by all. I kept water in it for the summer, and we steamed it up a few more times. It’s starting to break in a bit, and seems to run well, even at low pressures. Time for some more detail work, though. Thanks to Jalisa for helping out here, painting the pinstriping, and for Shane to help me get the stickers on nice and straight! If you look closely, you can see that the eagle on the front door is also now painted. I asked Dad and he was happy to oblige. 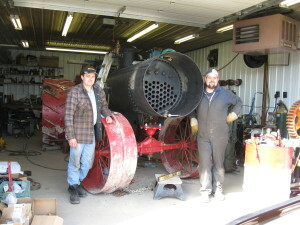 Another good day, Travis and Bruce showed up and we had an impromptu fire-up and a few tweaks (the steering chains were getting a bit loose) and even Art (our neighbour) got involved by finding us something to pull! 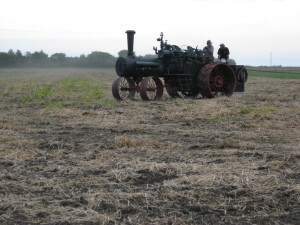 The engine did’t have much trouble with the cultivator, but it did use a fair bit of steam, and we also used up a lot of wood – enough that we had to go back to the yard and get more! The cultivator also wouldn’t trip in the soft soil, so we had to pull around the corner, in the ground, at the end of the field. 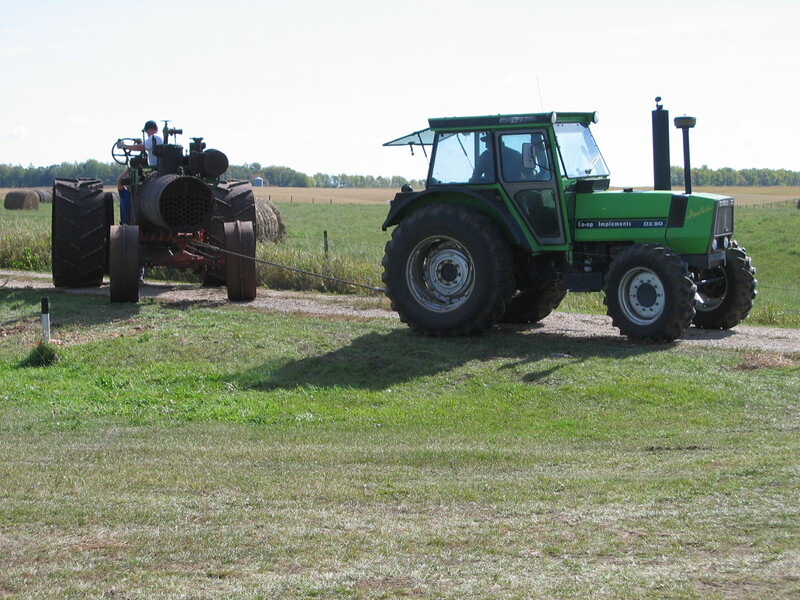 With the drawbar so high, we had severe understeer, but it worked! 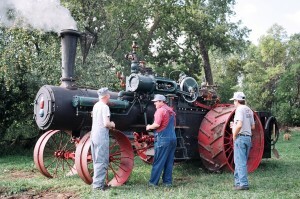 The engine has been running well. We are still working out a few kinks, but the general assembly of it has been left unchanged. I finally got to another little accessory for it – a headlamp! More learning, and help from Garth and Denise, but it works nicely! I just now have to figure out how it’s supposed to be properly mounted! I’ve been happy with the engine mostly, but I’ve had a nagging suspicion that something still wasn’t quite right – the engine would prime a lot, and not under load, and not with high water. Well, after talking to a few people and taking some measurements, I went looking at the eccentric strap. 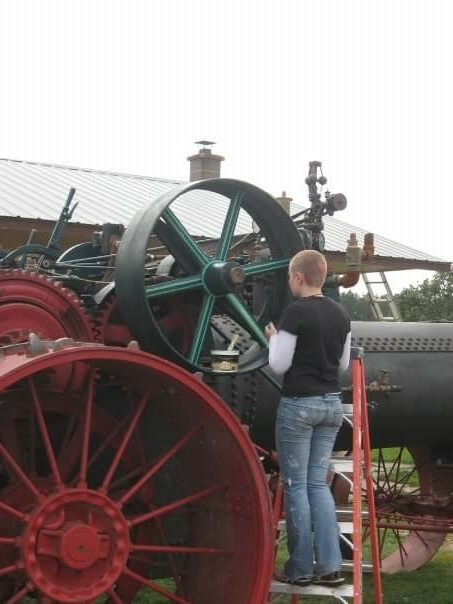 If you recall, we had a new-old-stock strap that we put on the engine, but we also had to shave a lot off the base of the pedestal to time it. I wrote a computer program to simulate the valve travel, and it was clear that it wasn’t running evenly. I took some measurements off the Case 75’s at the Museum, and changed the program to model that valve travel and suddenly things were a whole lot more even. So, I clearly had the wrong strap! I had an early design strap with the last part number for it! Well, back to my spare parts pile! I couldn’t find what I needed – I don’t have another complete strap! But what I did have, was the correct top, and a different bottom half, and I have friends who are machinists! 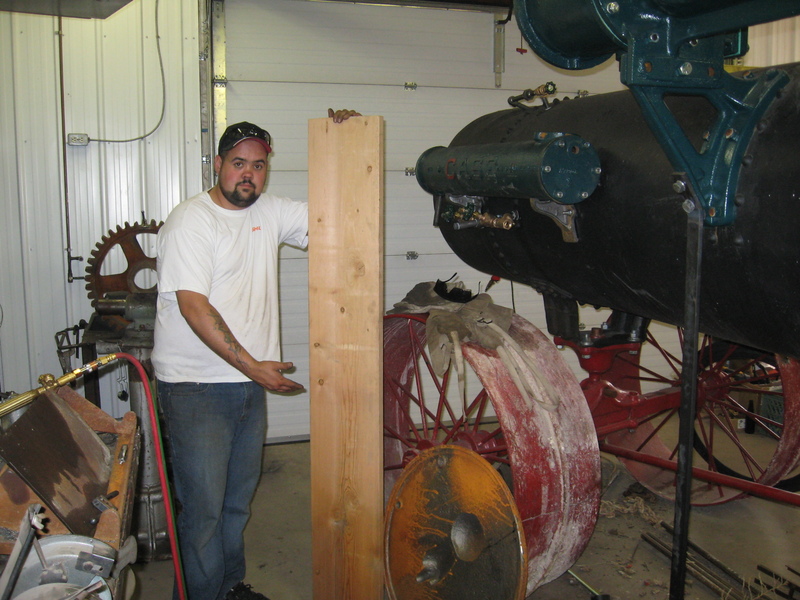 We cast up a new pedestal, cleaned up the slide for the block, and made up a new block of wood for the coming season. You can see from the pictures that the pins were offset quite a bit. 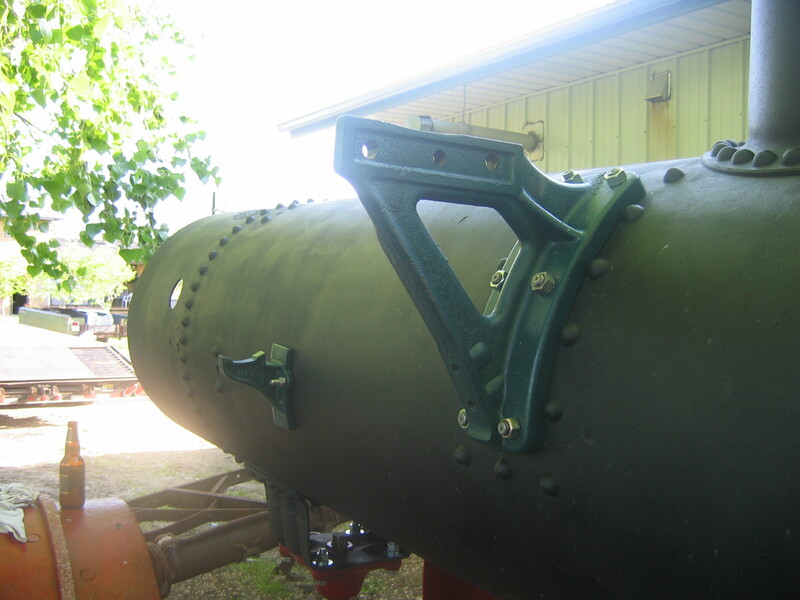 Well, this strap did have wear in it, and to return it to factory blueprint dimensions, Ryan had to bore the holes as shown. I’m a bit concerned about how thin the casting is around the top, but Ryan wasn’t. Ryan always does great work, and I’ve never had reason to question his judgement. I finally got to another task – there should be spring material under the clasp for the quadrant lever, and this wasn’t there (broken). Garth helped me out again, and we put in new spring material. 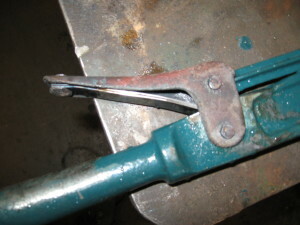 This minor change has taken out a rattle in this lever. 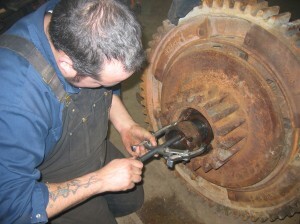 Garth also made up a new pin for it, to take out another small clunk. 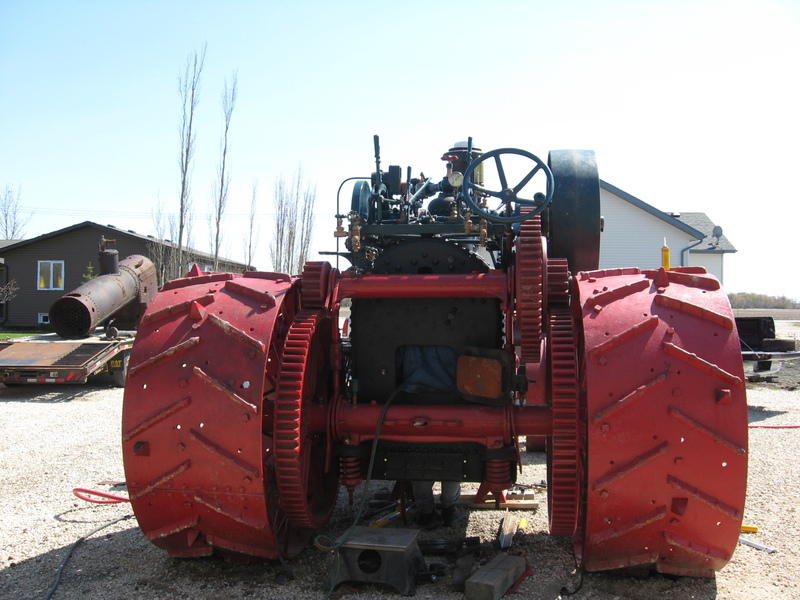 It’s been a while since I made an entry – well the engine is running very well! 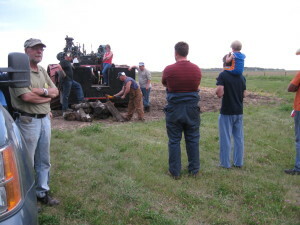 We’ve taken it plowing, and I’ve been watching and listening to it. I found that I was missing a brace that holds the hitch links together, and when pulling the plow, the links want to spread apart. Here, I’ve just installed this rod to keep it together. Another year has passed. As a quick update, Clyde helped me re-time the engine. I thought that it would have been trivial when changing the eccentric strap, but he also adjusted the eccentric hub. The steam and fuel consumption has dropped a lot, and she’s breaking in nicely. The engine is also now certified in Manitoba for operation! 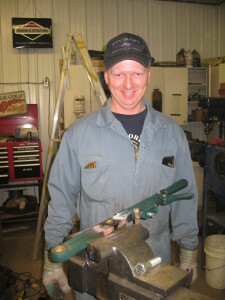 Dave performed the NDE and it’s certified for 140psi! That’s more than I had ever expected, but it helps when you have a trained expert performing the NDE, using good high-end equipment. We’ve also dyno’d it too, and the engine makes 100hp! 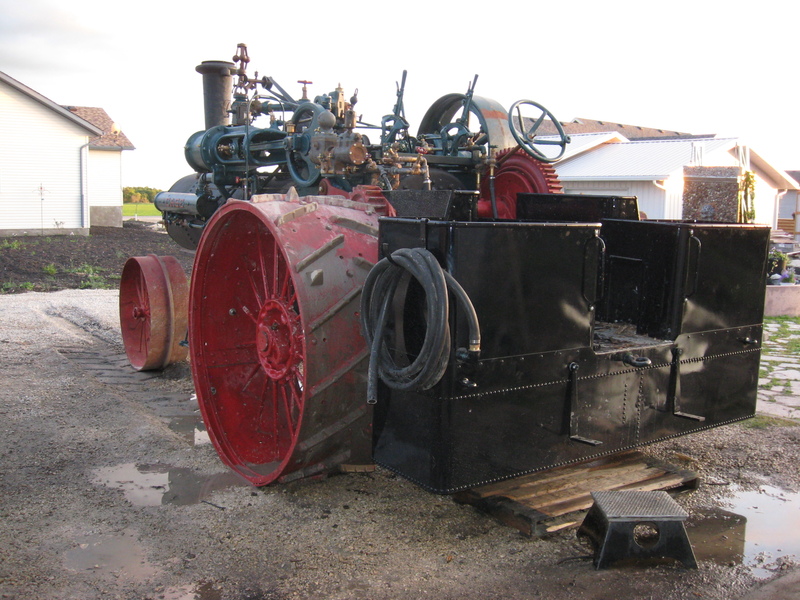 I won’t dyno it that hard again – we now know what it’ll do – but it’s broken in now, runs great, and Gery and I are very happy with how this engine has turned into a good, strong workhorse! I think this will be the last entry in my blog here. She may have started out crooked, but she’s a whole lot straighter now! I consider the project basically done, and we should only have to worry about inspections, maintenance, and repairs, no new “restoration” aspects to this project! There’s still a short list of to-do’s (including finishing pinstriping her), but that stuff will happen when there’s time. 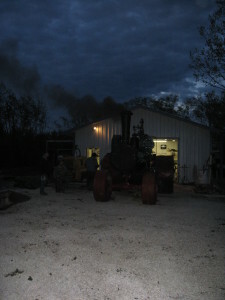 Here’s a parting shot of it putting on a spark show at the Austin Museum one evening. 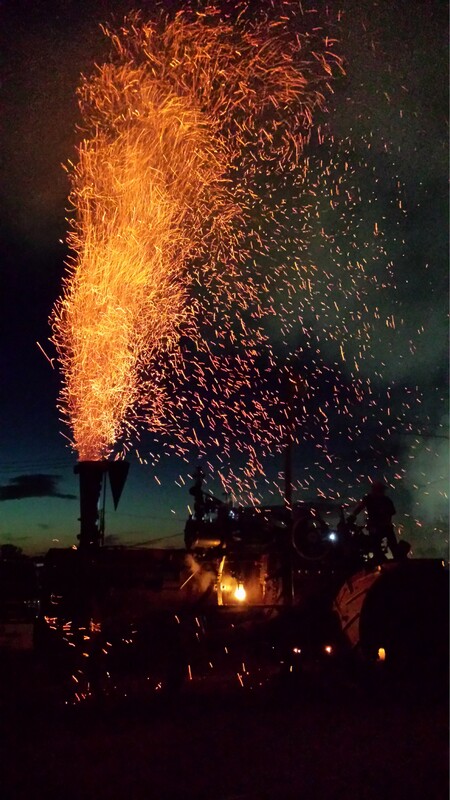 Everybody loved the show, how it was thundering, and just running great in general! Well, I thought I was done with entries here, but I guess not. 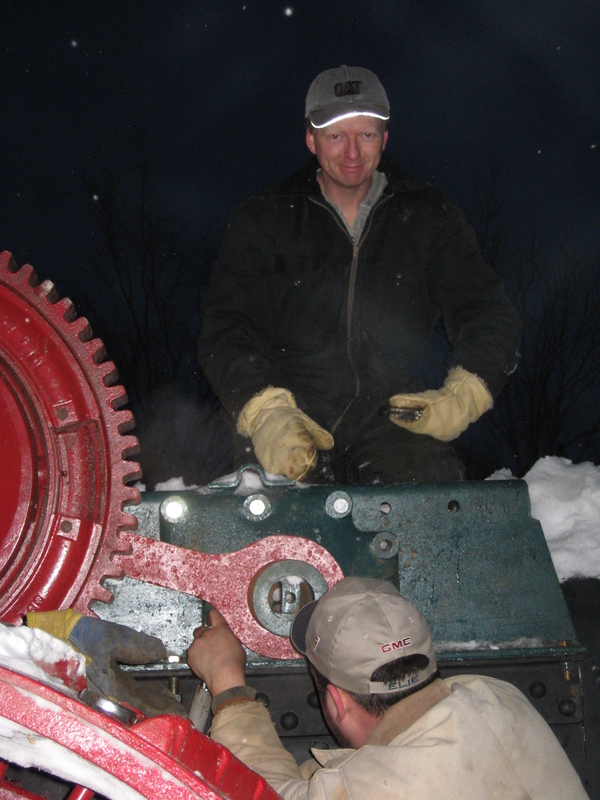 We had originally poured babbit into the intermediate gear (Garrett helped out here, thanks man). Some guys told me that was the right thing to do. 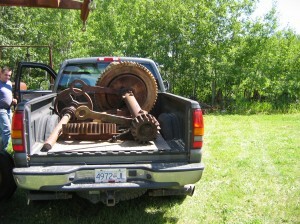 It was originally iron on iron, but the gear had been intentionally bored out. Well, we’ve found out that babbit was the wrong material. After a few years of operation, we had about 1/8″ of wear on that babbit, which simply isn’t a good thing to have because it’s ruining the gear mesh. 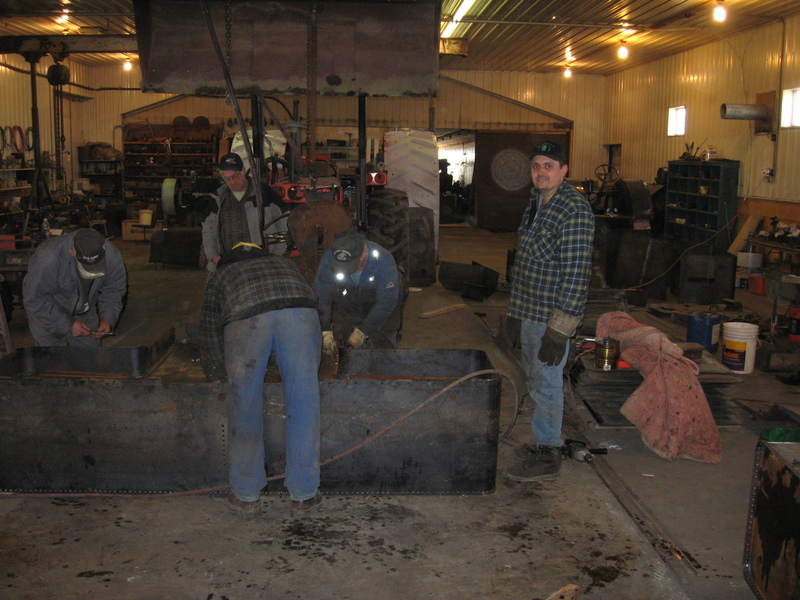 Gery and Dennis got the gear off the engine, and Ryan bored it out and put in bronze bushing material. 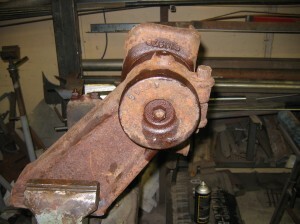 Ryan also cleaned up the bracket bearing surface, so hopefully this repair will work. Gery and Dennis also re-installed it, as I’m in Alberta. 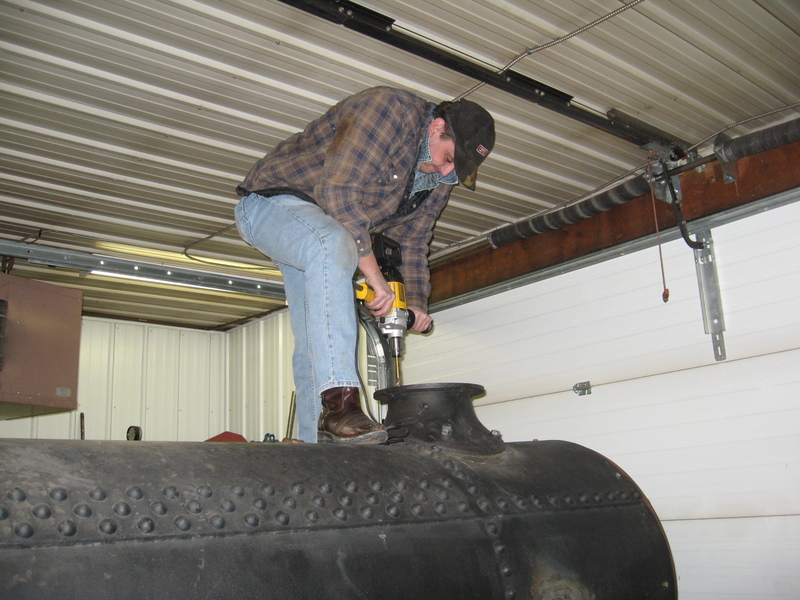 We’ve been using a borrowed (from Murray) lubricator for a few years. 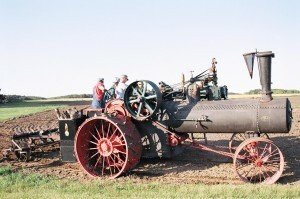 I had purchased one for this engine but we couldn’t get it to work right. 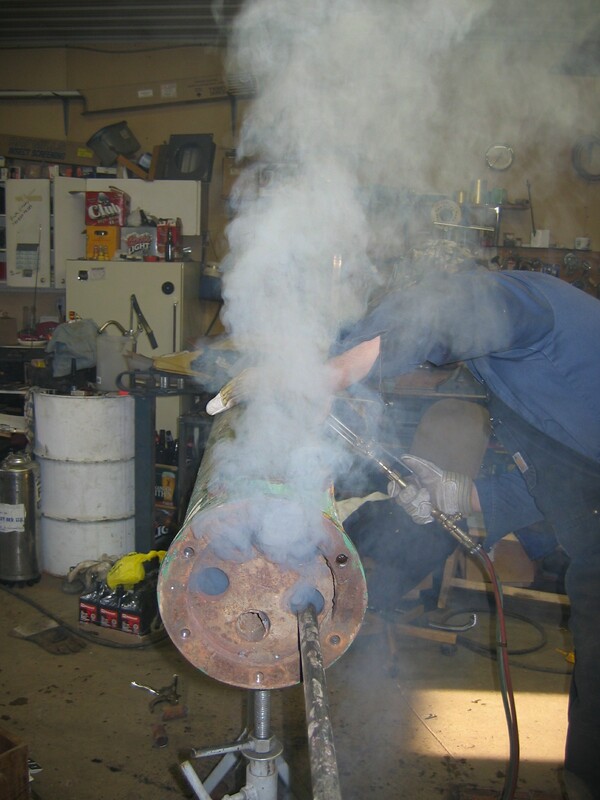 It’d pump under atmospheric pressure, but not against steam pressure. I tried a different check valve, and that hadn’t helped either. Lee had originally serviced it, and Doug had thought it should be okay, but it wasn’t. 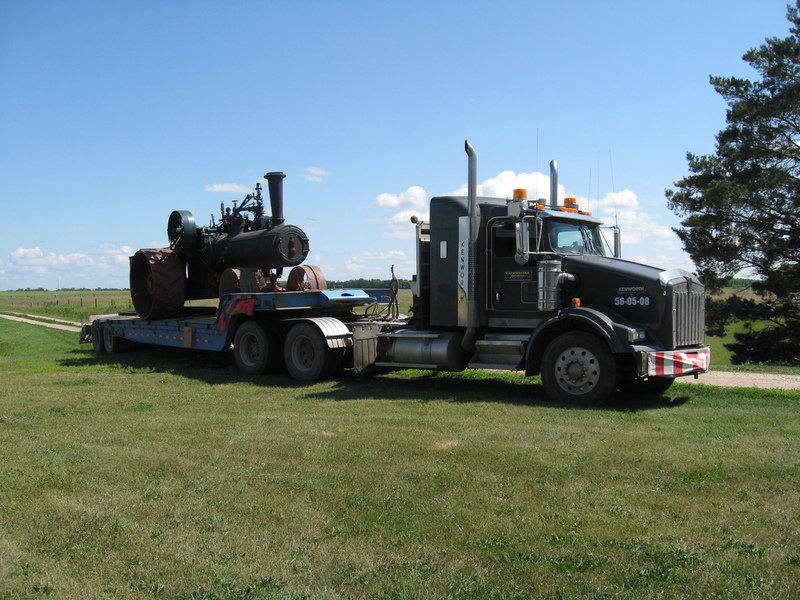 I wanted to get the borrowed lubricator back to Murray, so I sent mine back east to Ben. Well, it’s fixed now, good for at least 250psi! 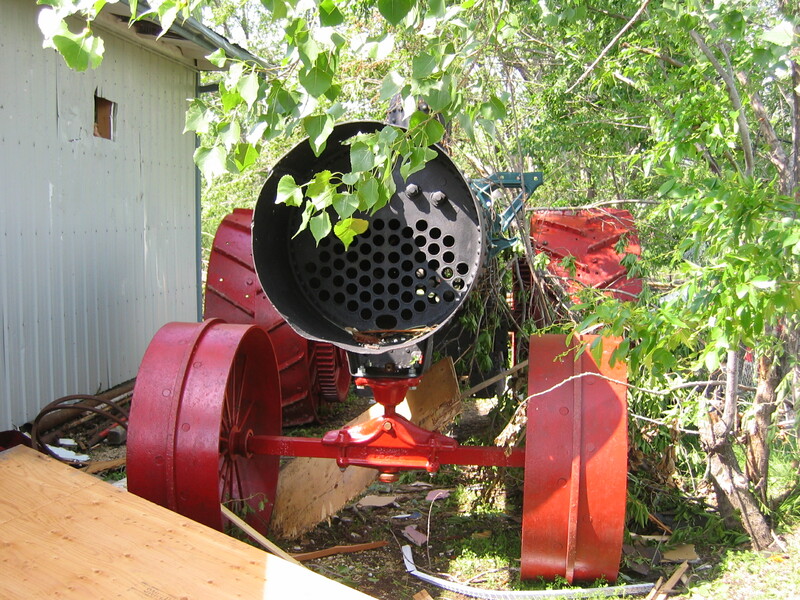 2 Responses to Twister: the Case of the Crooked Steamer! Thanks for a detailed narrative . I thoroughly enjoyed reading and looking at the good photos.